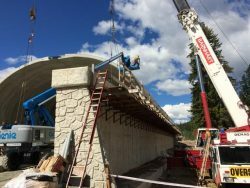 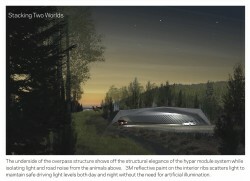 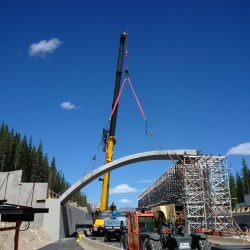 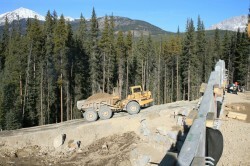 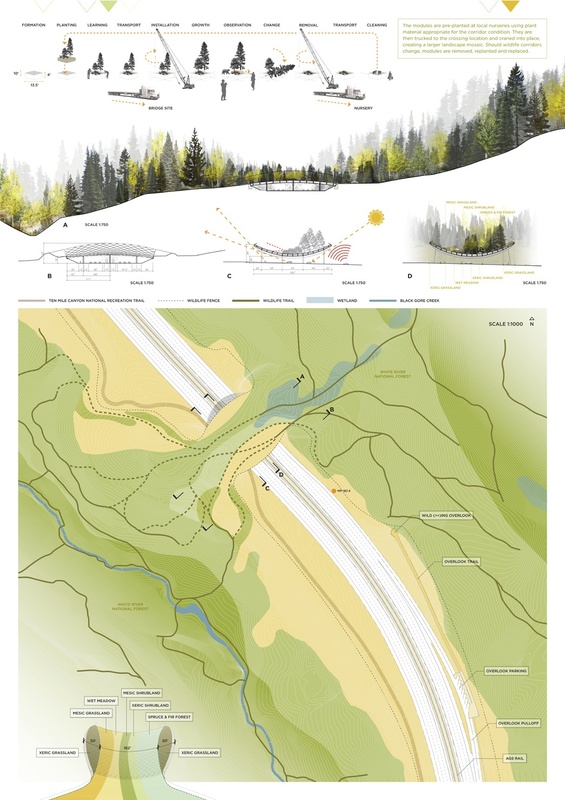 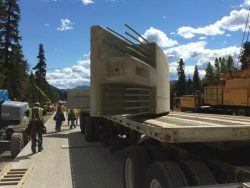 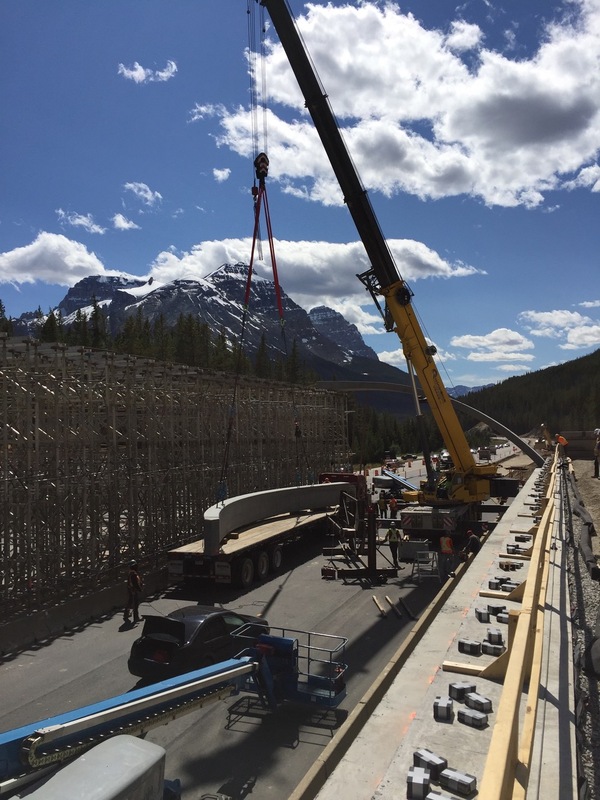 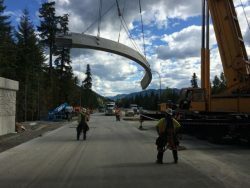 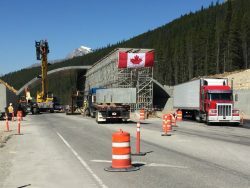 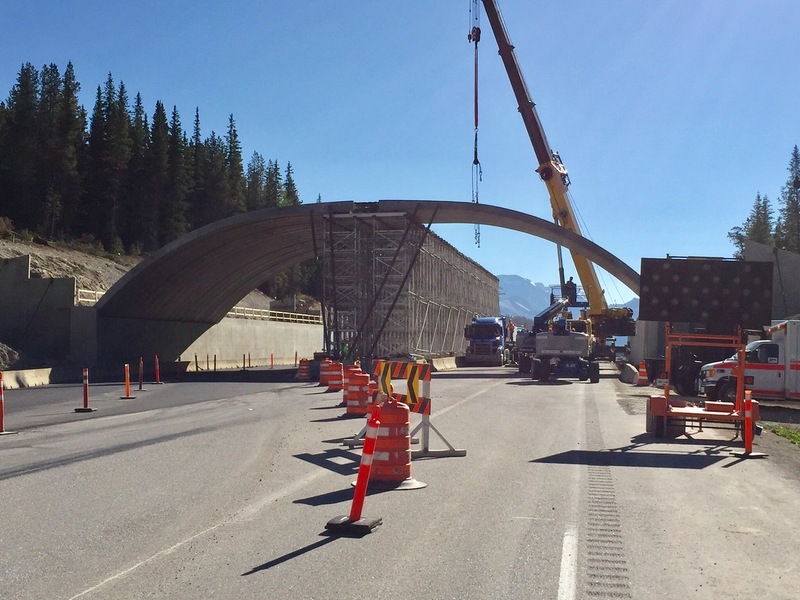 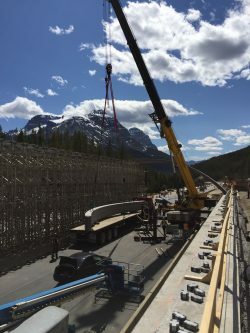 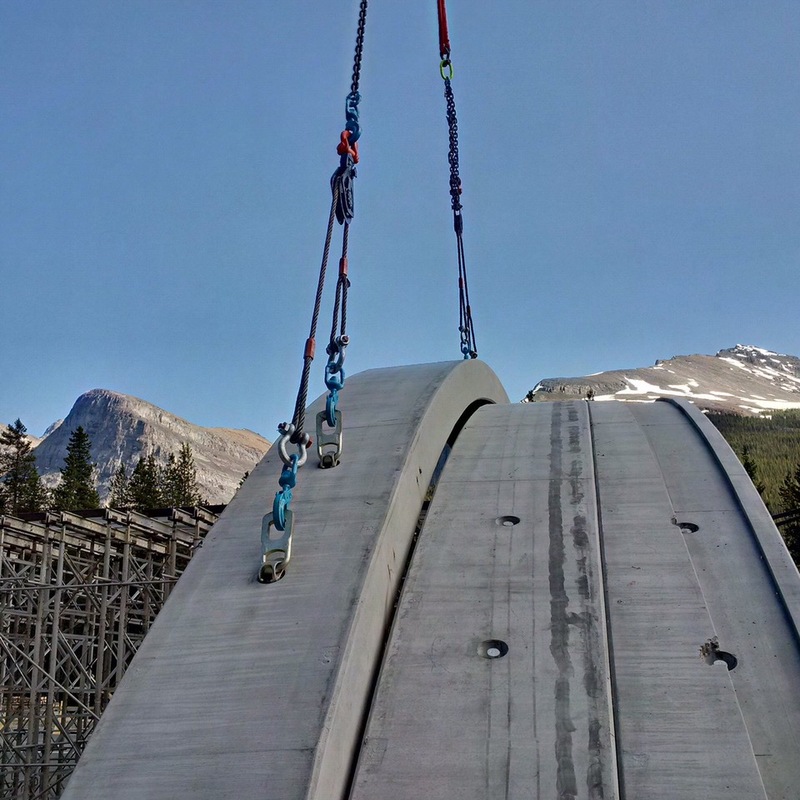 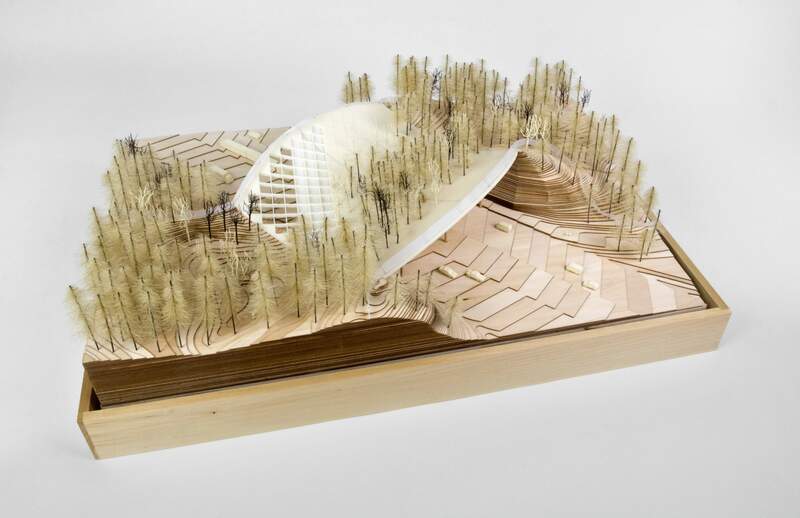 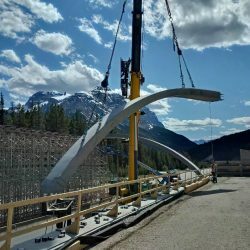 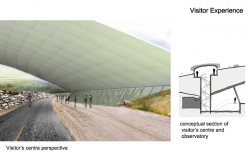 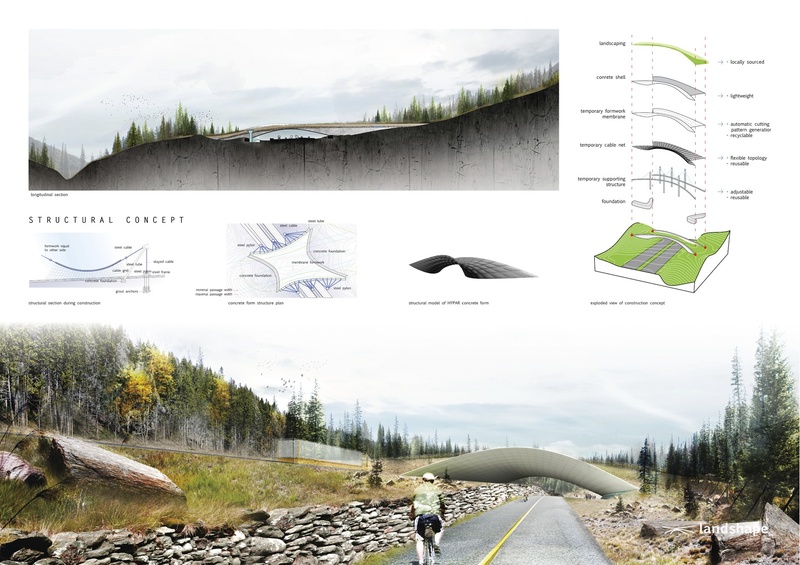 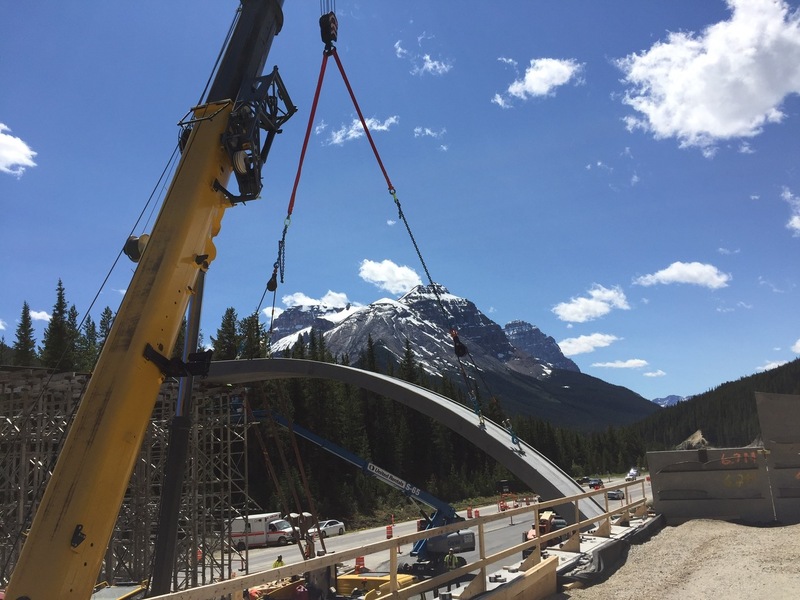 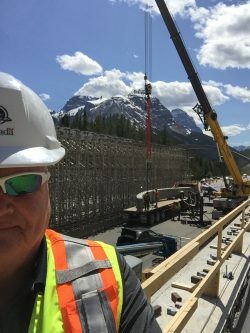 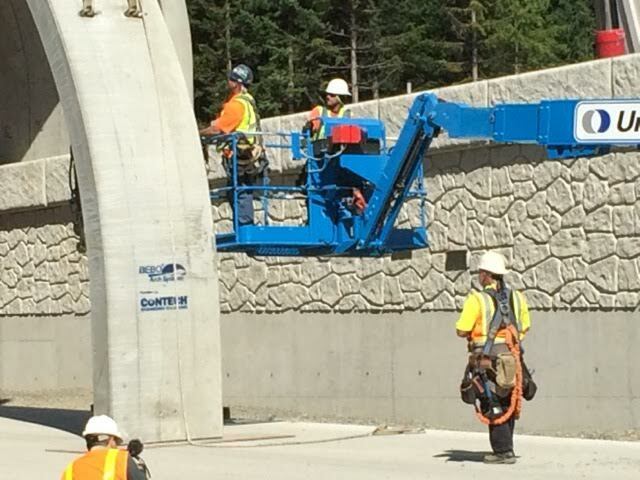 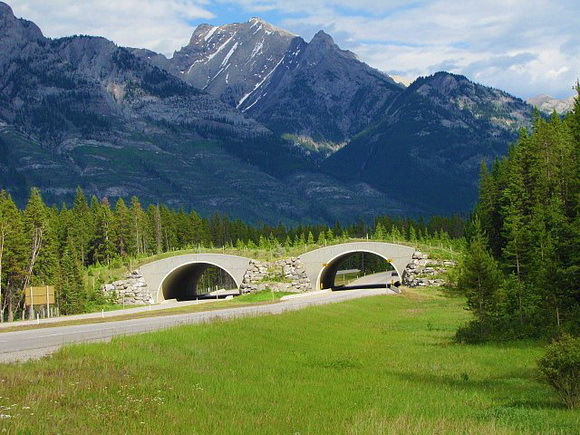 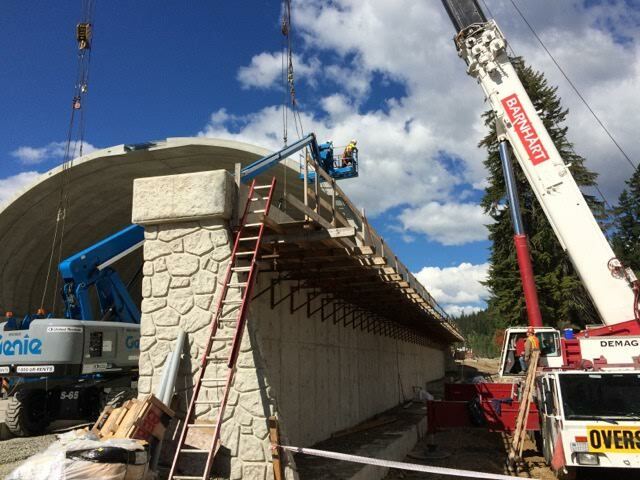 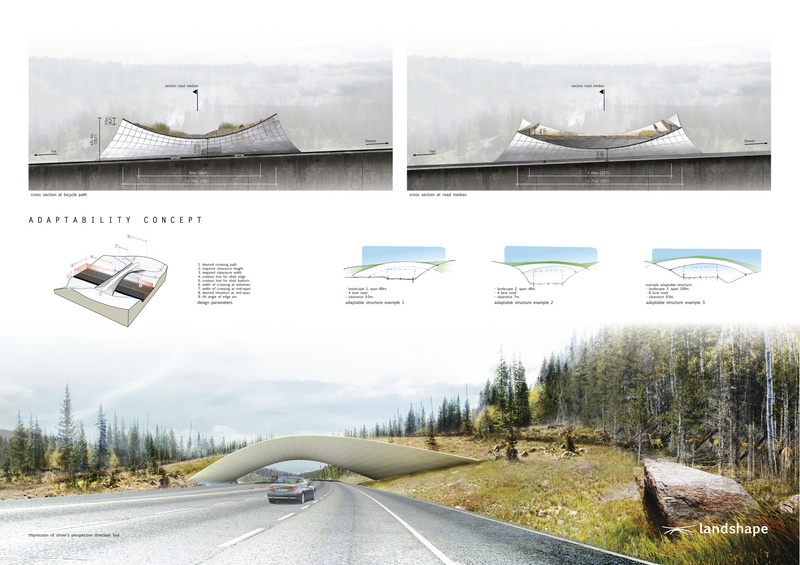 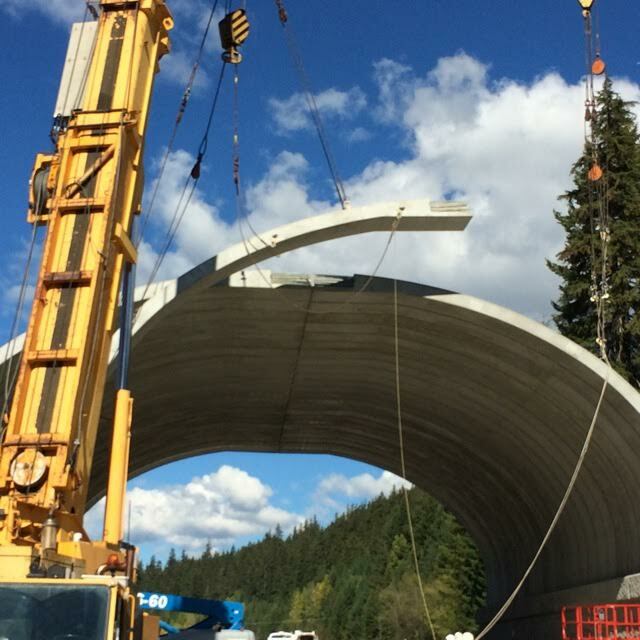 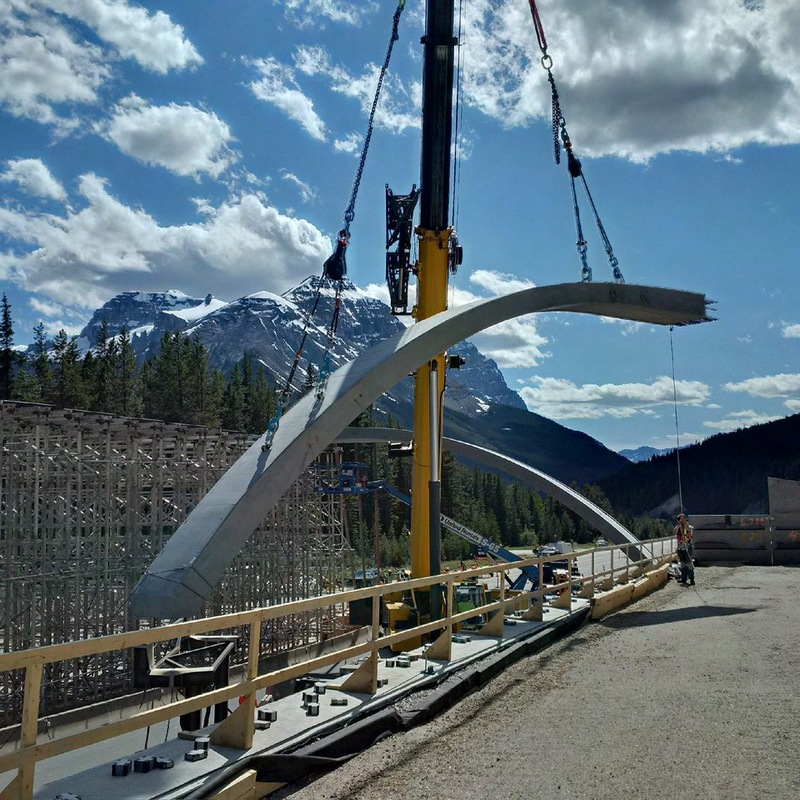 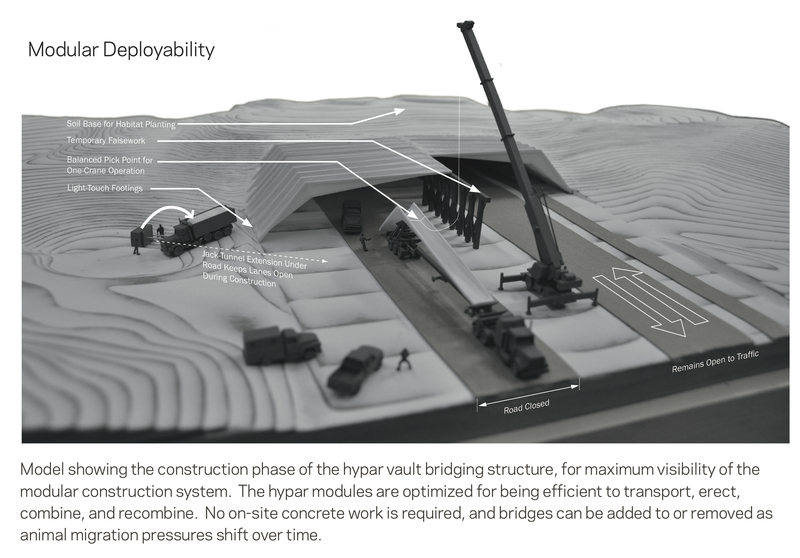 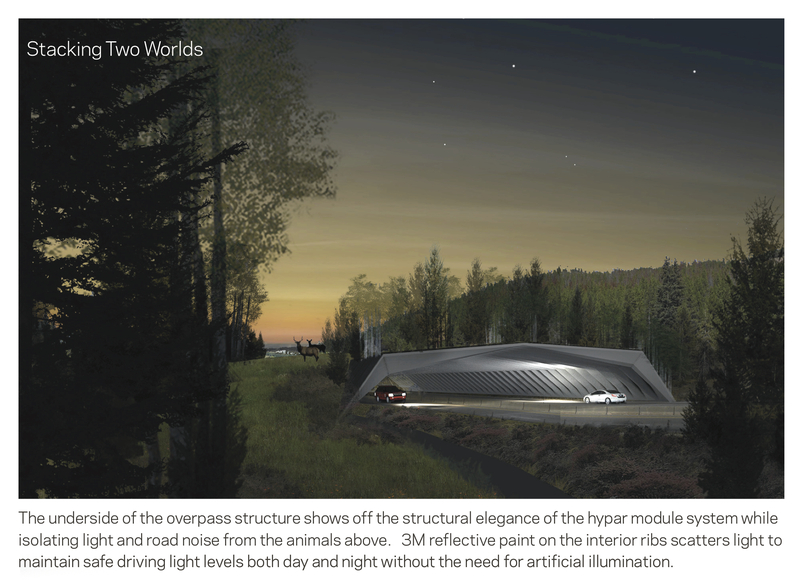 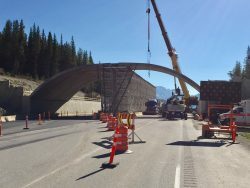 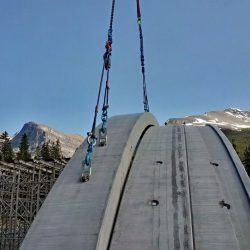 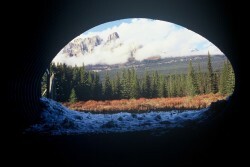 Parks Canada is constructing a wildlife overpass structure on the Trans-Canada Highway (TCH) as it passes through Yoho National Park. 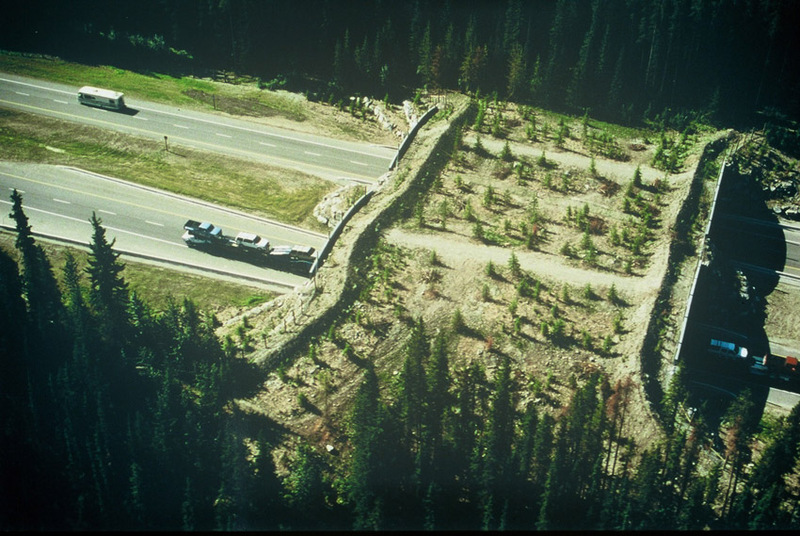 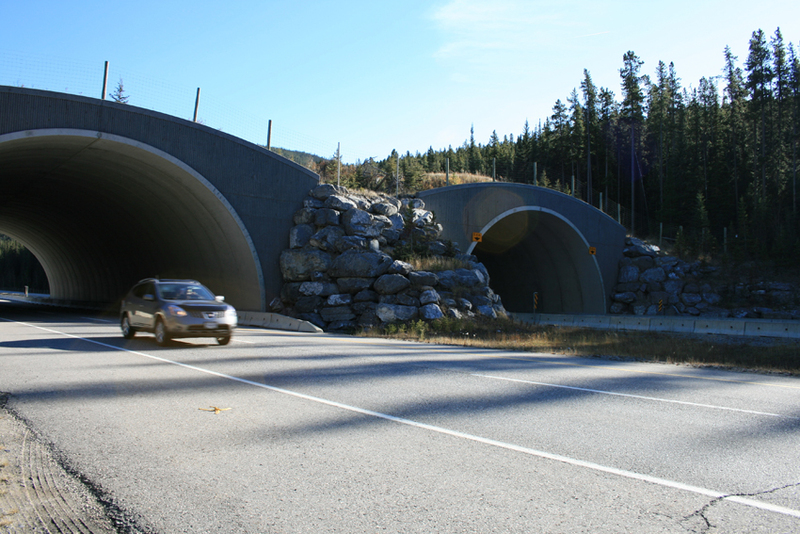 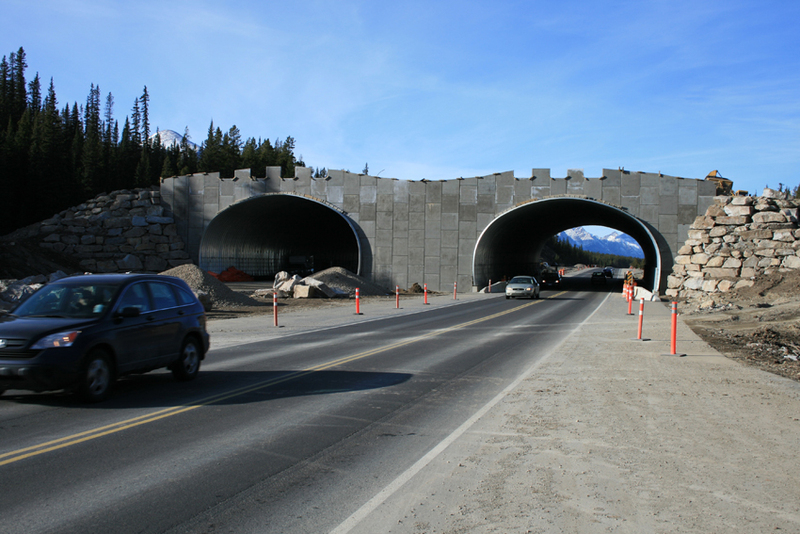 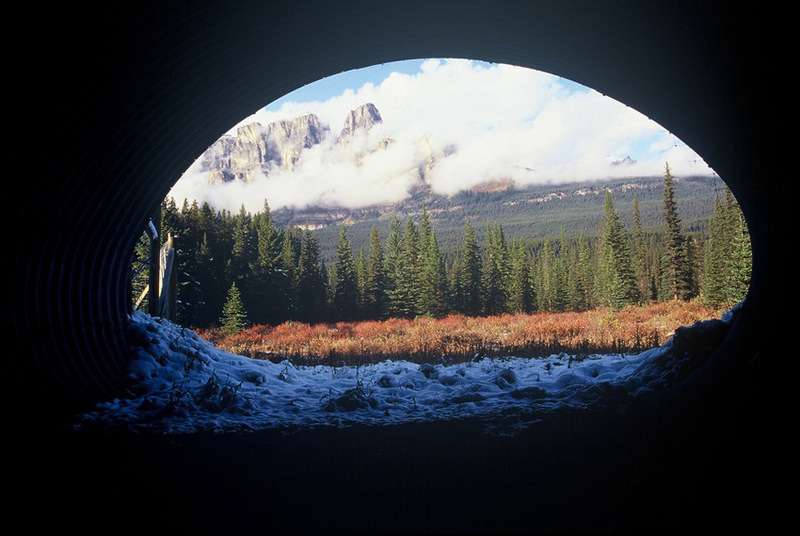 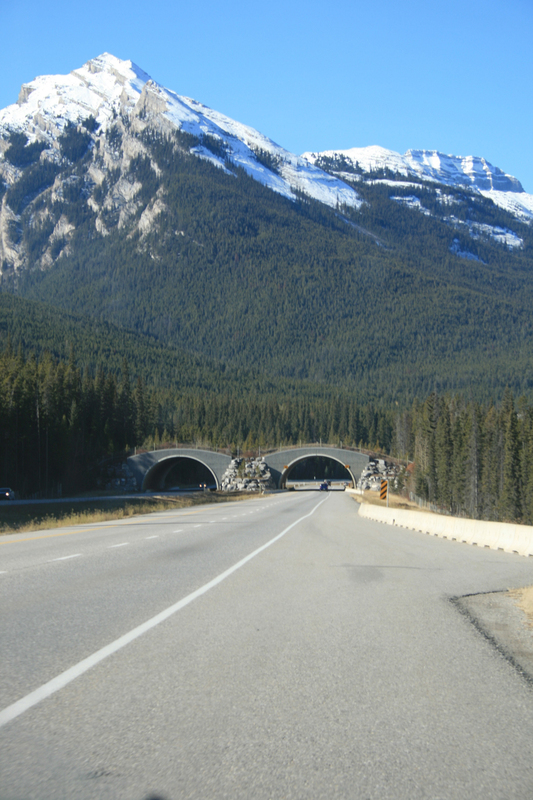 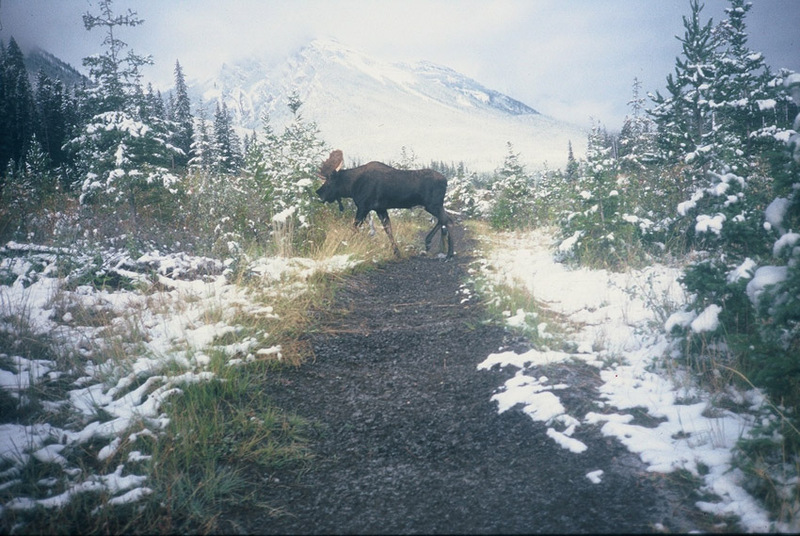 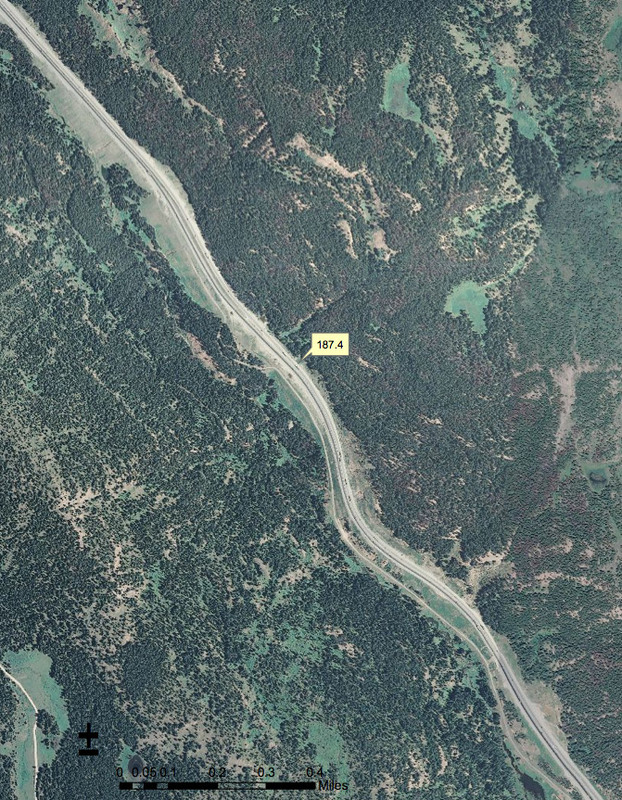 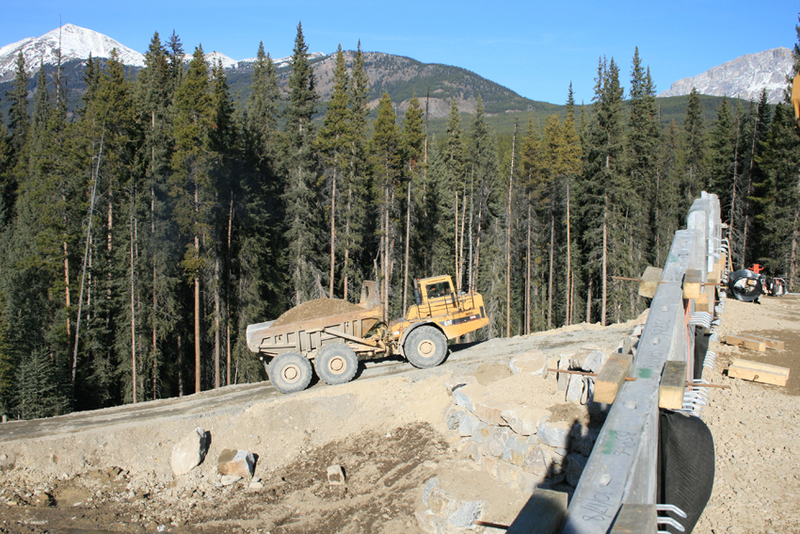 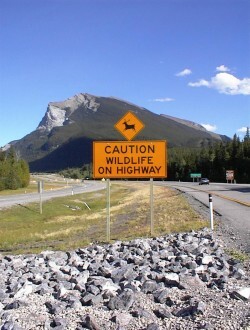 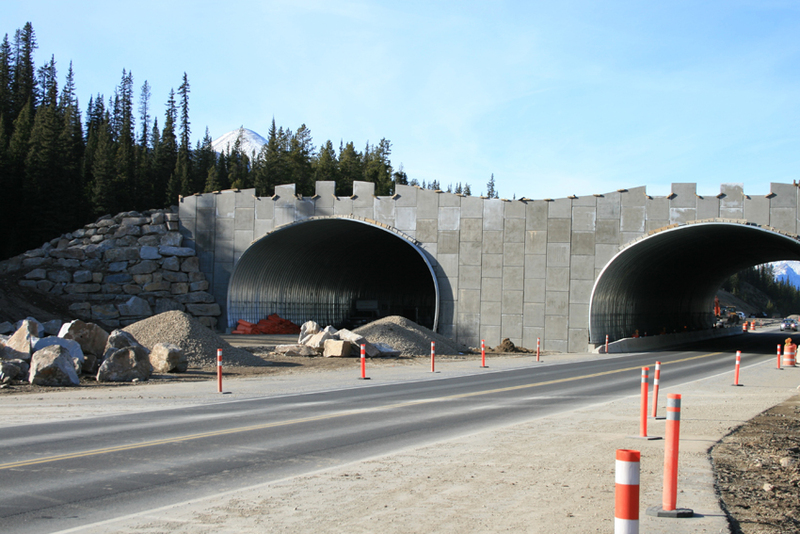 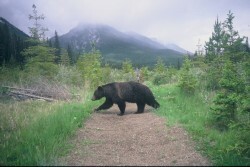 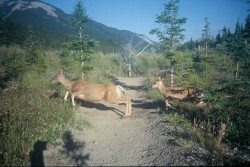 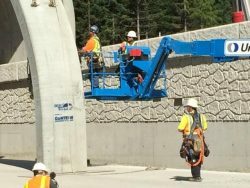 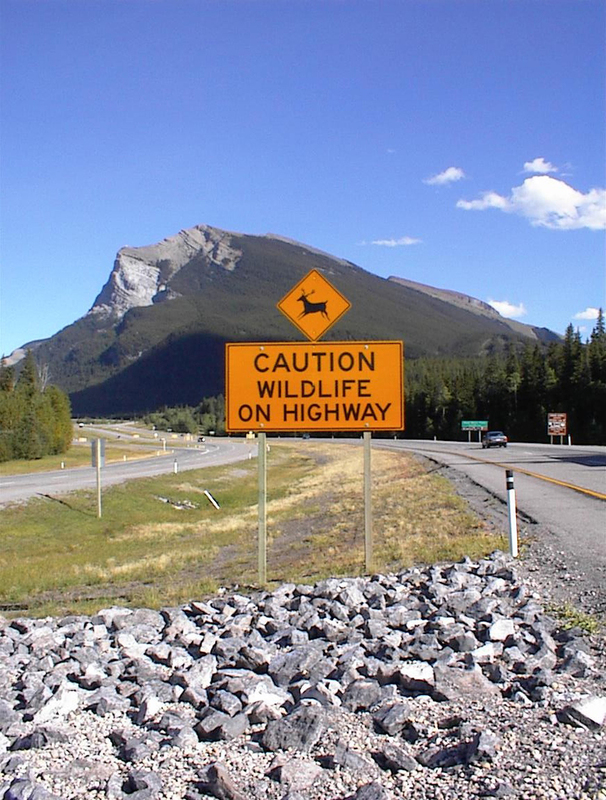 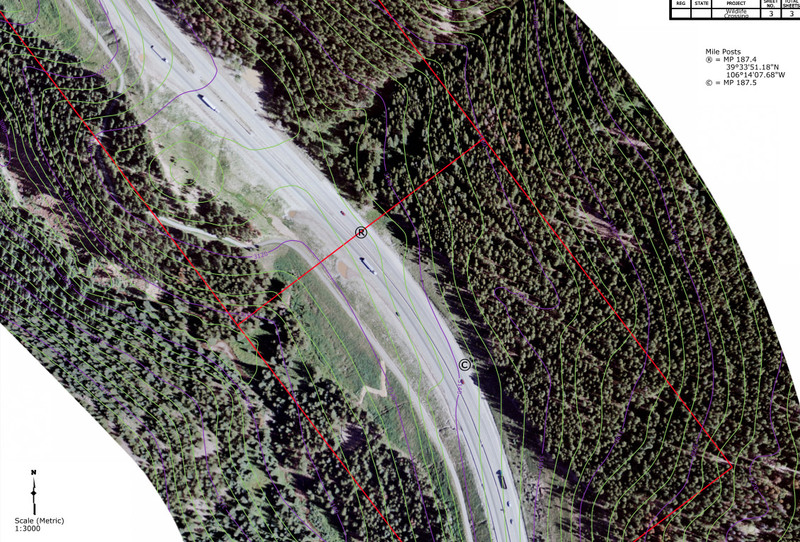 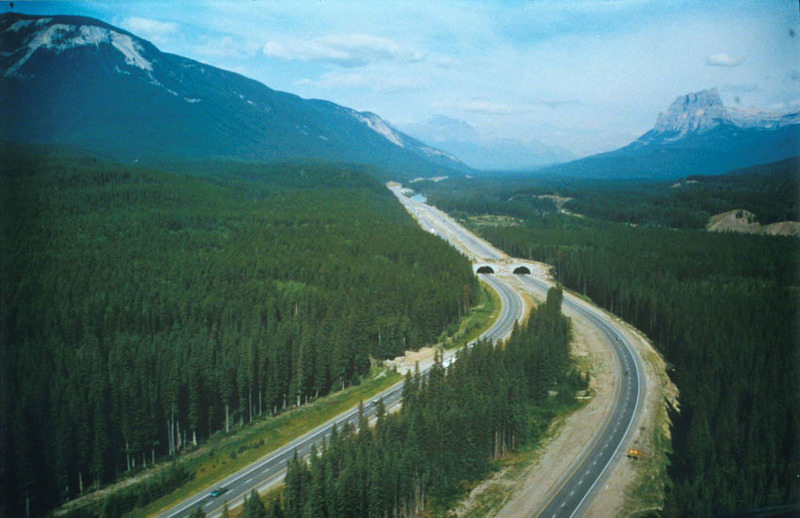 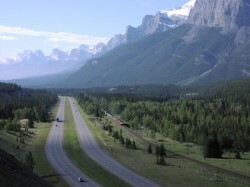 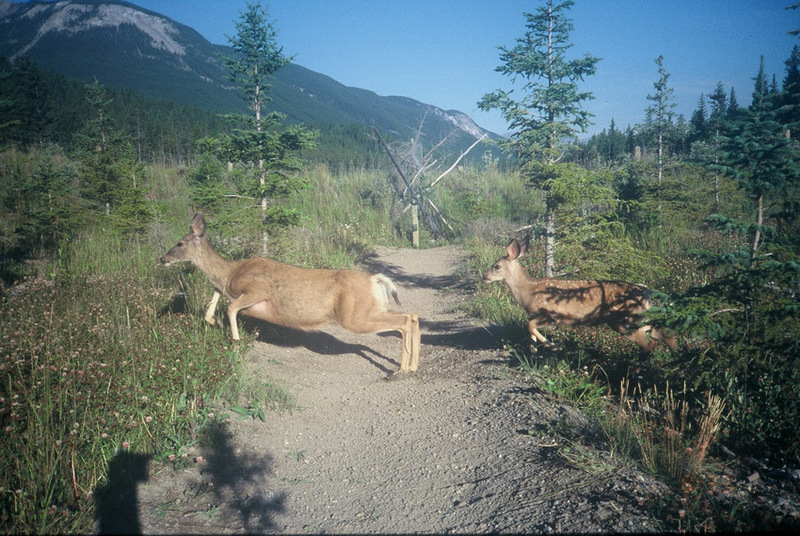 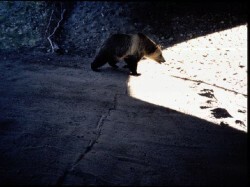 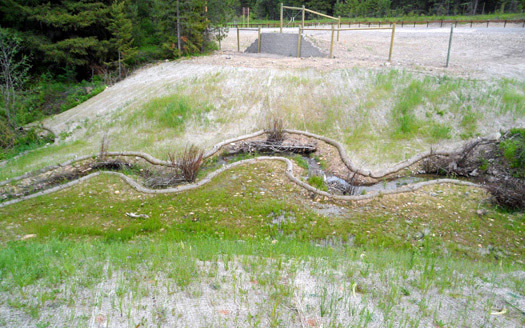 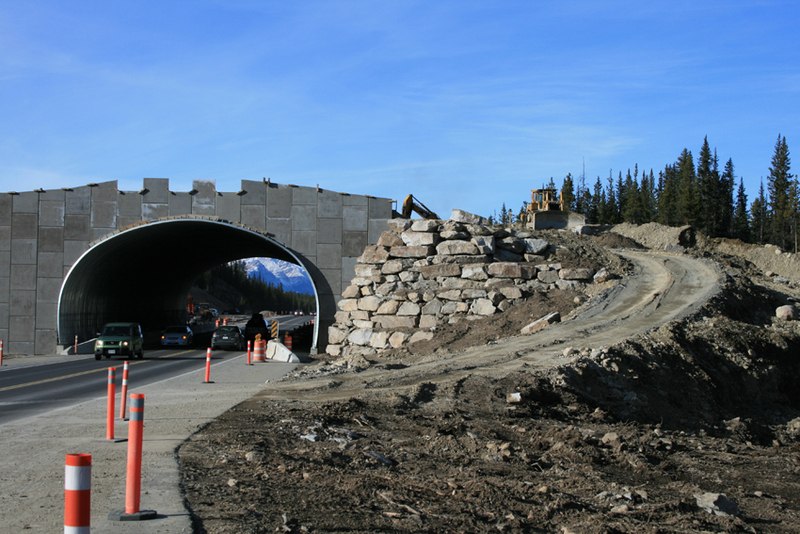 The project is a part of continued highway twinning upgrade along the TCH and intended to to prevent wildlife-vehicle collisions as the highway passes through Banff and Yoho National Parks. 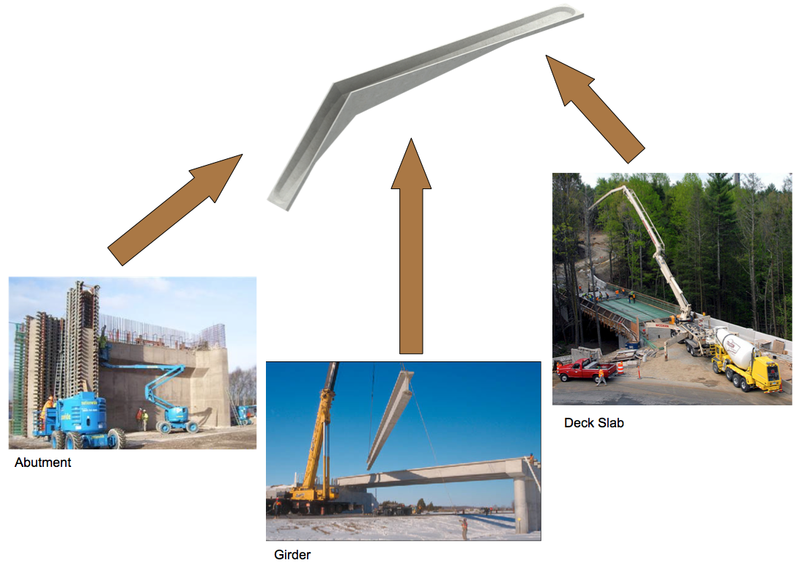 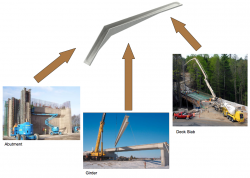 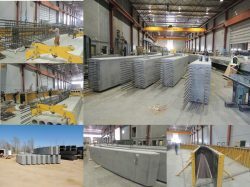 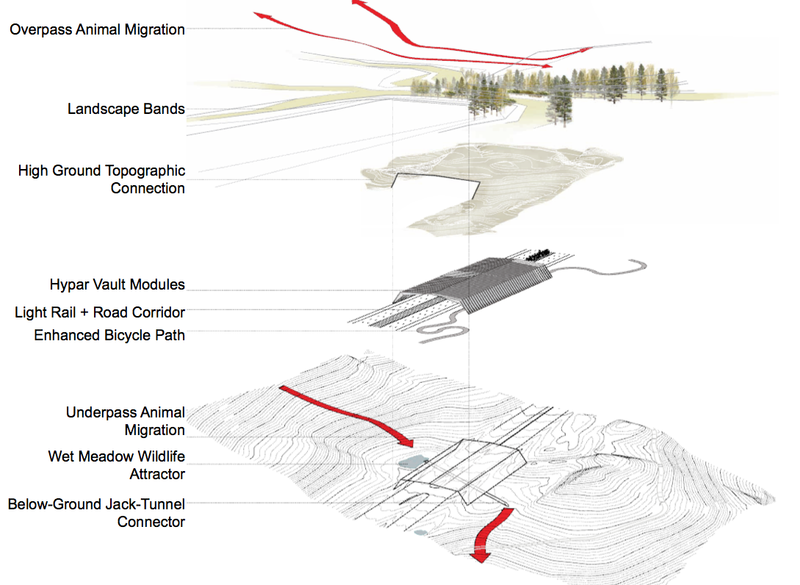 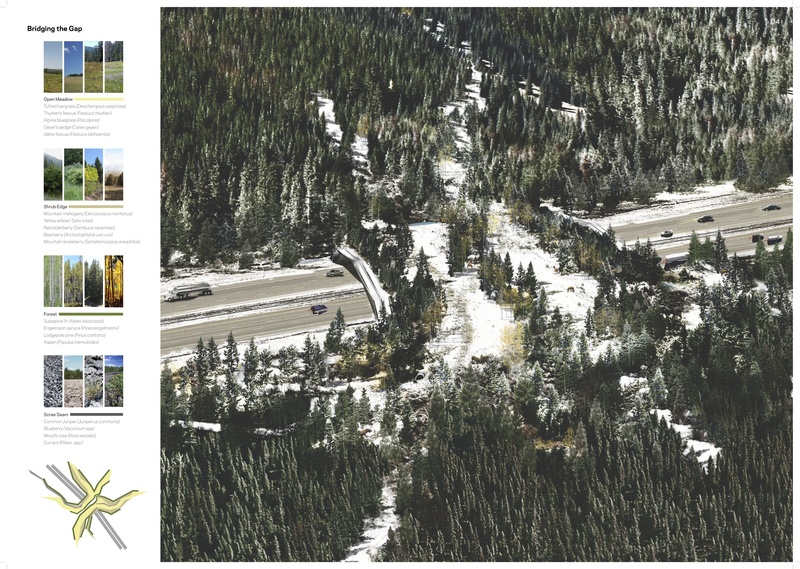 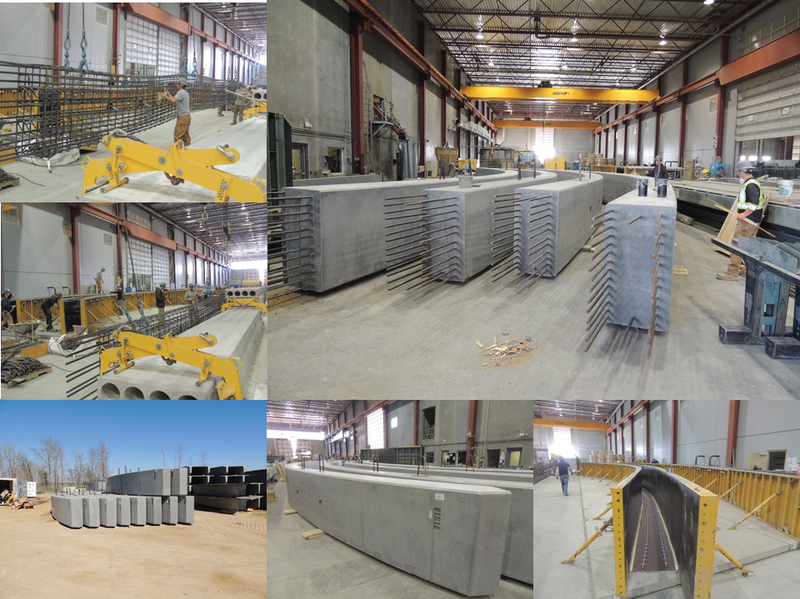 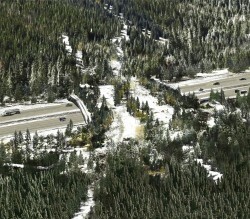 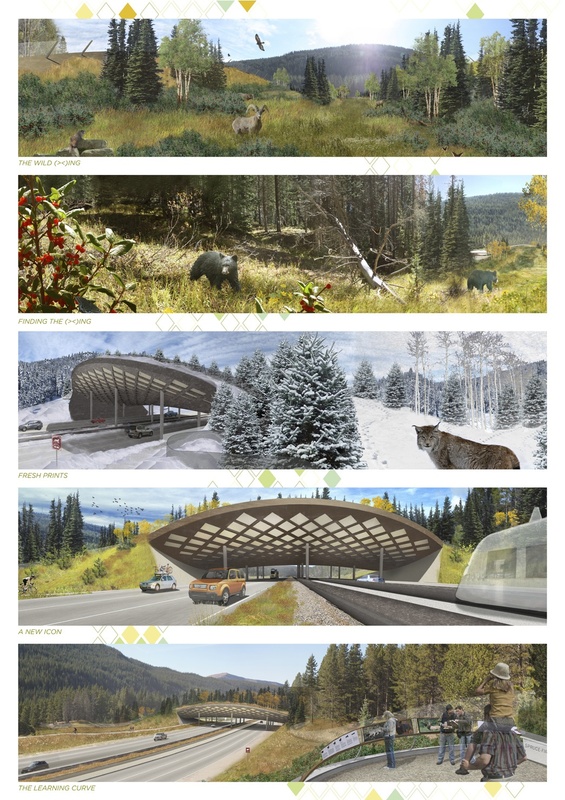 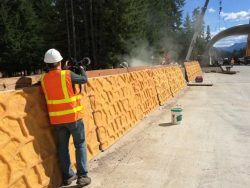 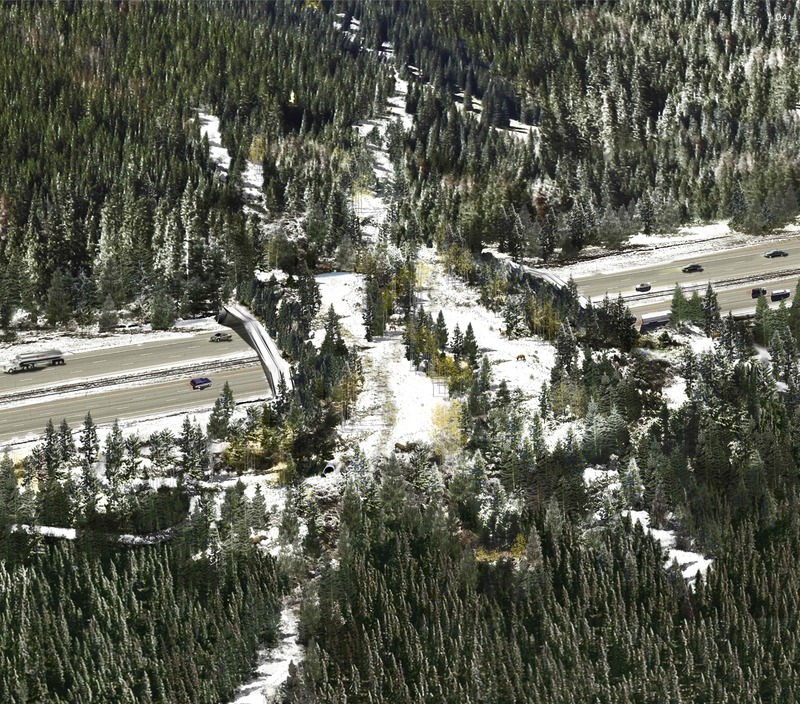 These images depict the ongoing construction of a wildlife overpass on the I-90 near Snoqualmie Pass expected to be completed in 2018. This will be the first overpass on I-90, the longest interstate Highway in the United States, which runs east to west between Seattle and Boston. 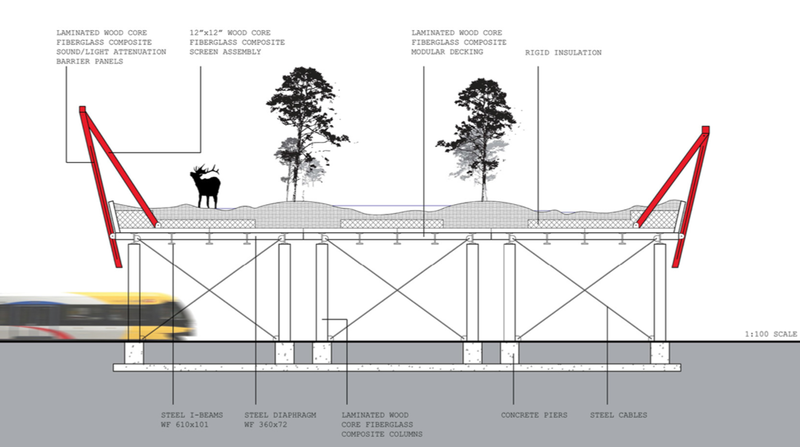 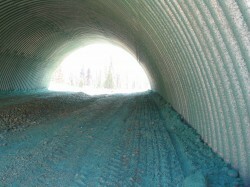 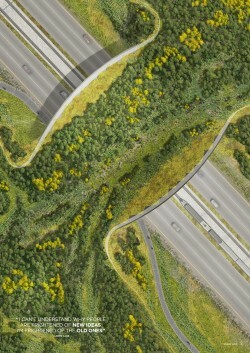 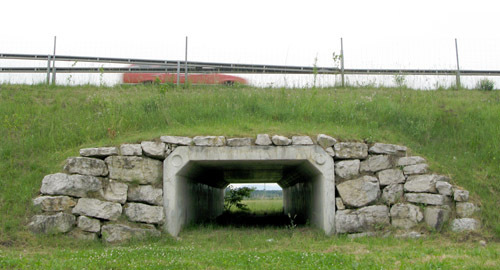 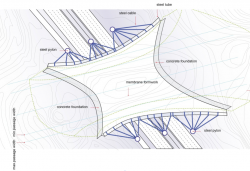 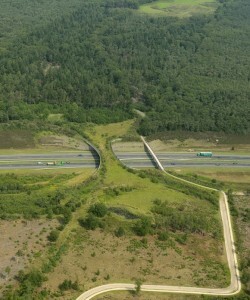 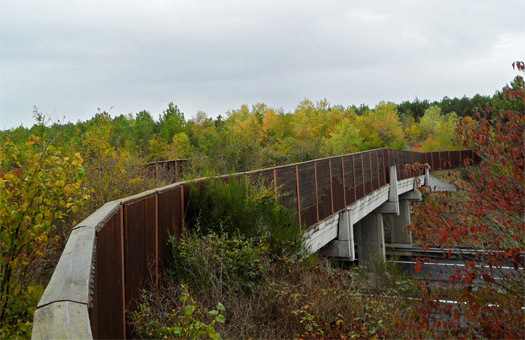 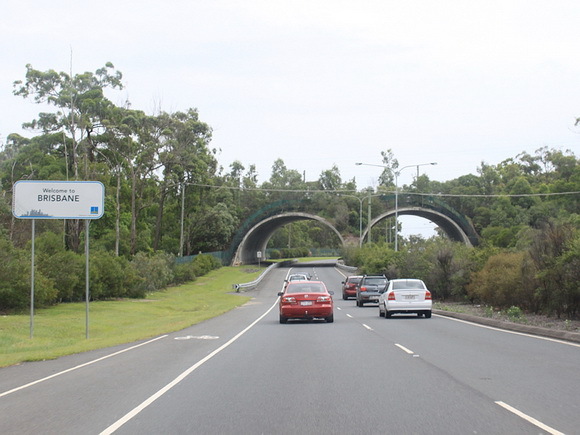 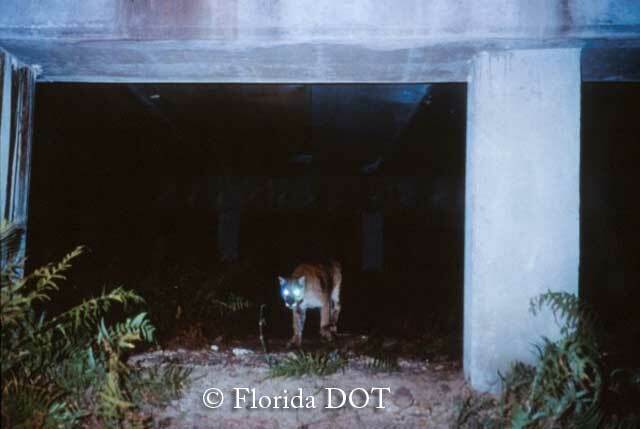 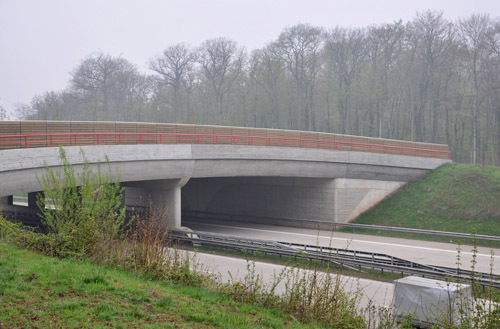 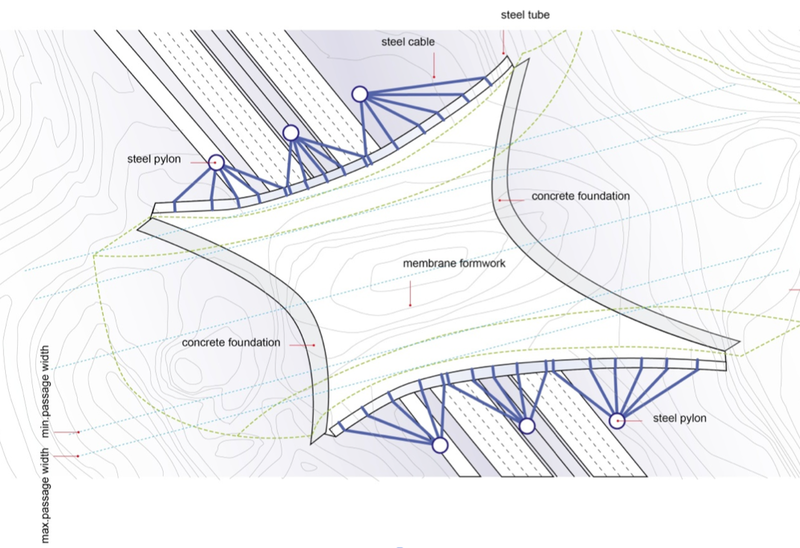 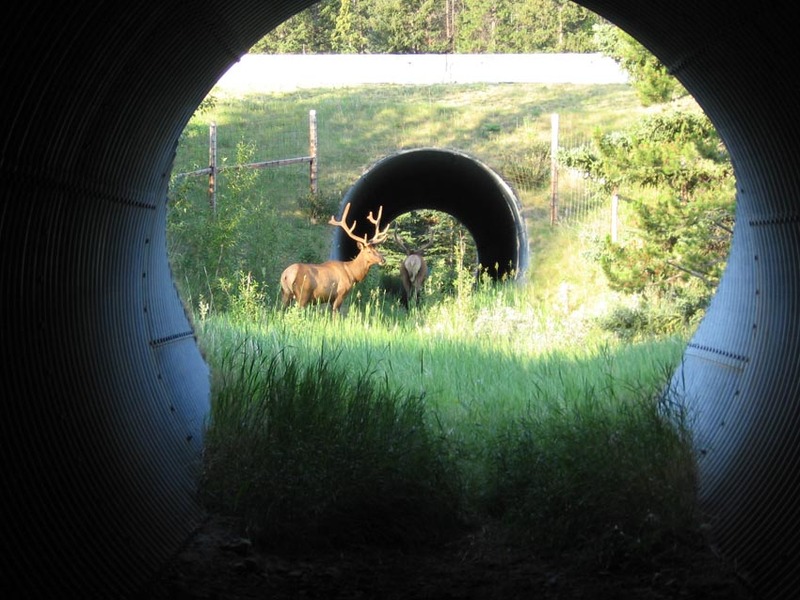 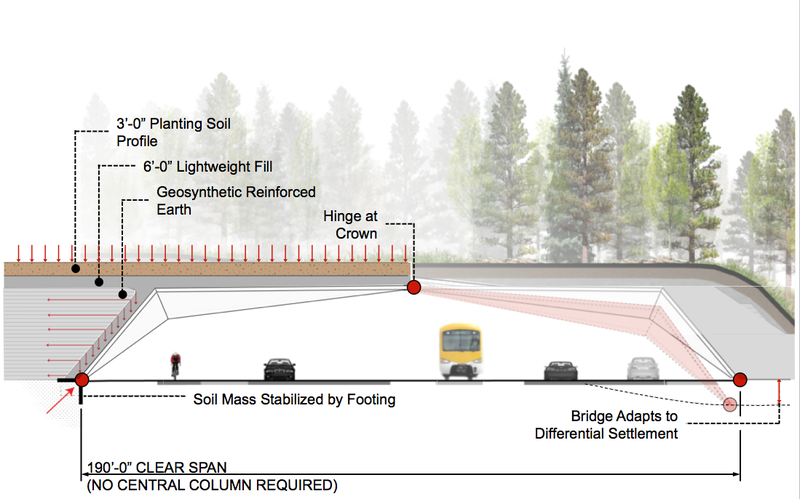 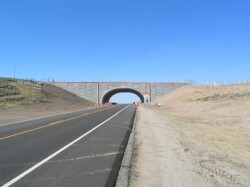 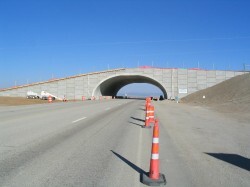 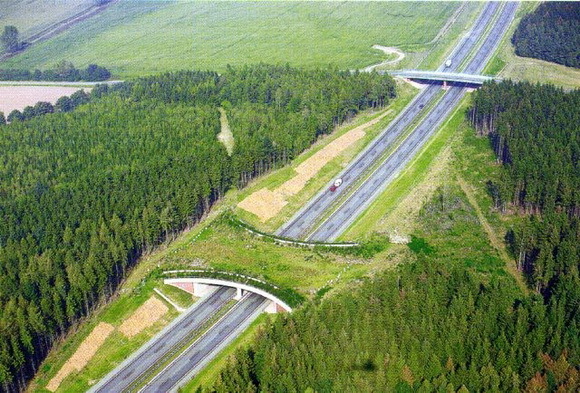 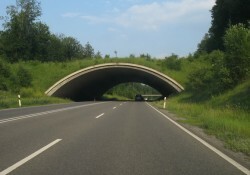 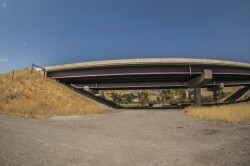 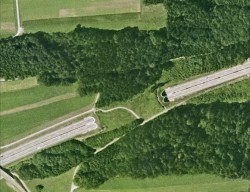 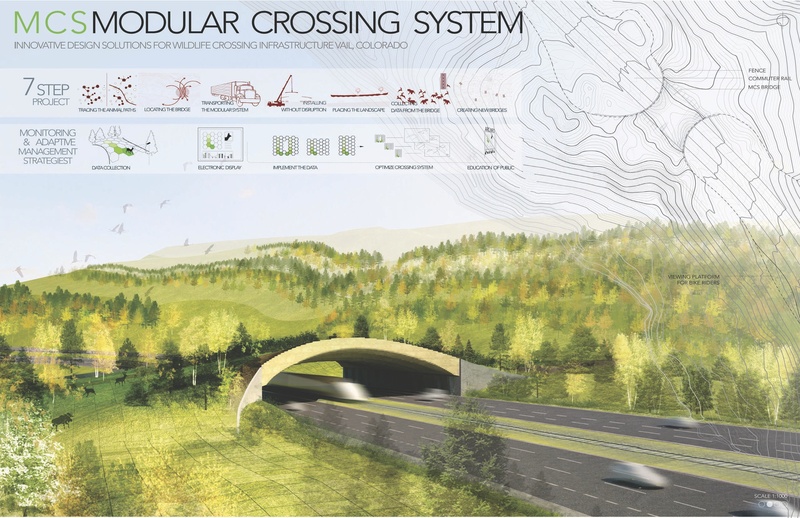 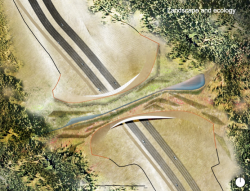 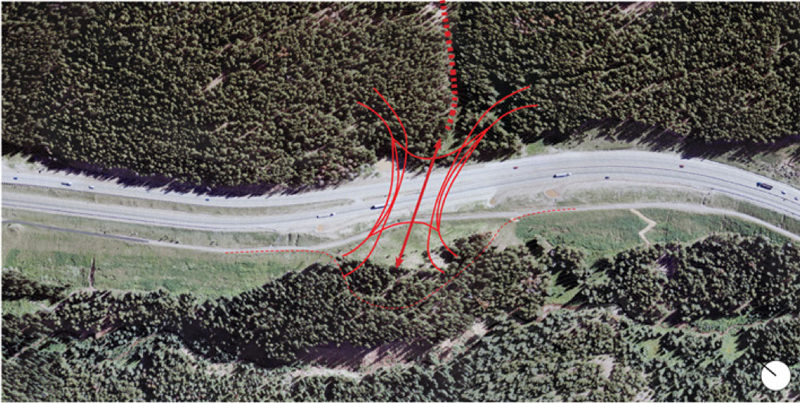 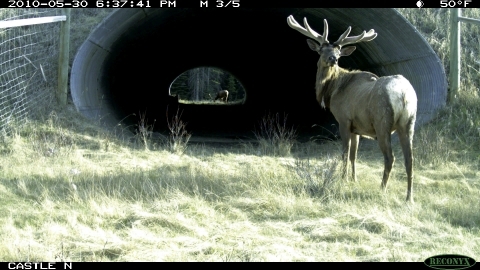 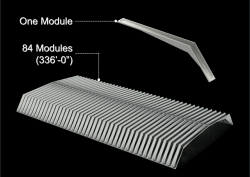 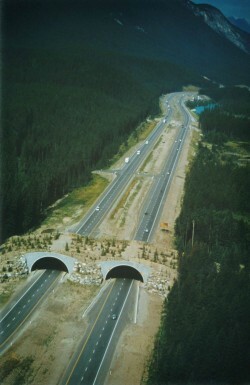 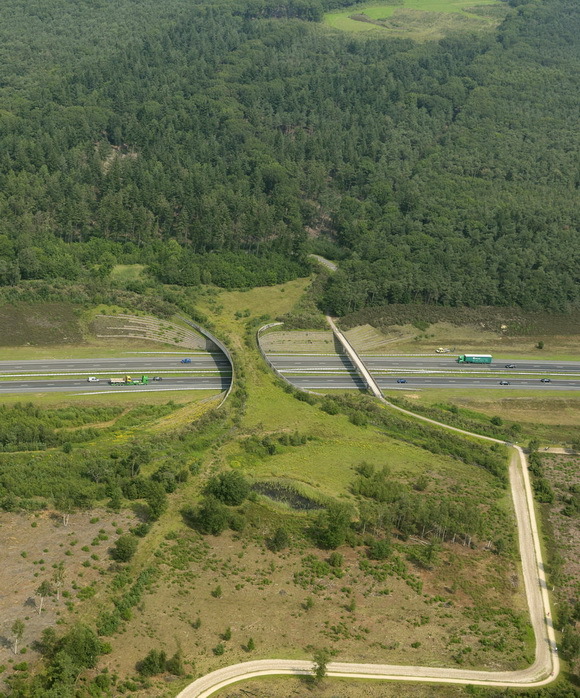 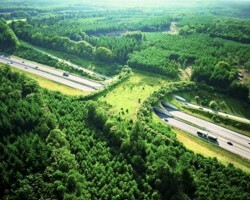 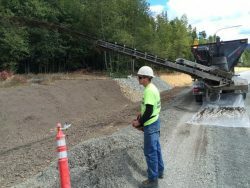 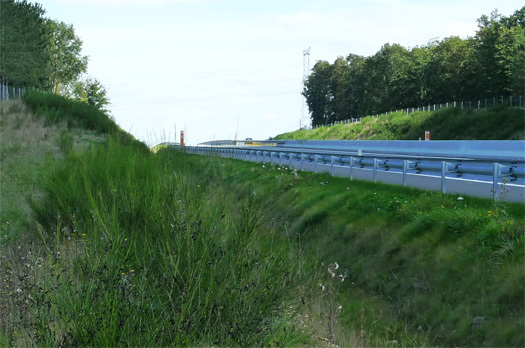 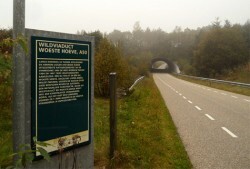 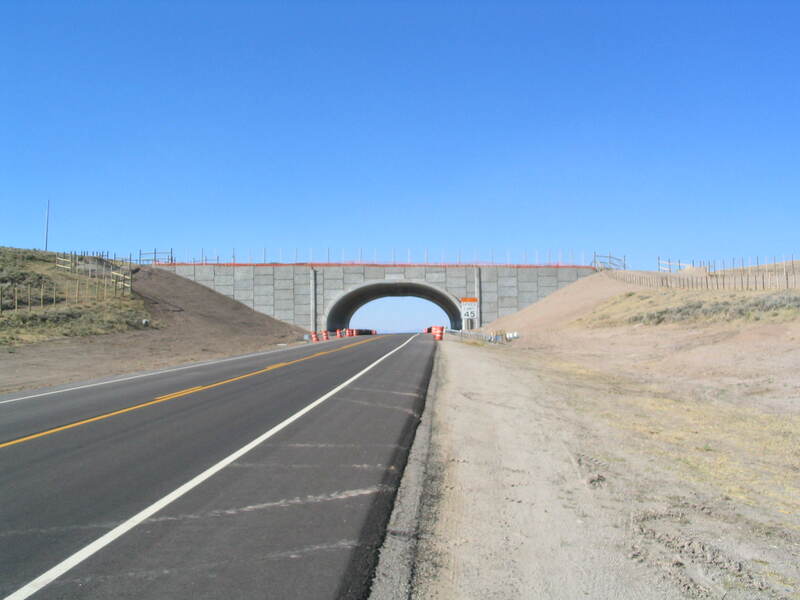 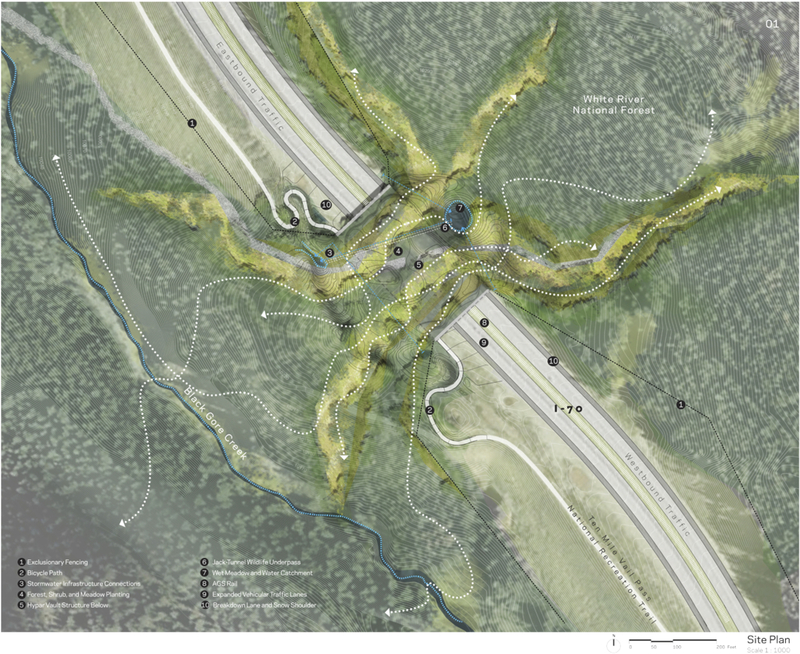 The overpass is expected to reduce wildlife-vehicle collisions and improve connectivity for a wide range of wildlife species, large and small, to move safely across the landscape. 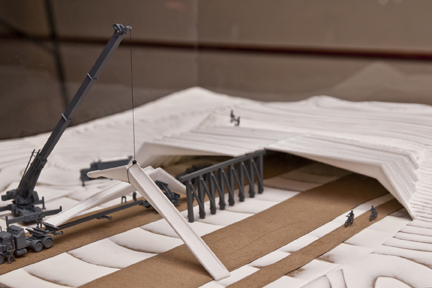 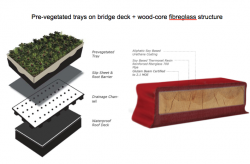 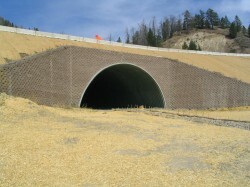 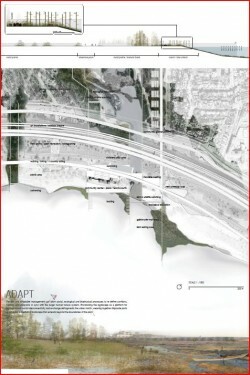 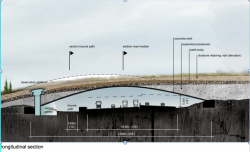 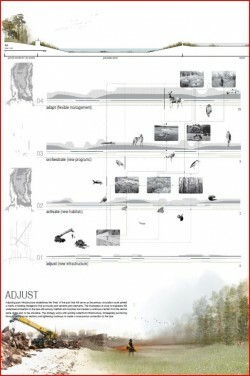 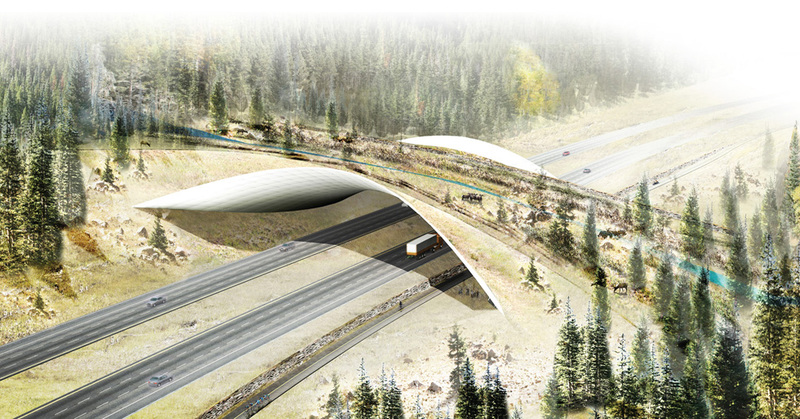 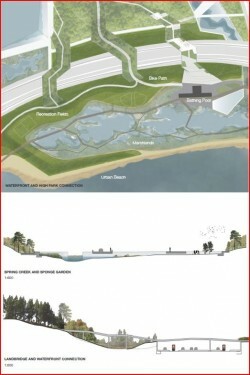 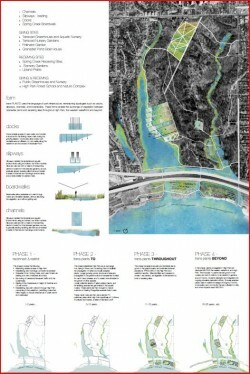 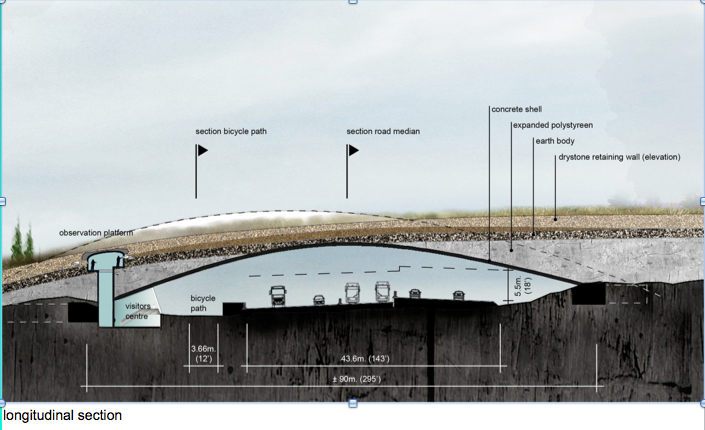 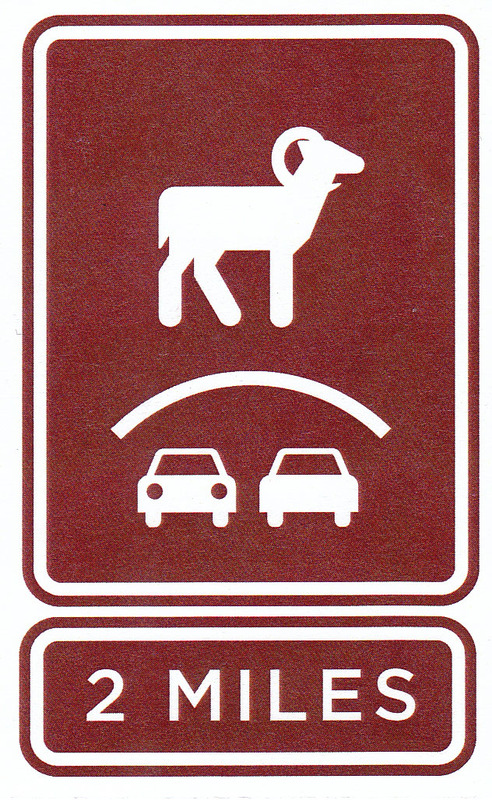 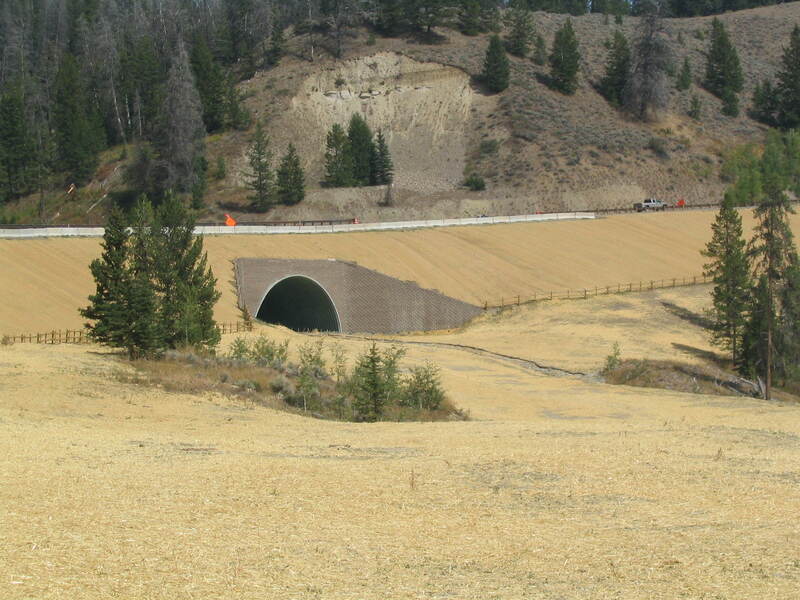 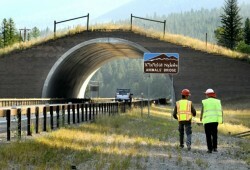 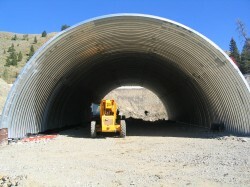 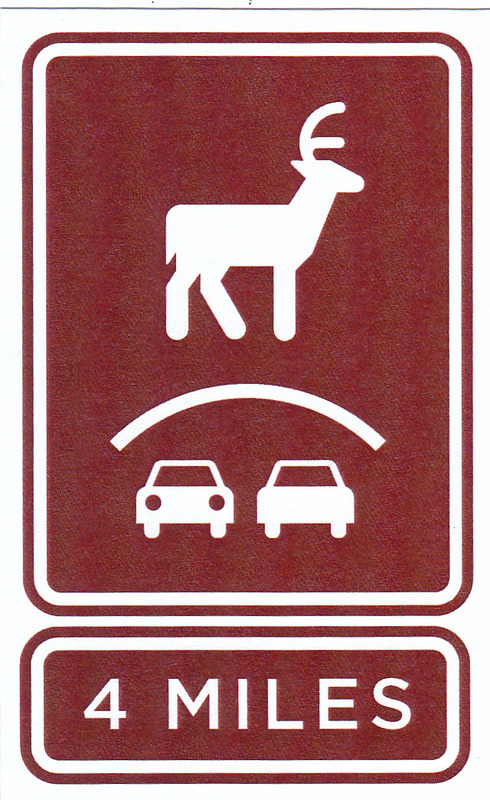 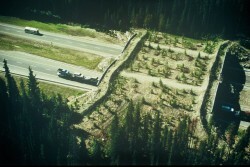 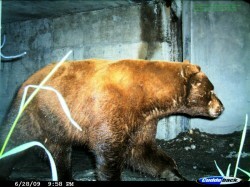 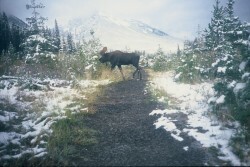 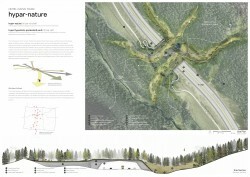 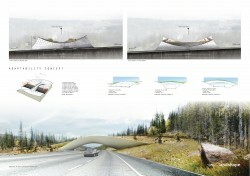 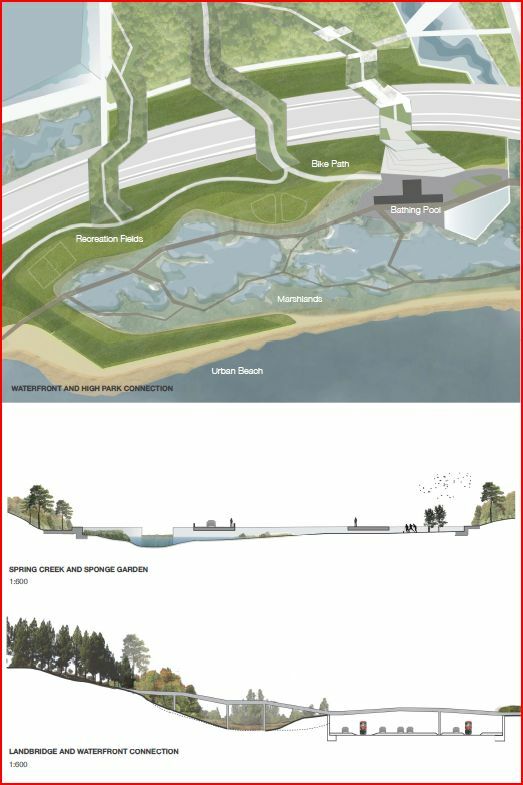 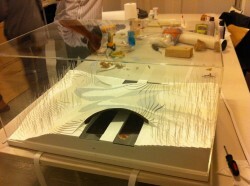 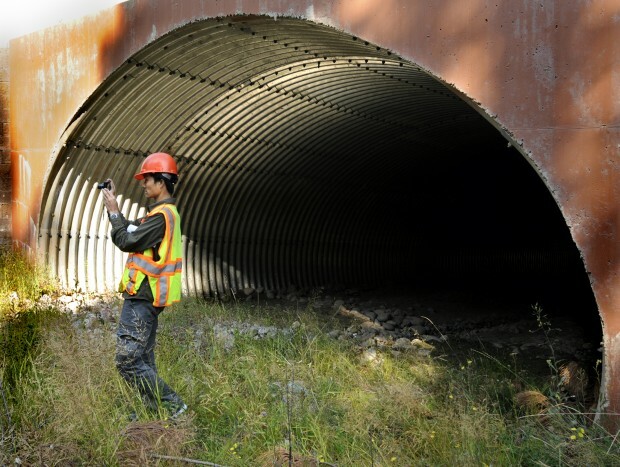 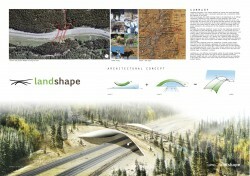 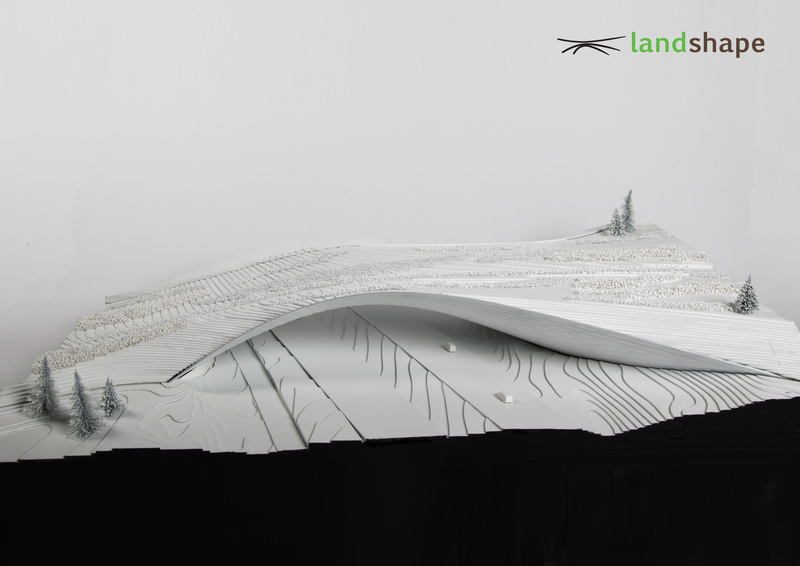 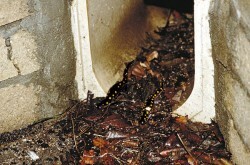 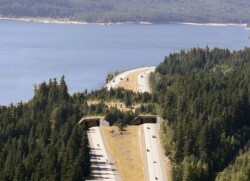 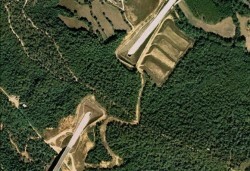 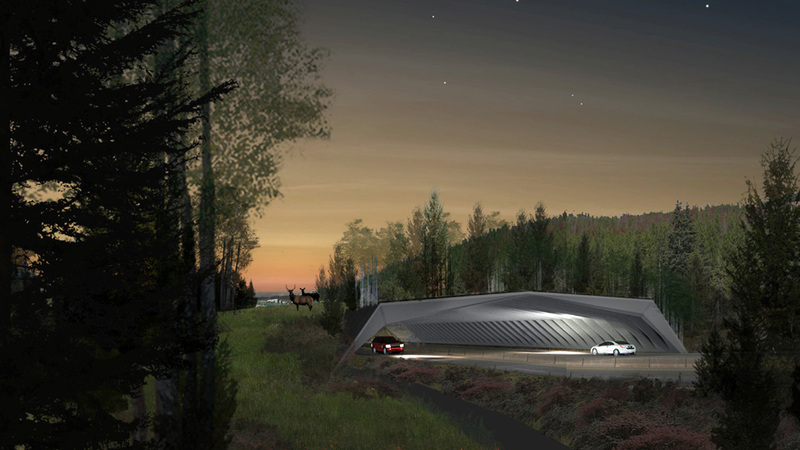 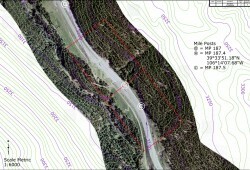 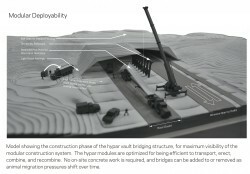 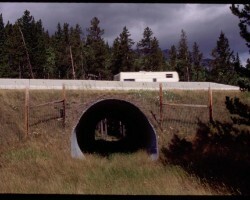 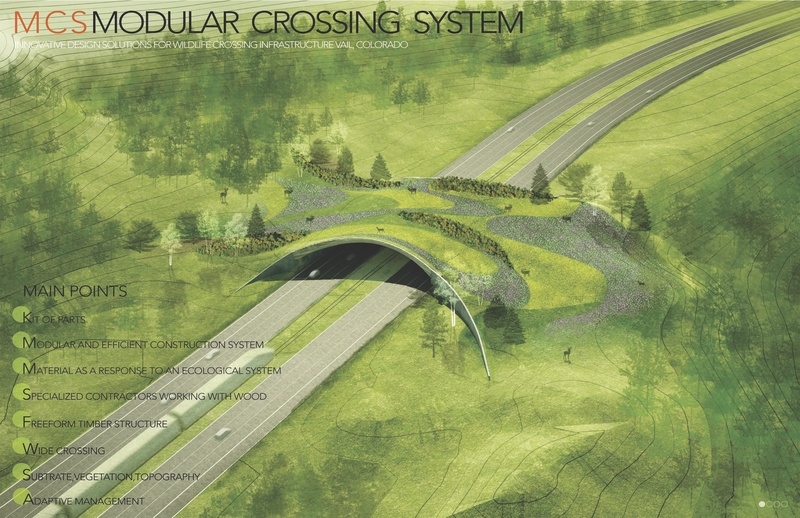 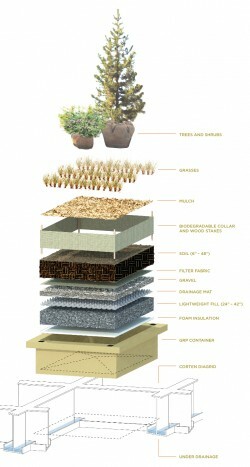 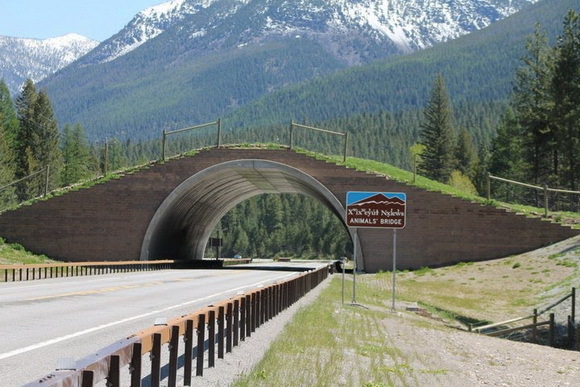 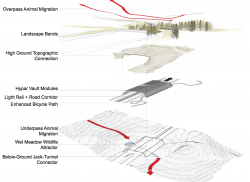 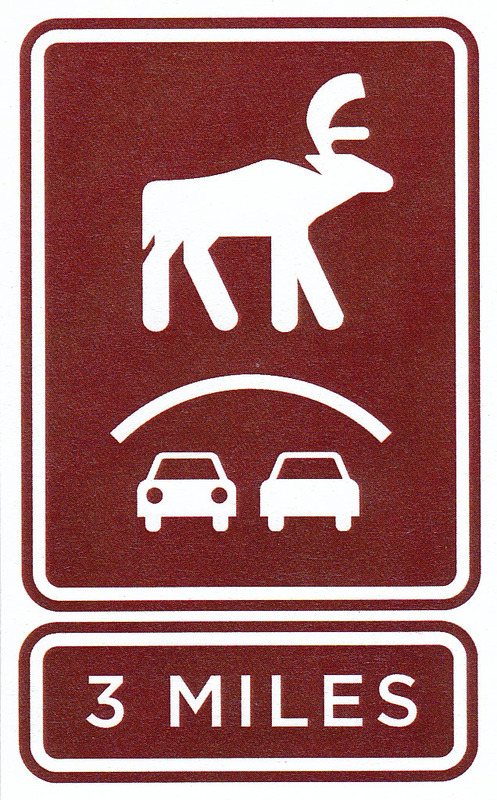 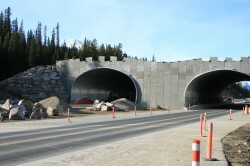 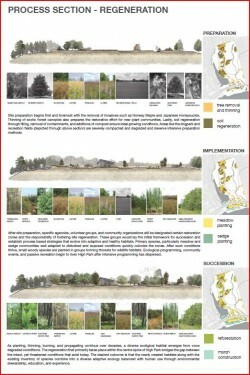 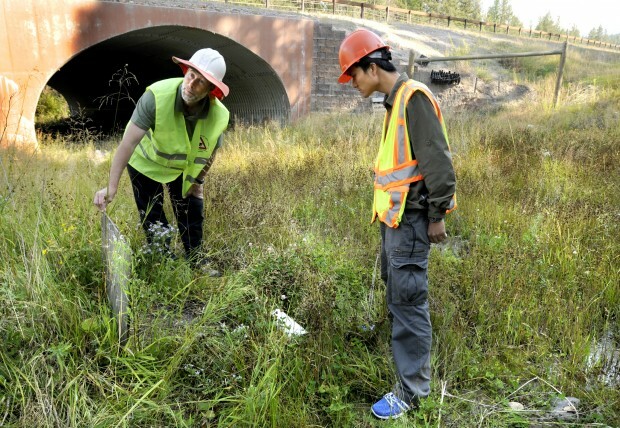 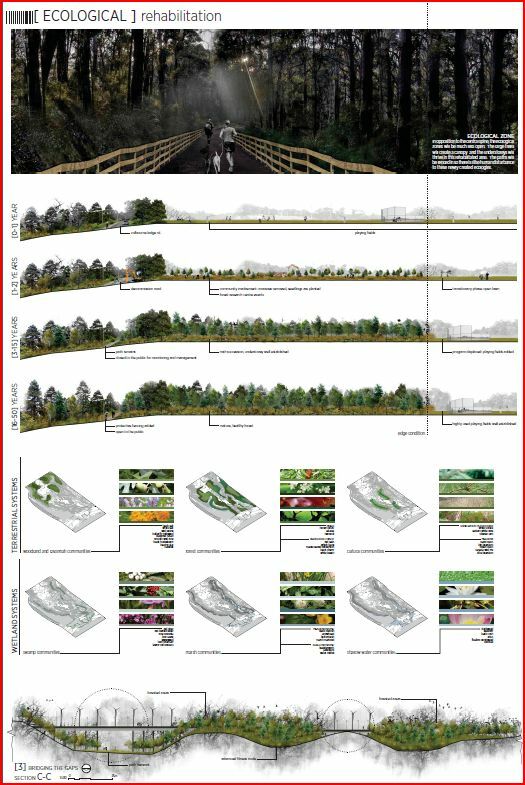 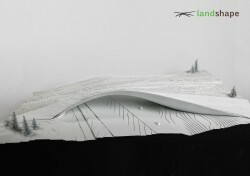 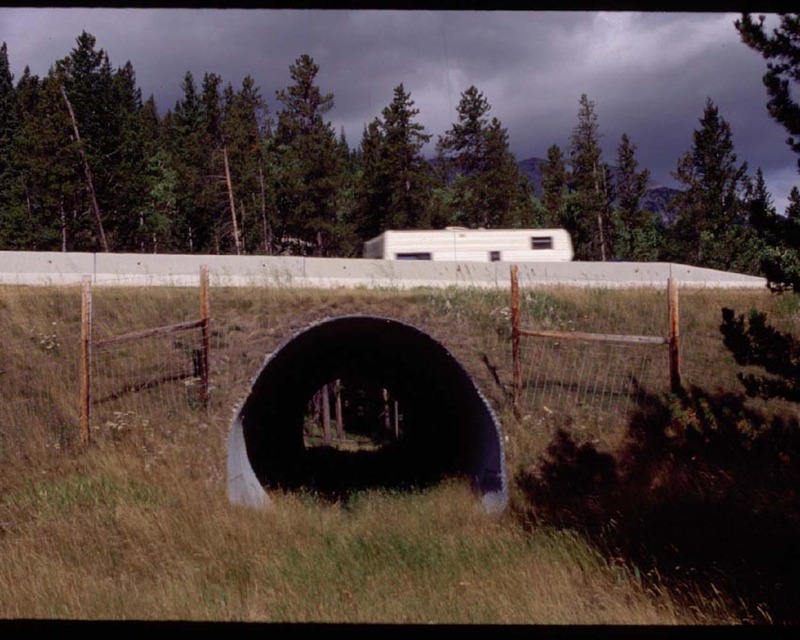 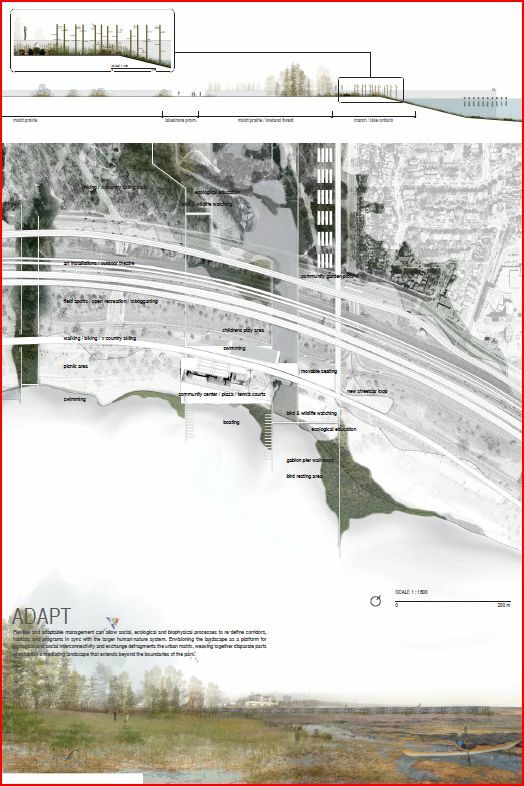 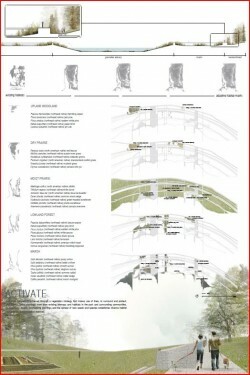 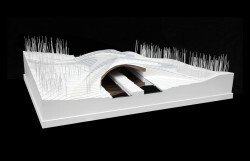 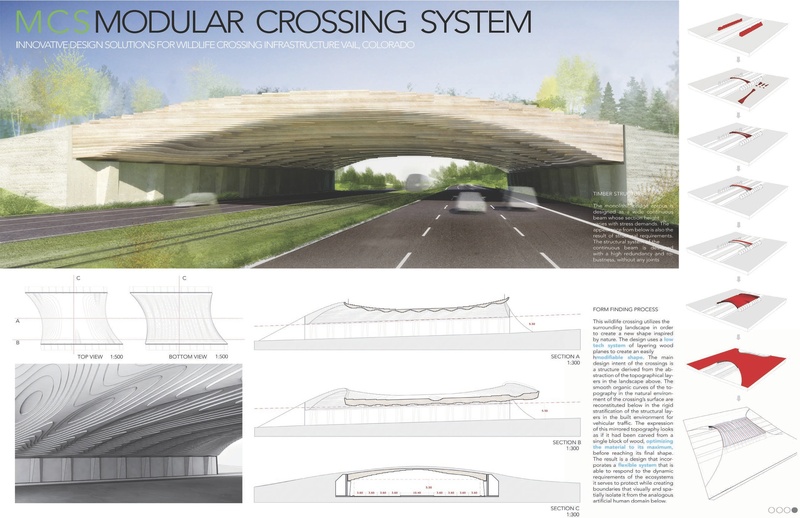 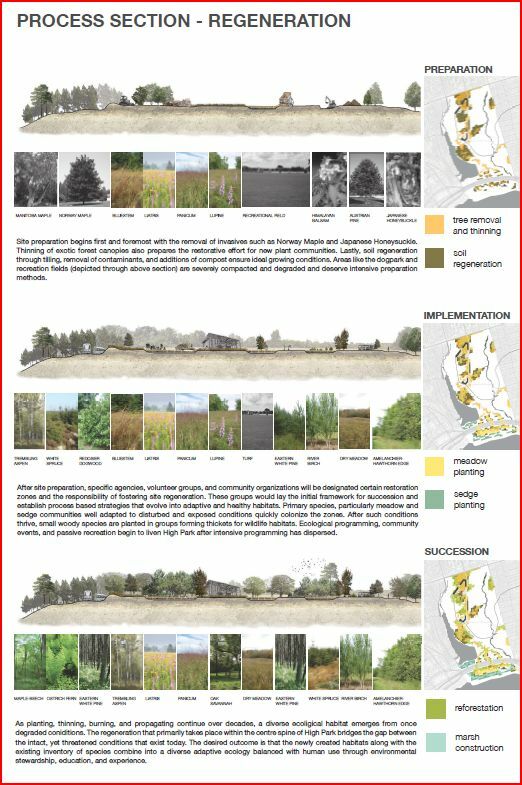 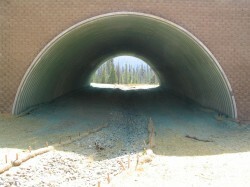 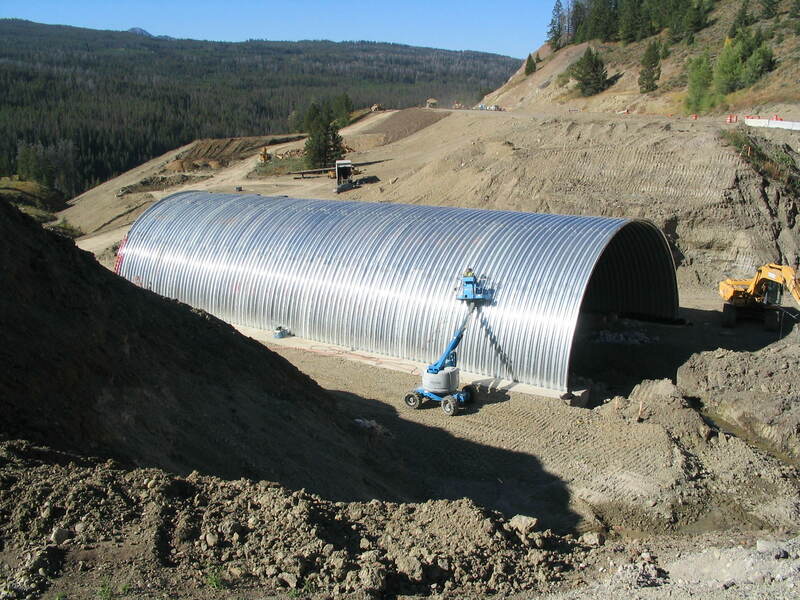 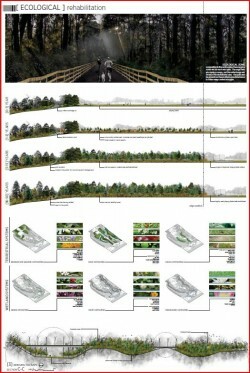 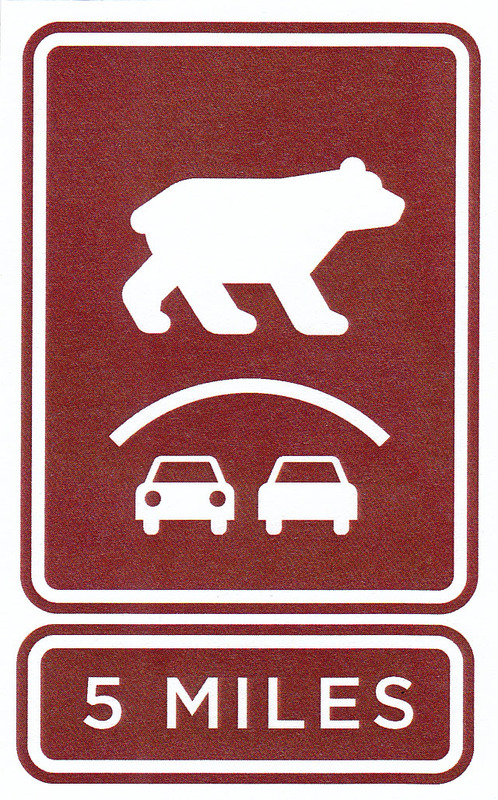 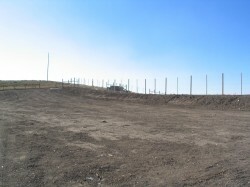 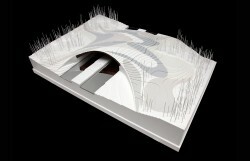 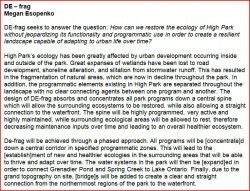 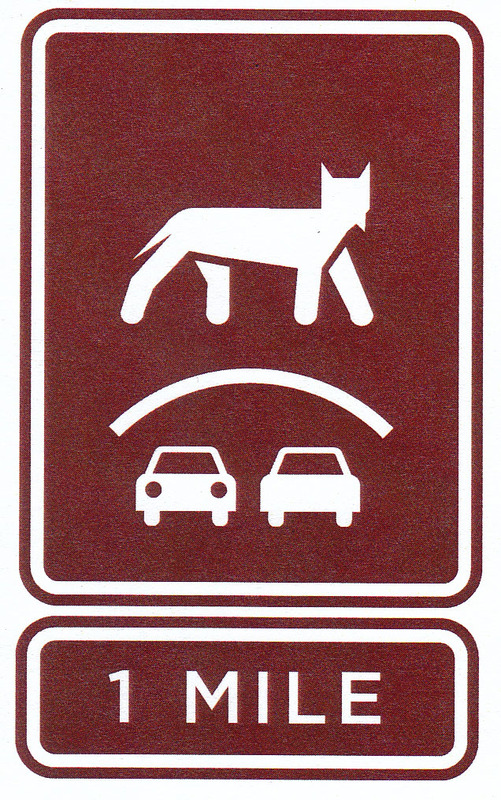 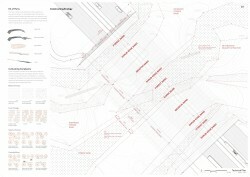 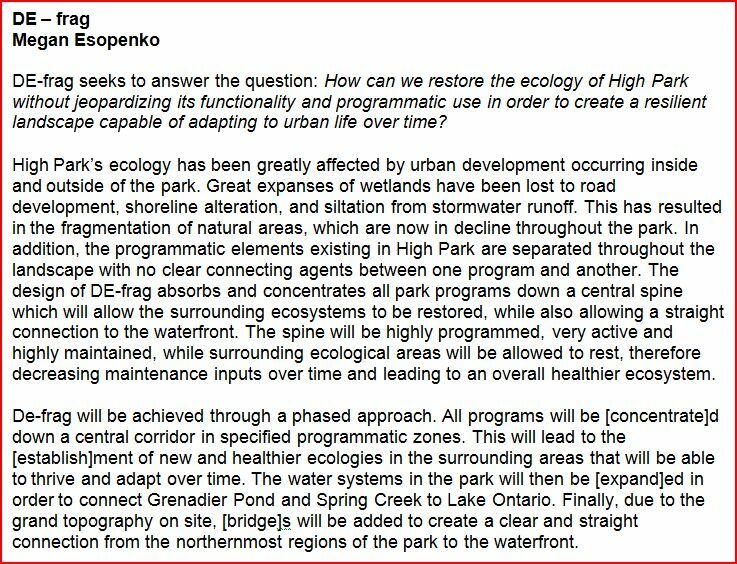 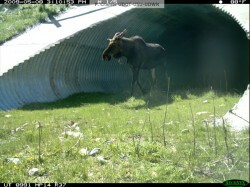 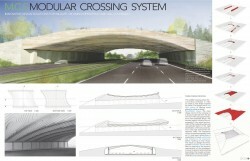 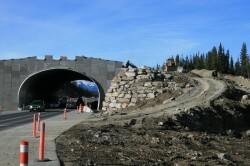 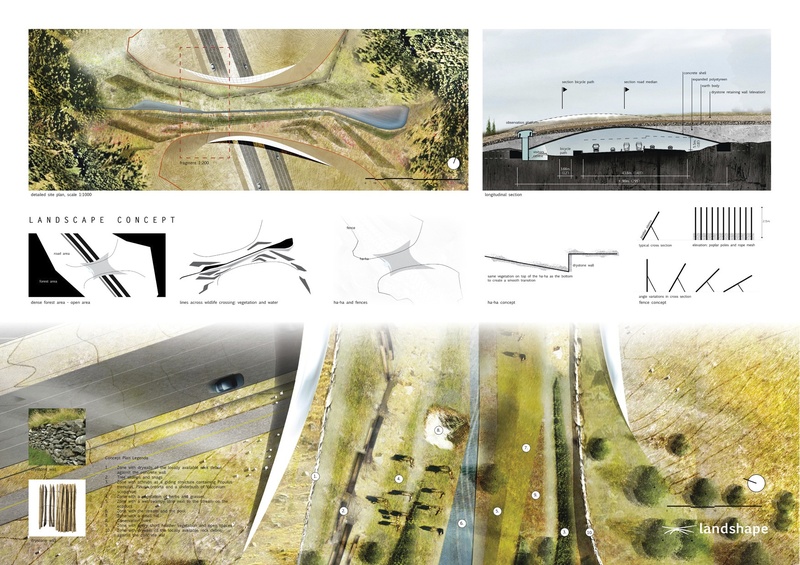 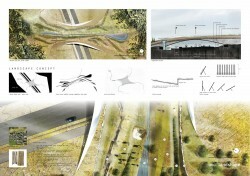 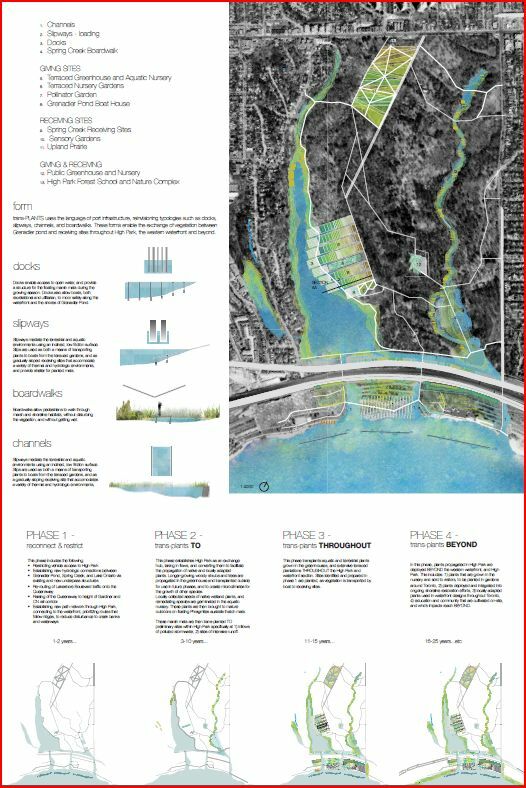 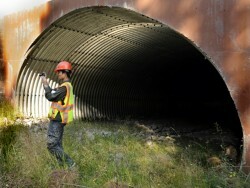 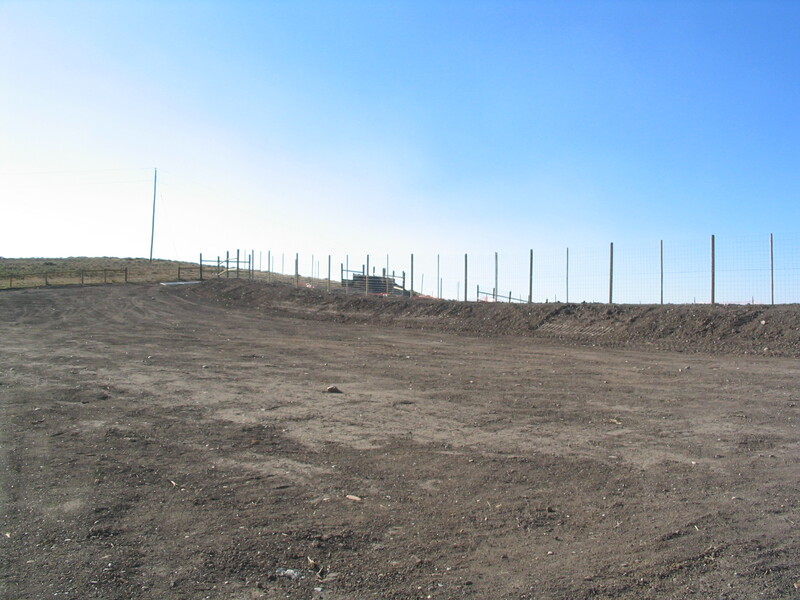 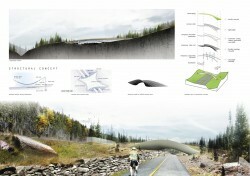 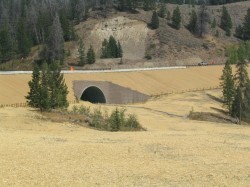 For more information about the project visit the I-90 Wildlife Bridges Coalition. 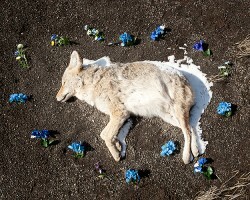 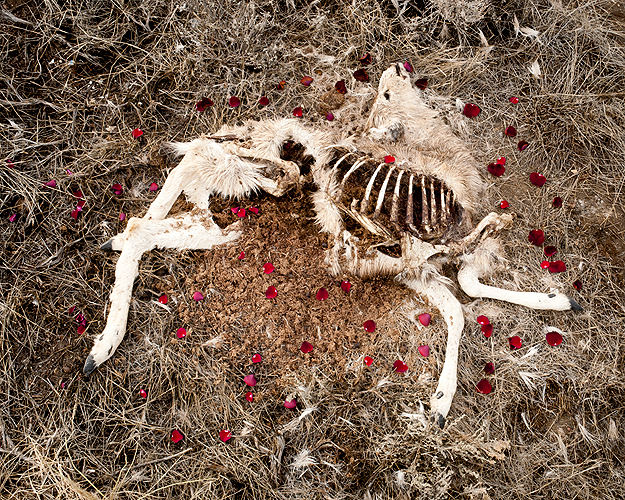 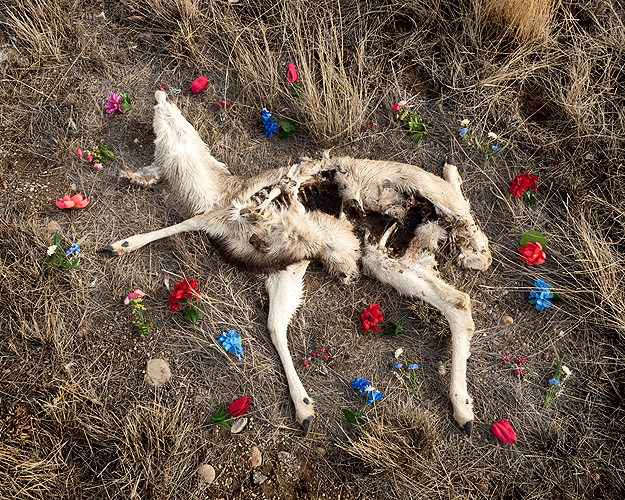 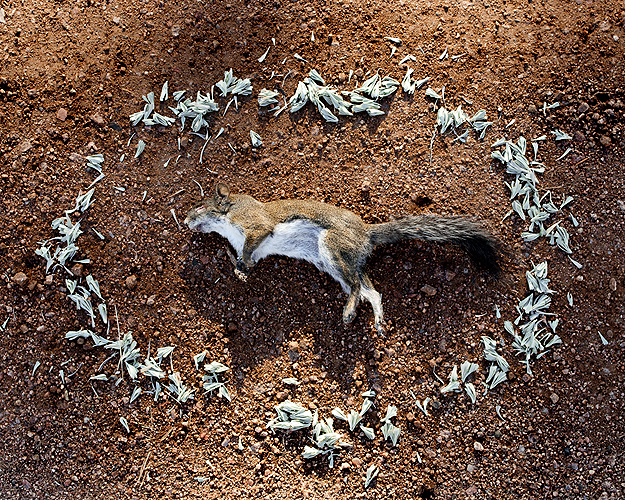 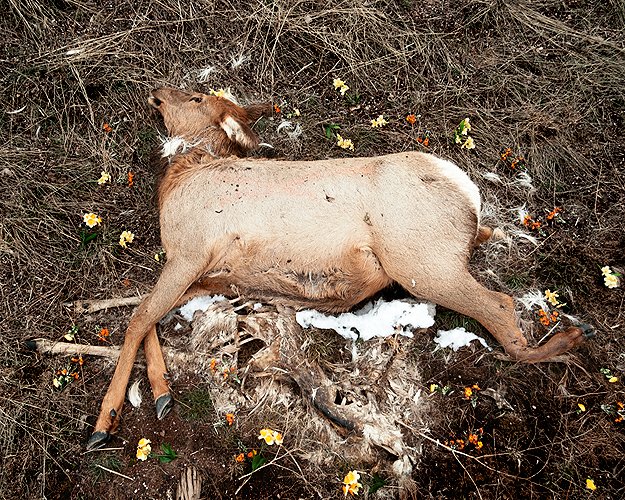 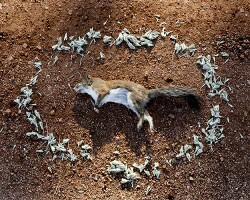 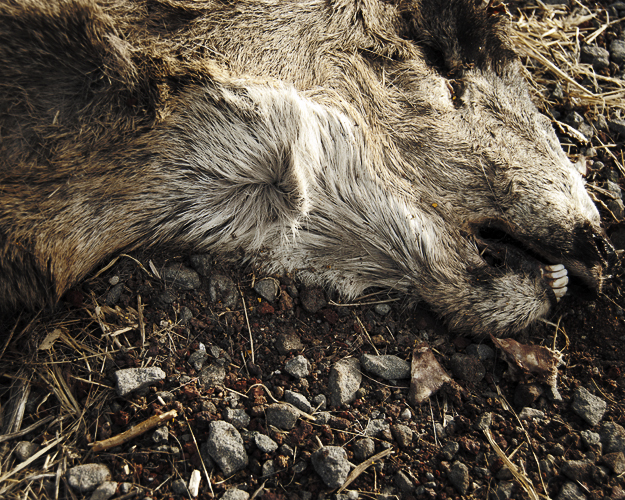 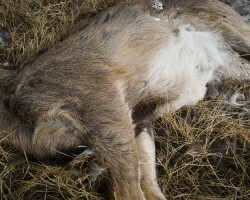 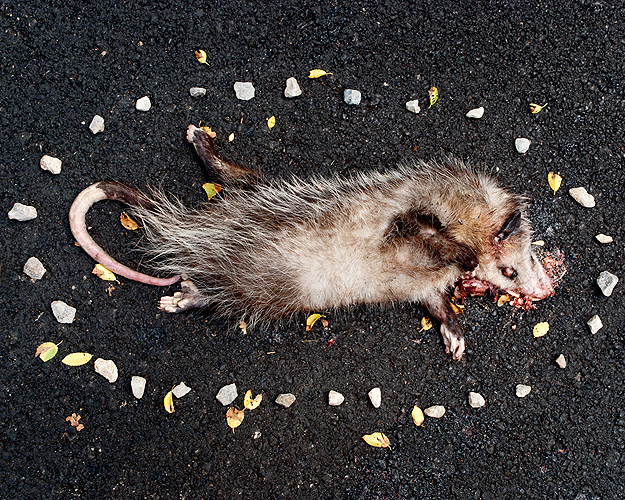 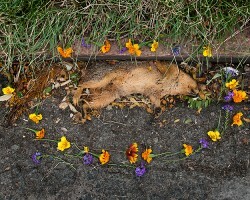 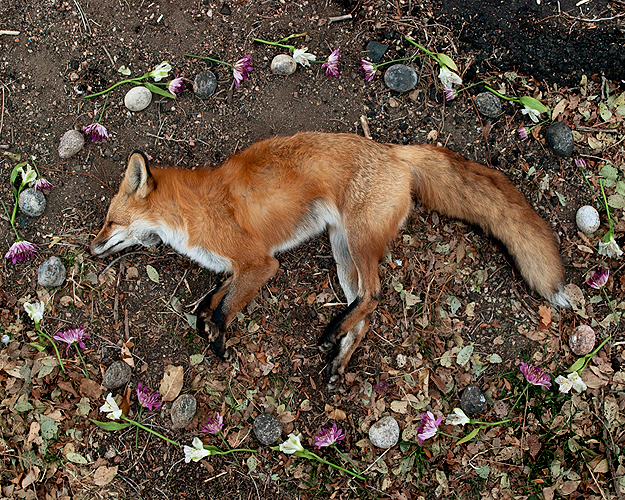 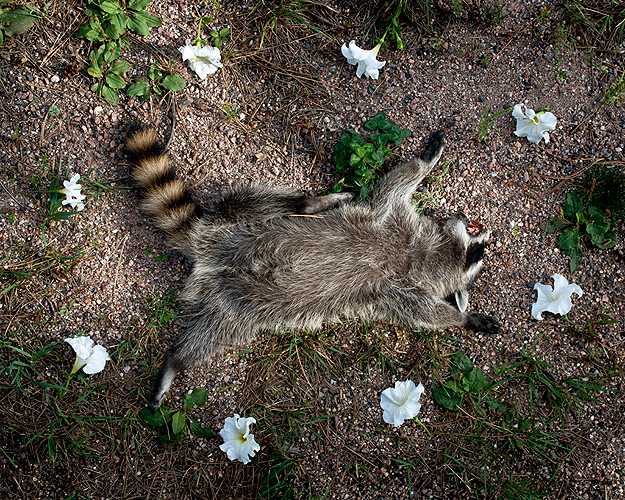 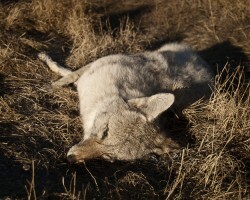 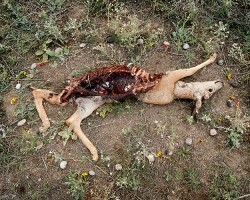 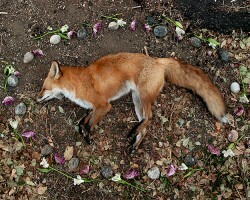 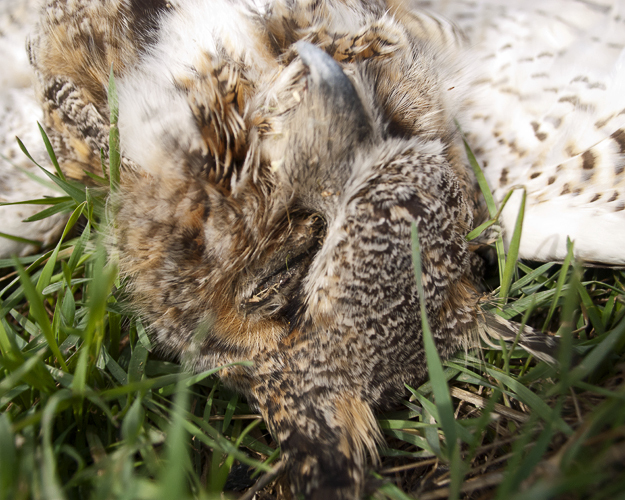 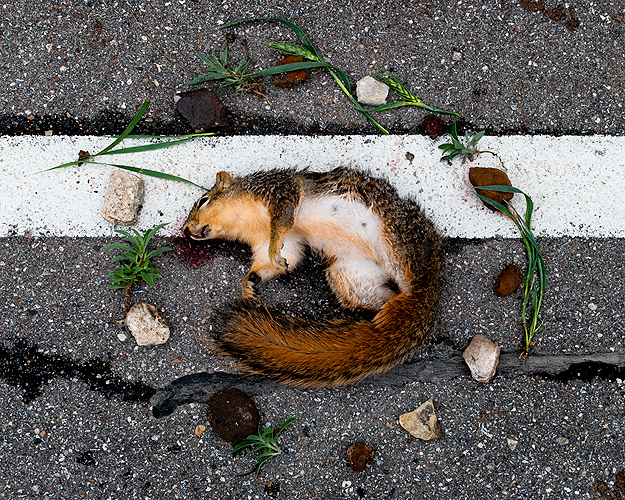 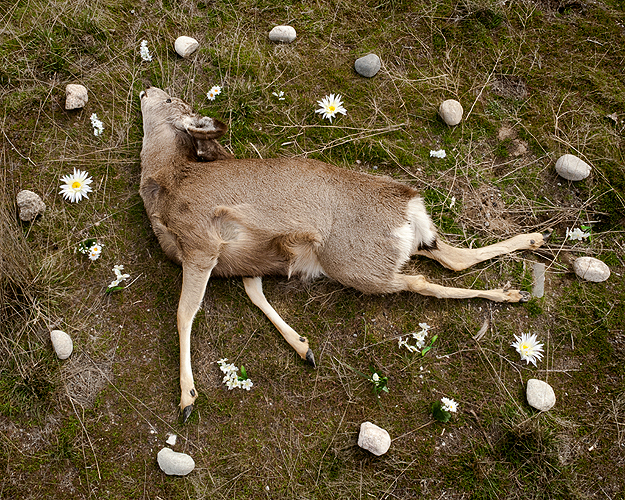 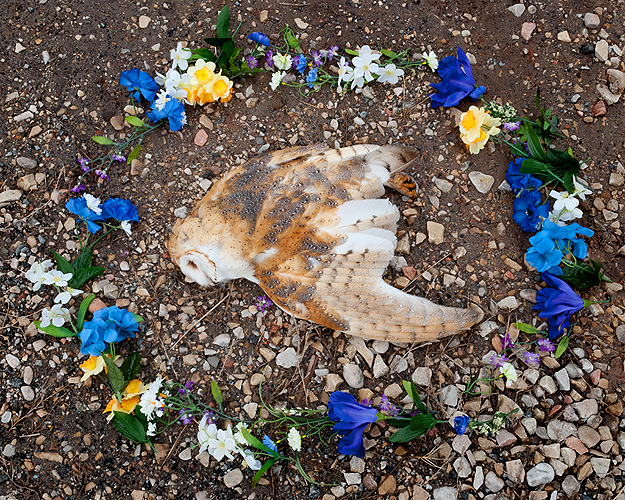 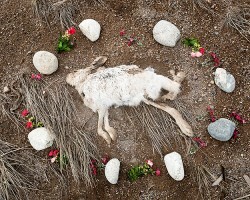 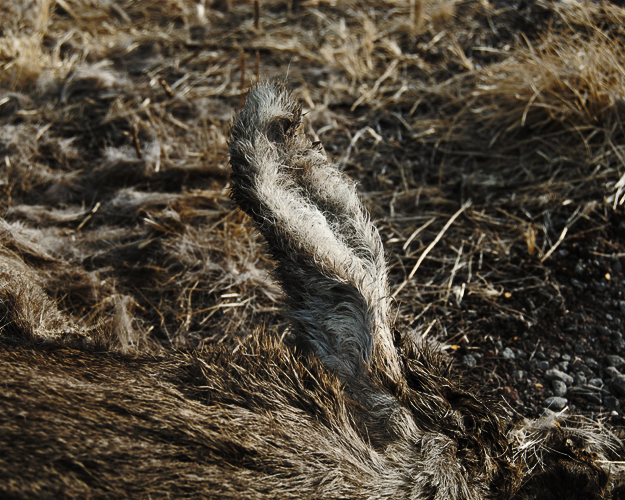 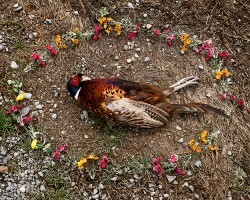 At Rest is a photographic series depicting roadkill on American highways and addressing our human fear of confronting death and viewing the dead. 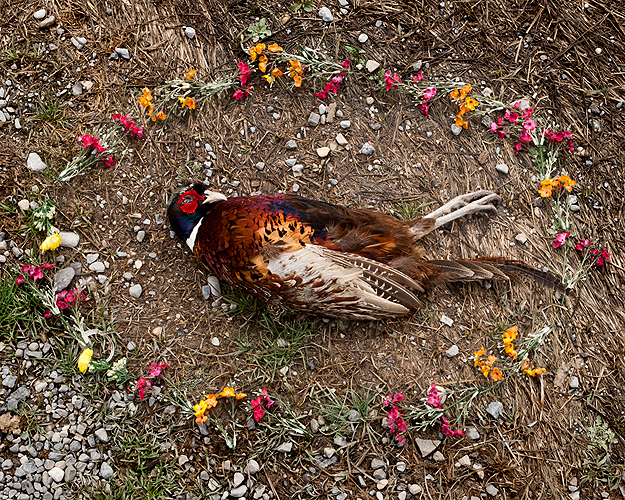 My images draw attention to the fact that, while man has a vast impact on animal and natural life, the dominant religion in America insists that animals do not have a place in Heaven and are, therefore, of little value in our society. 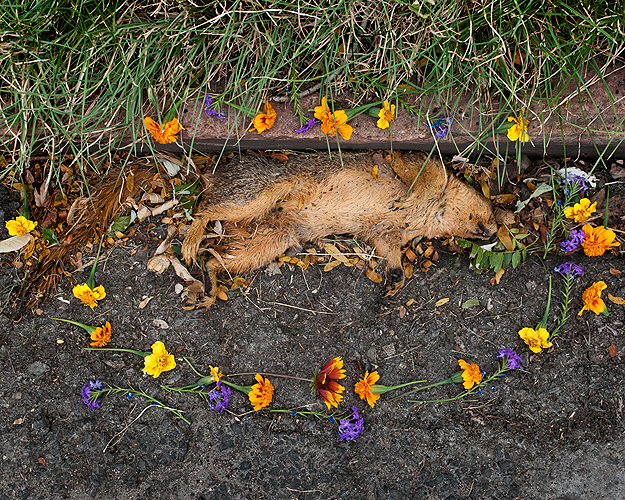 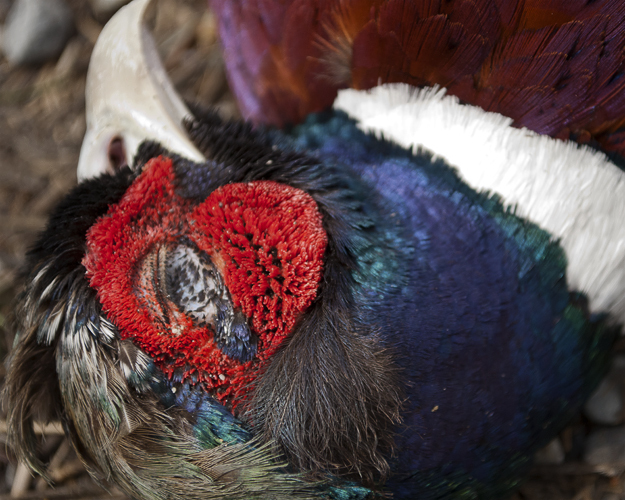 To cause the viewer to feel struck by this truth, I photograph memorials I have built surrounding roadkill at the location at which its life was taken. 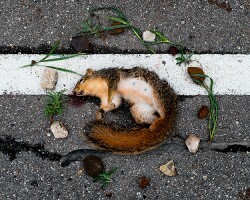 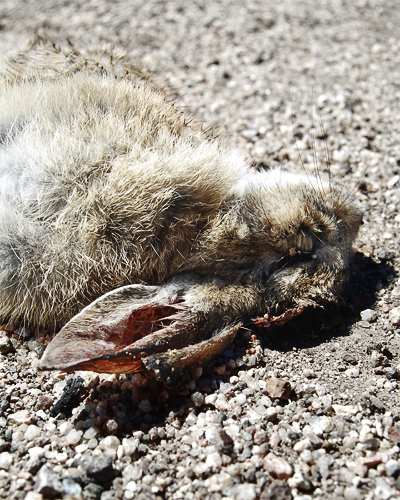 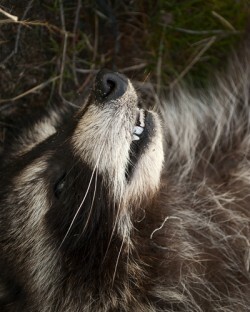 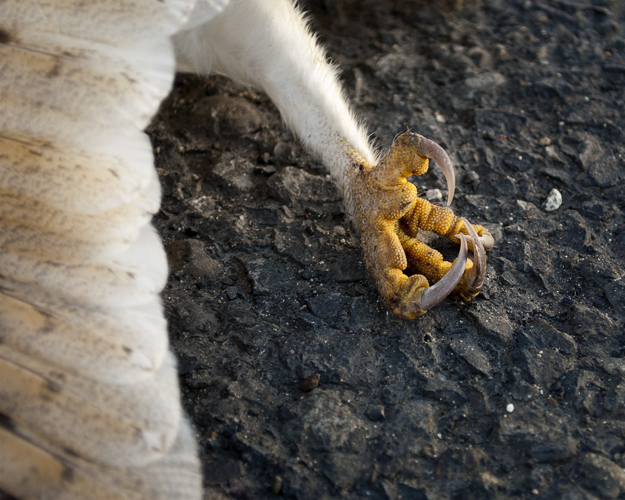 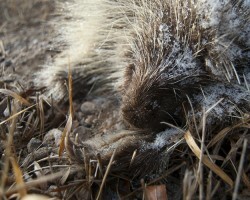 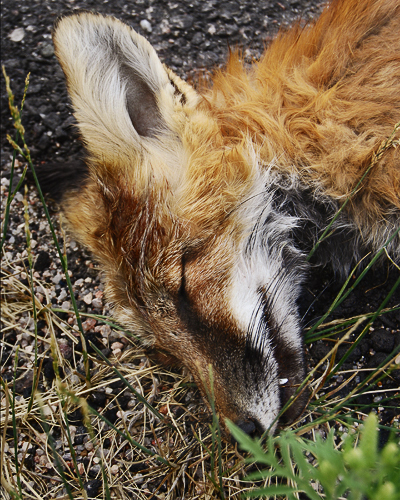 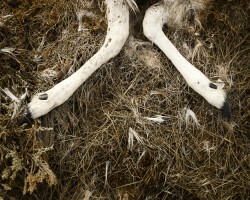 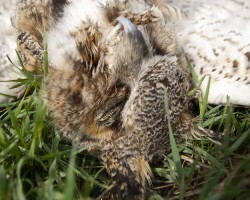 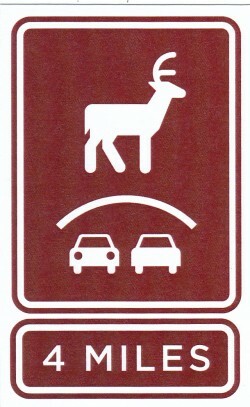 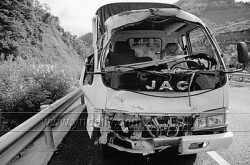 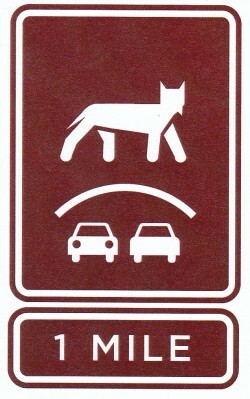 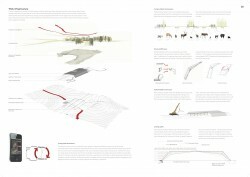 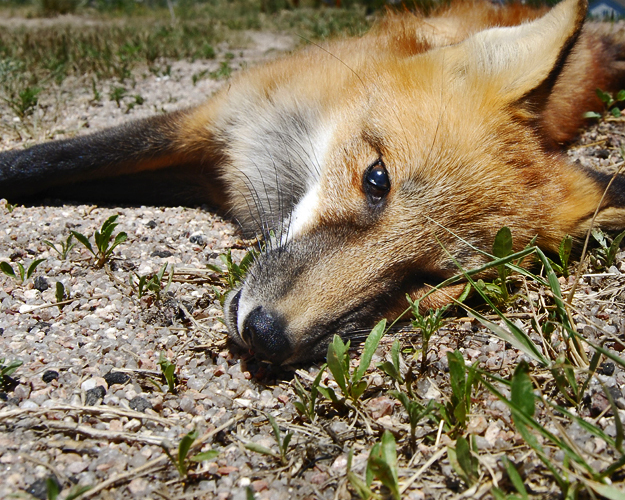 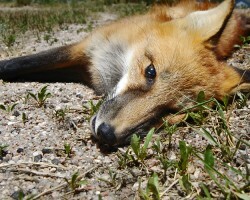 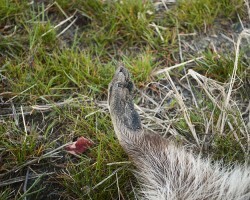 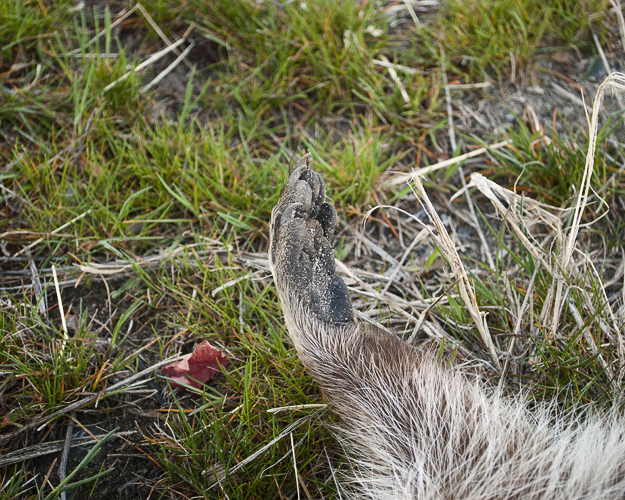 At Rest expresses the sacredness to the bodies of animals accidentally hit by vehicles while crossing the road. 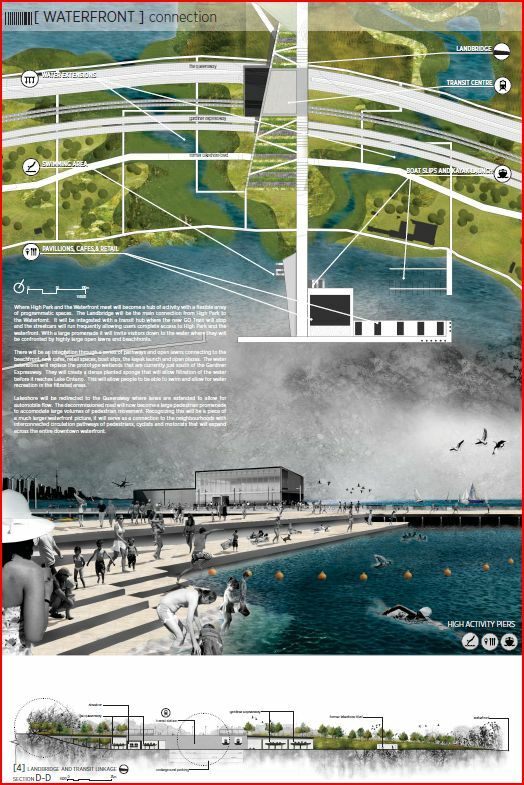 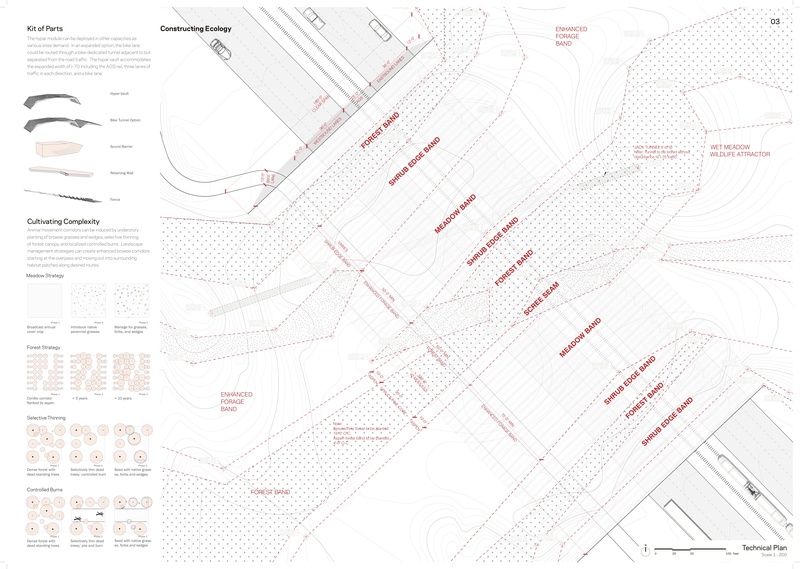 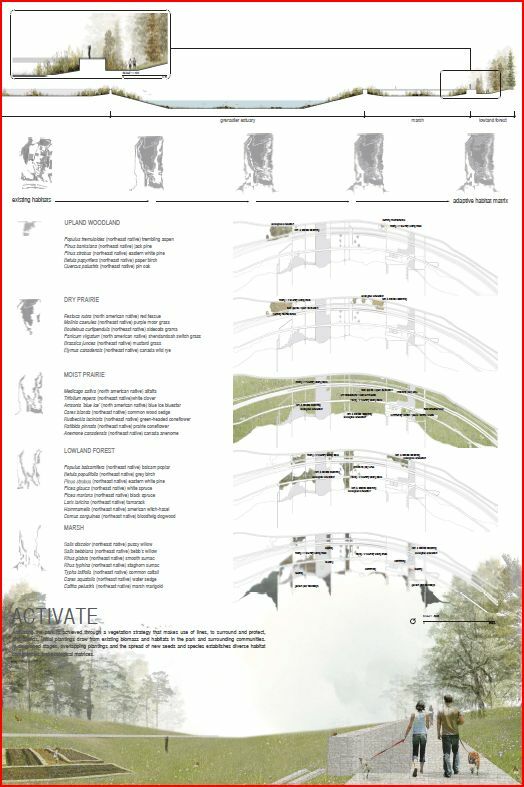 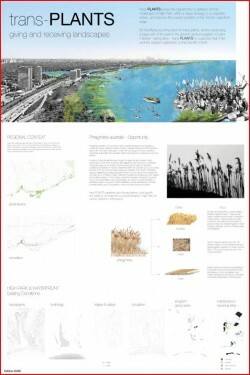 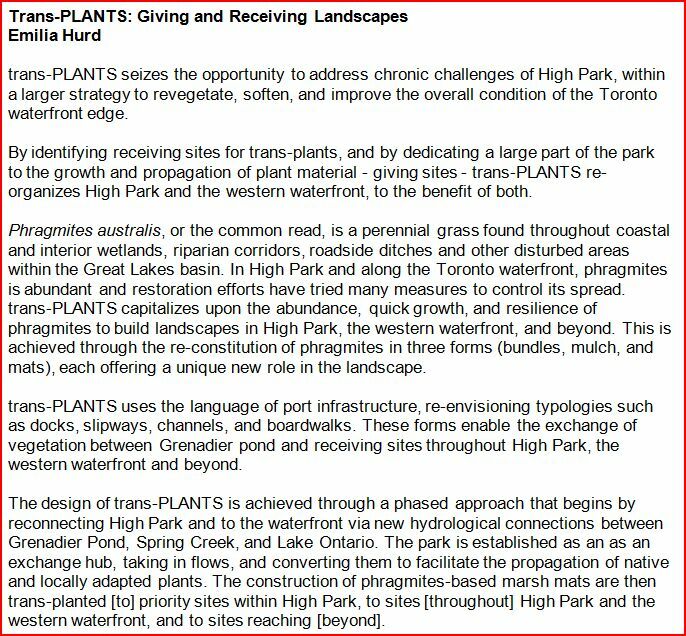 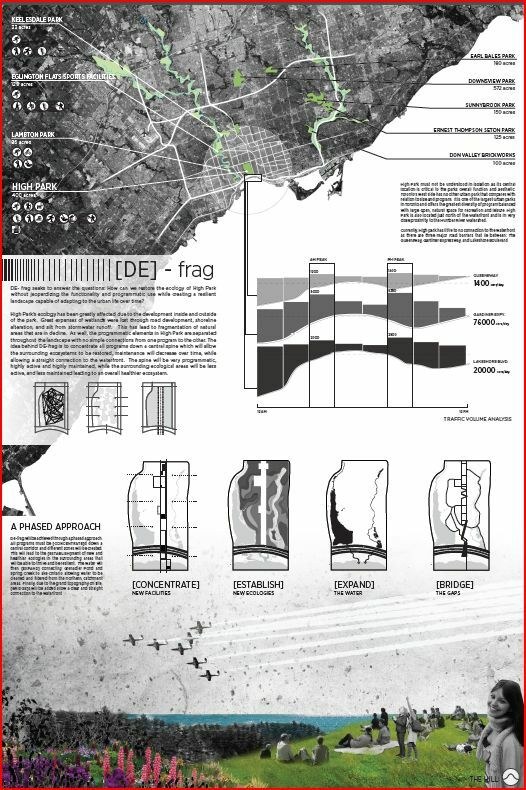 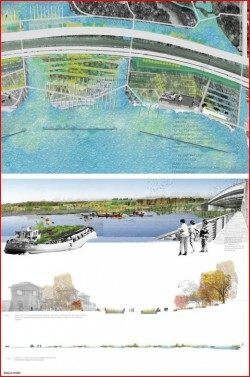 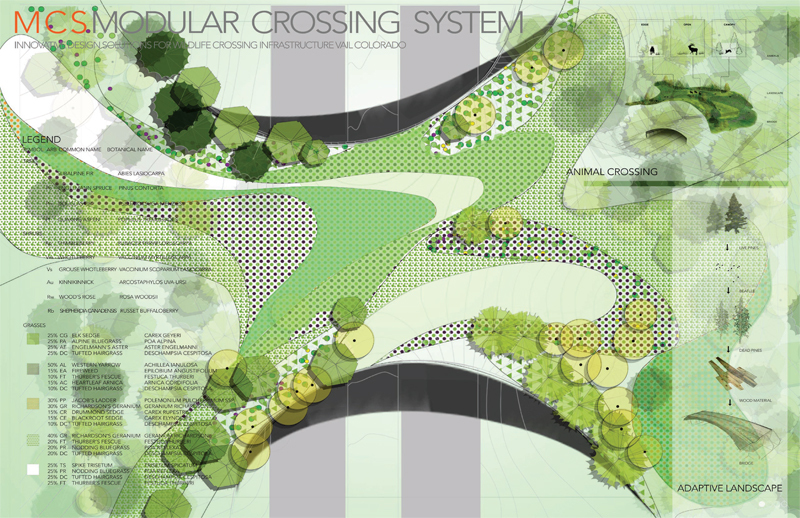 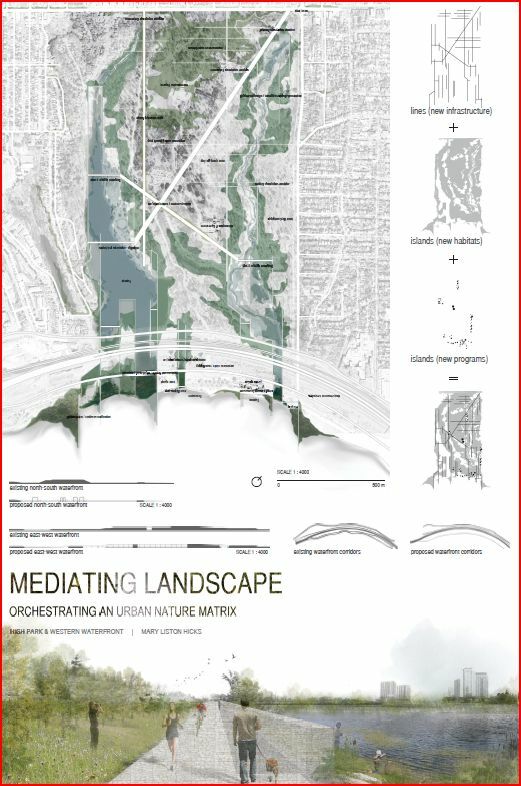 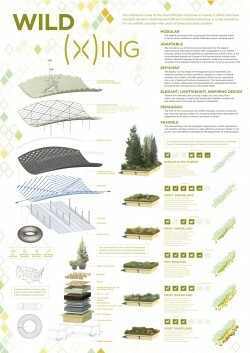 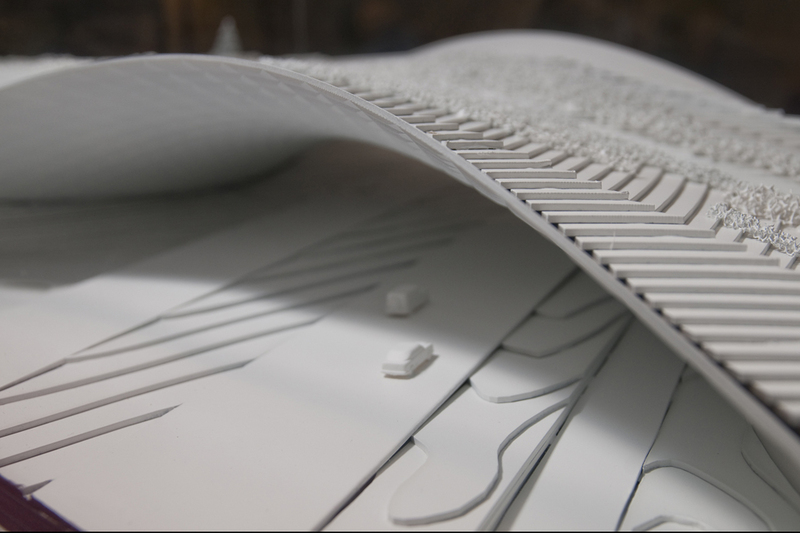 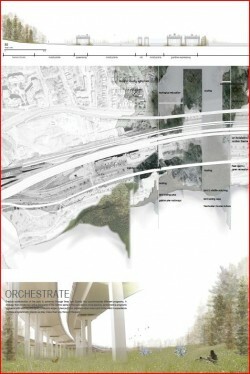 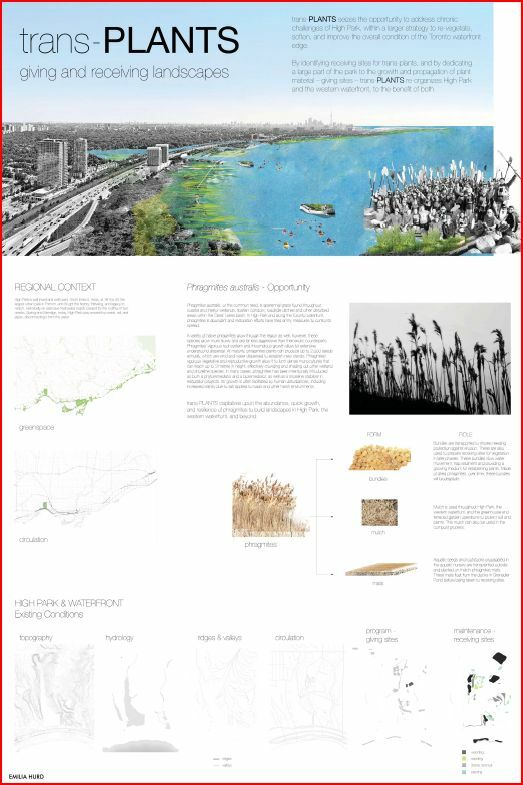 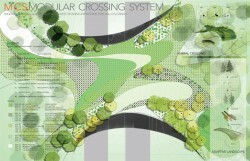 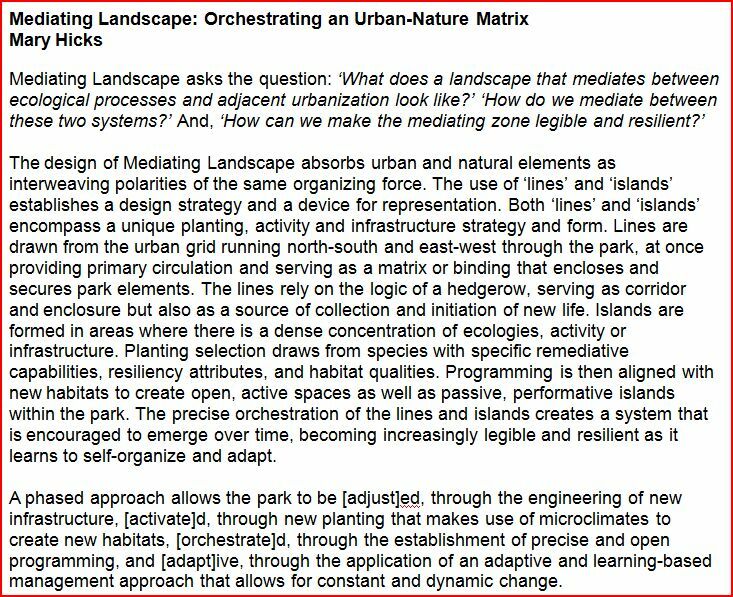 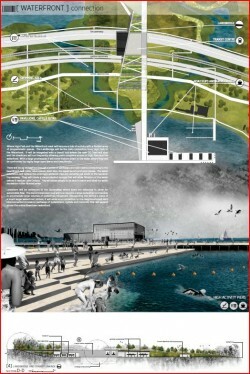 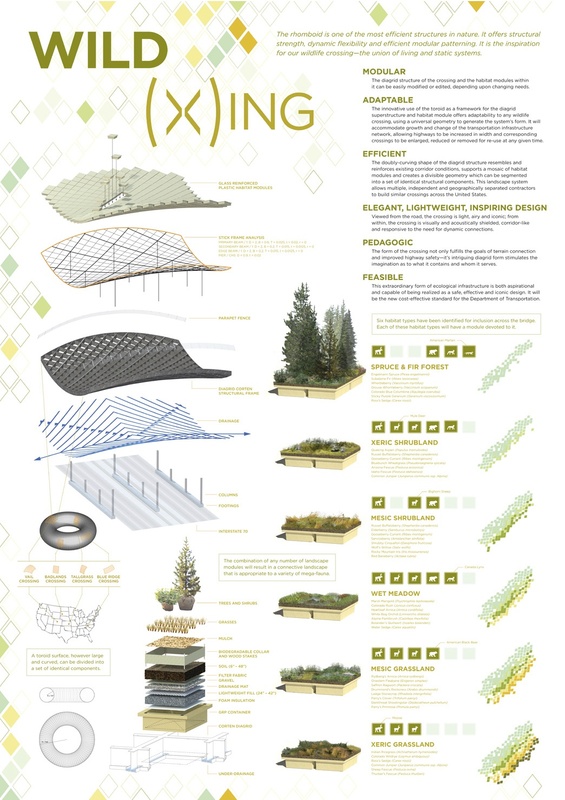 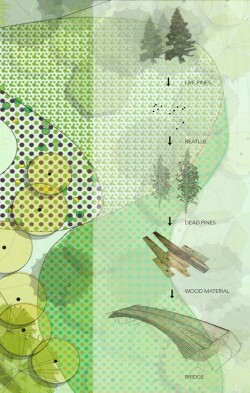 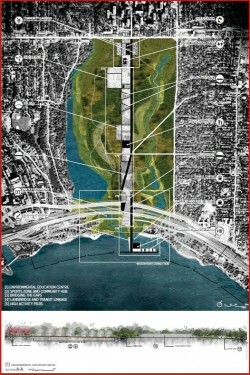 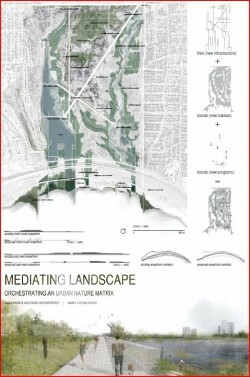 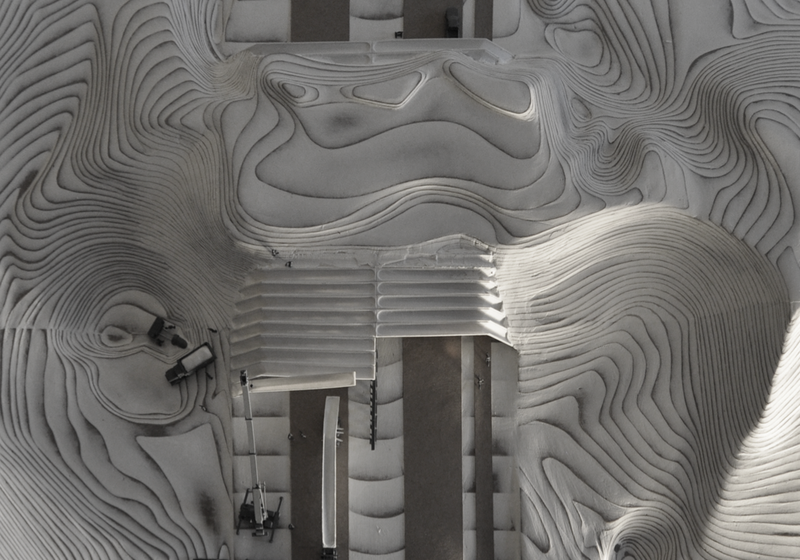 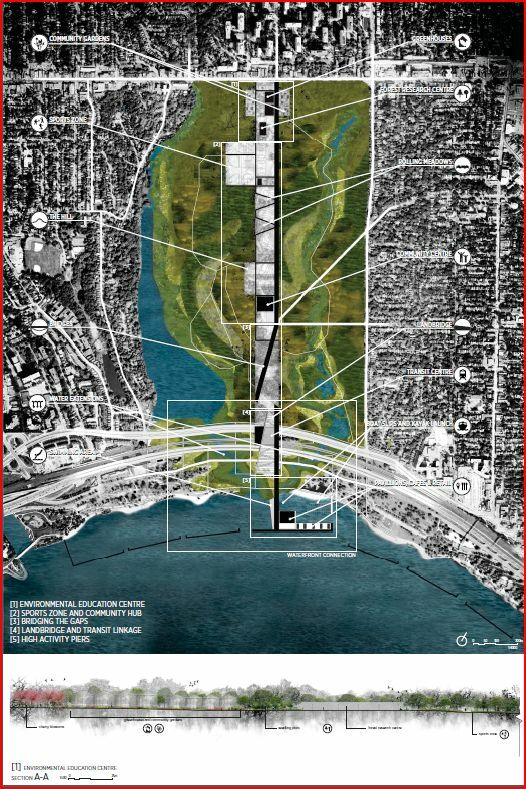 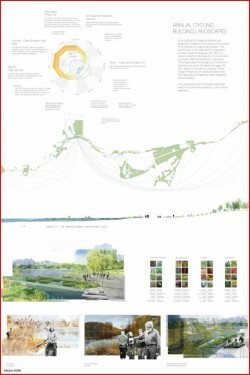 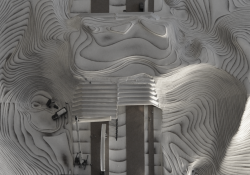 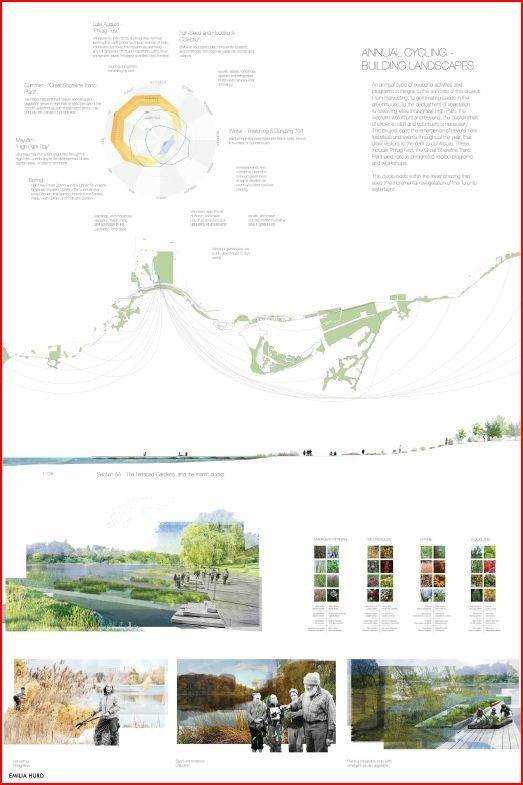 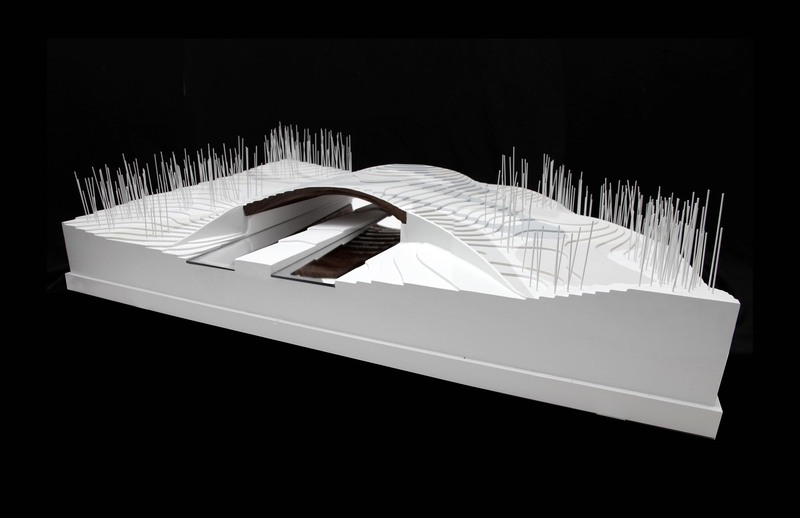 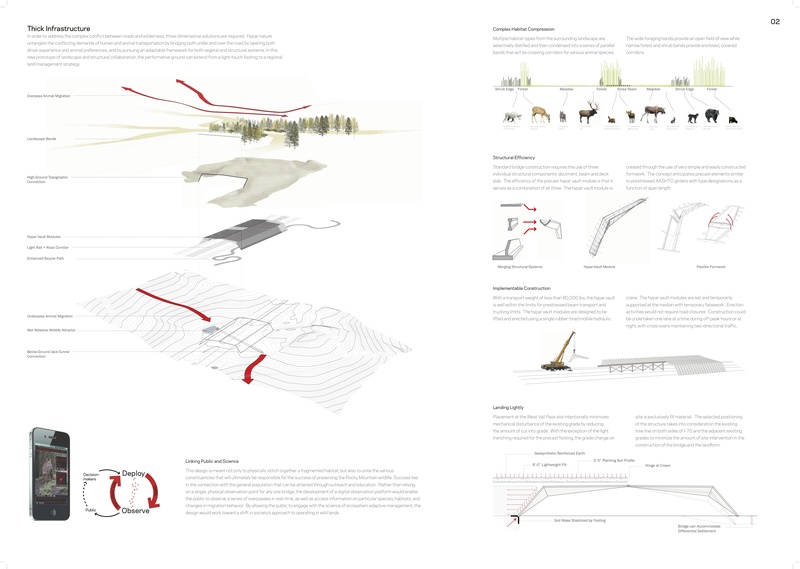 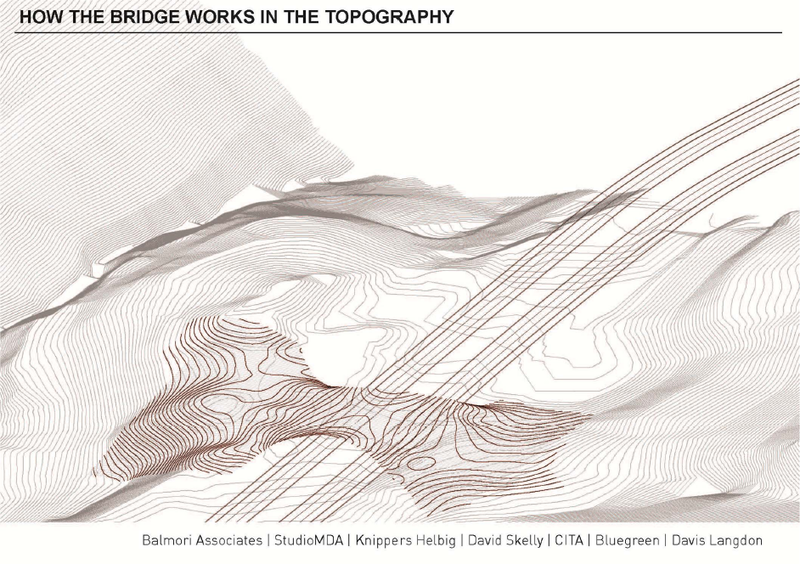 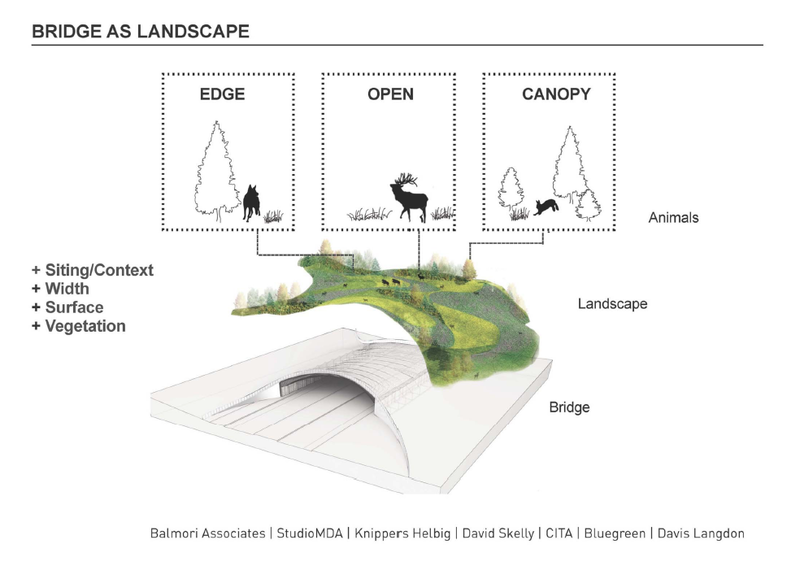 New crossing concepts generated by students in "Connective Landscapes," a design studio course taught by Peter North, Assistant Professor, Landscape Architecture, University of Toronto, and founder of the North Design Office in Toronto. 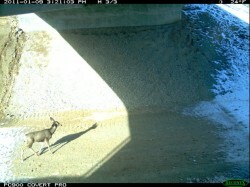 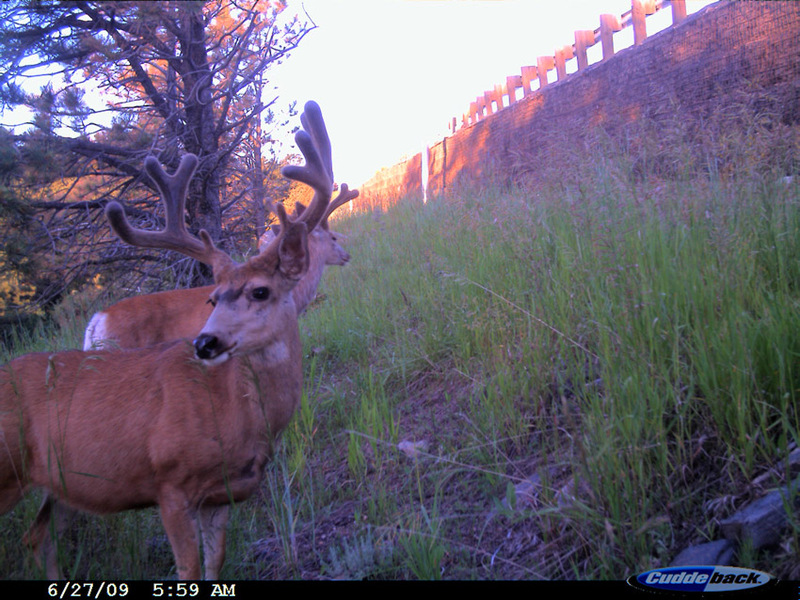 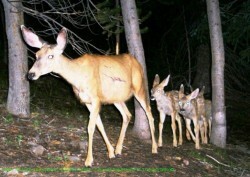 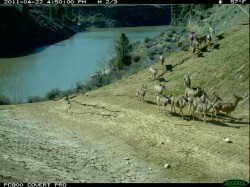 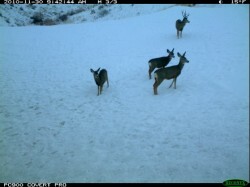 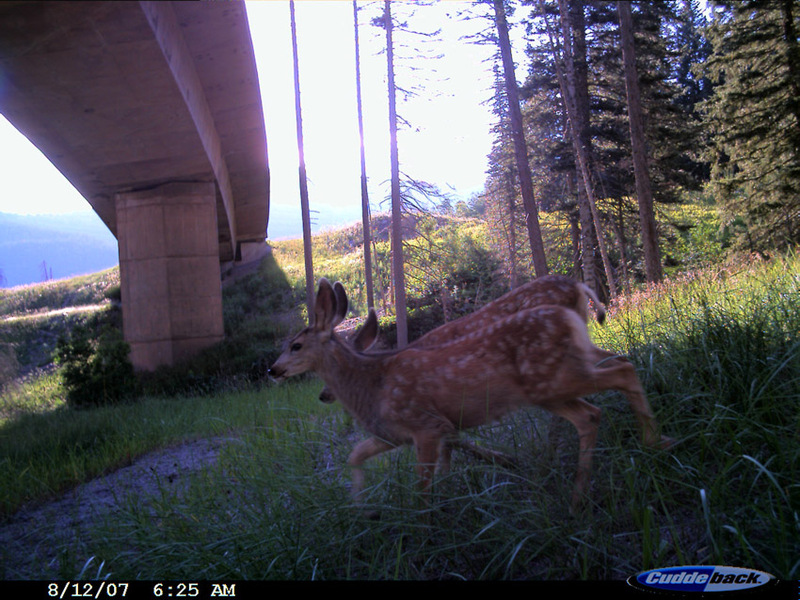 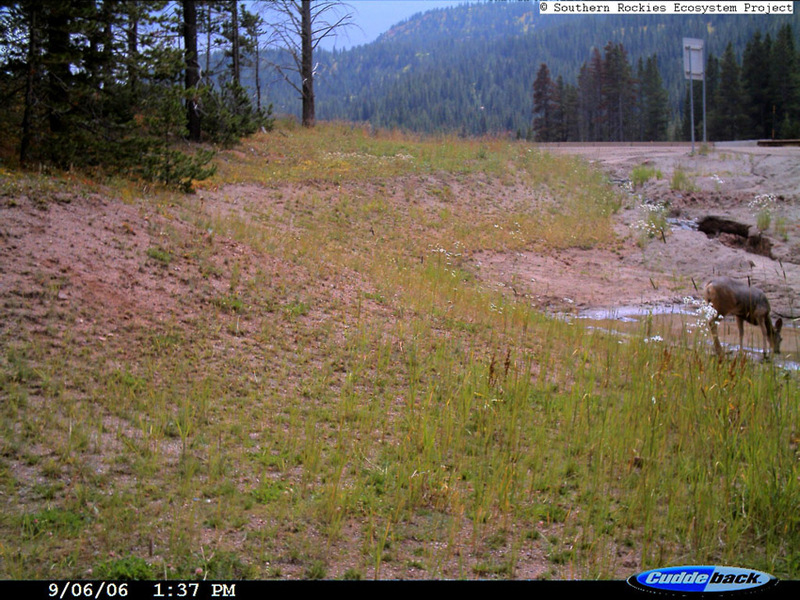 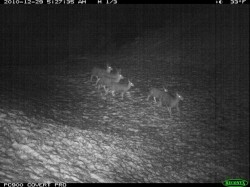 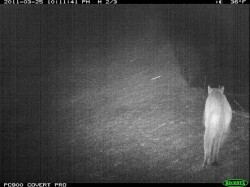 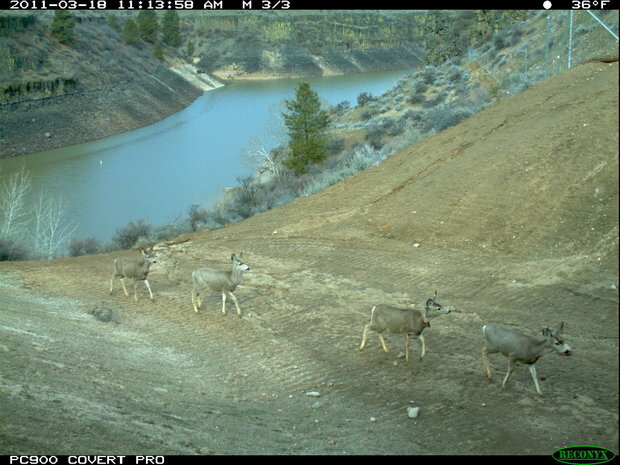 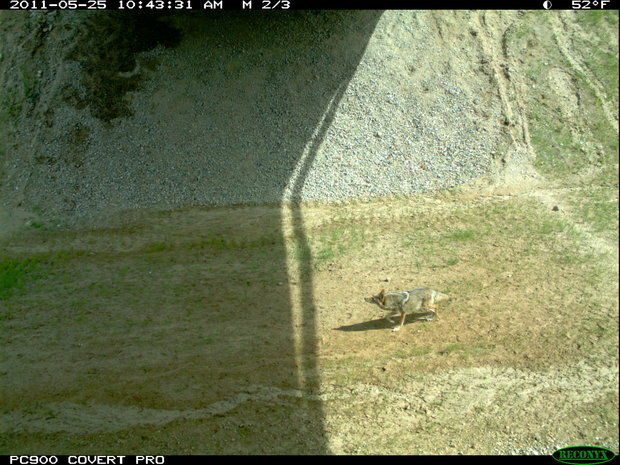 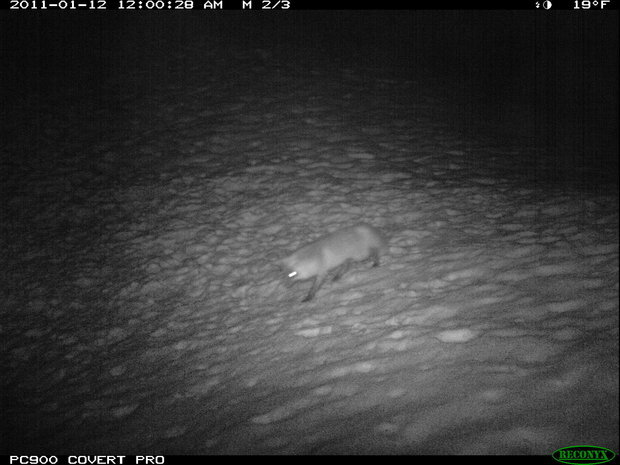 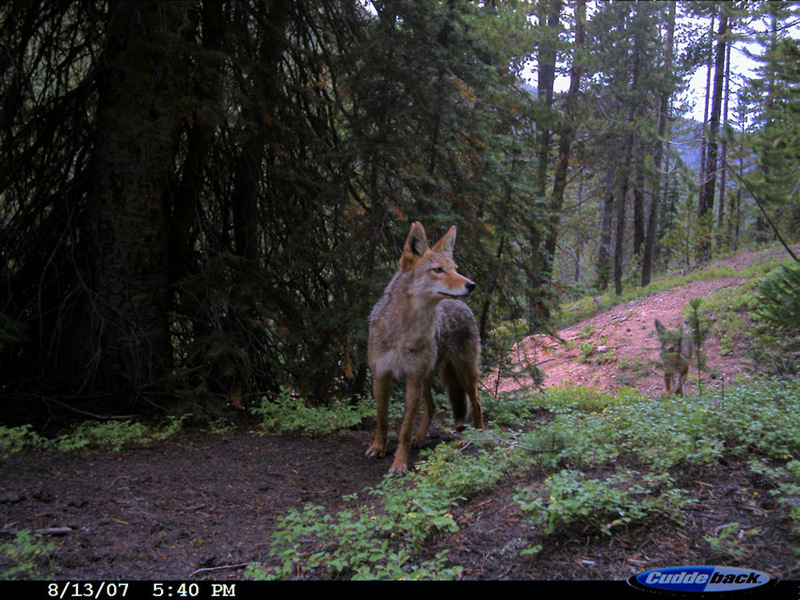 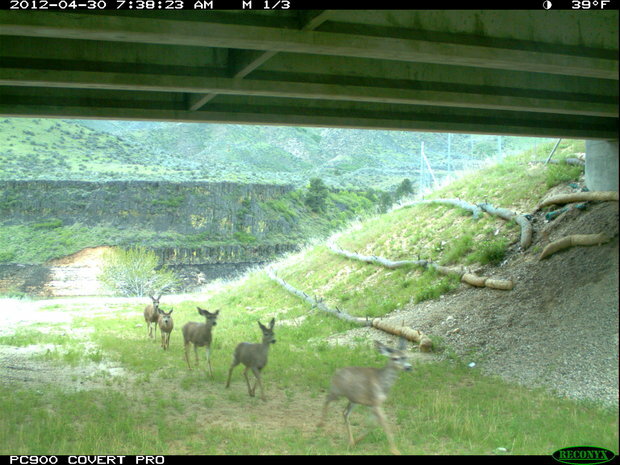 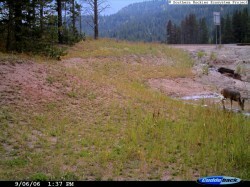 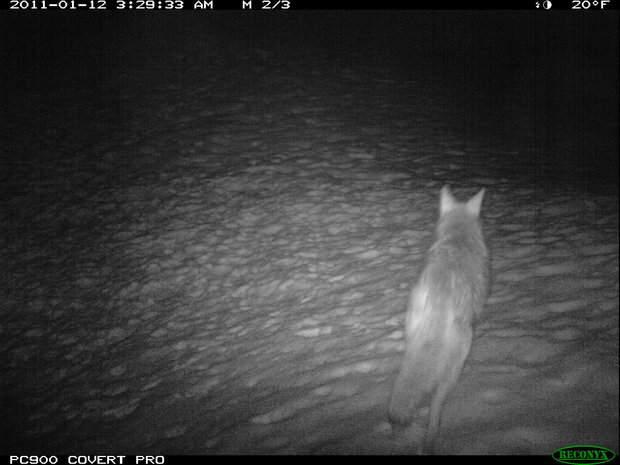 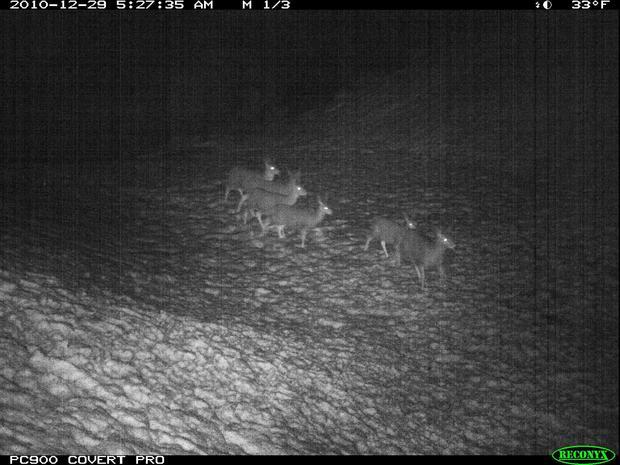 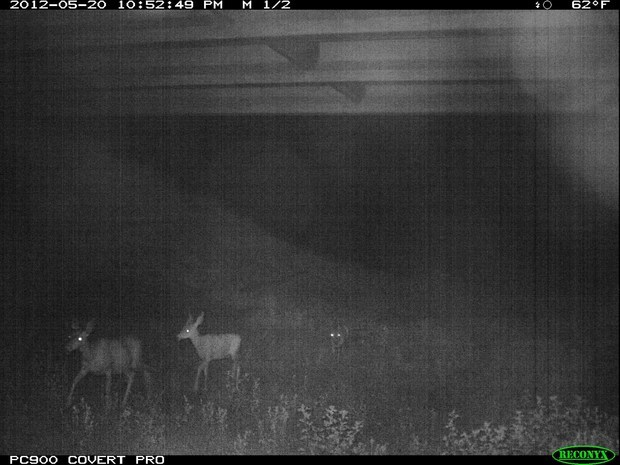 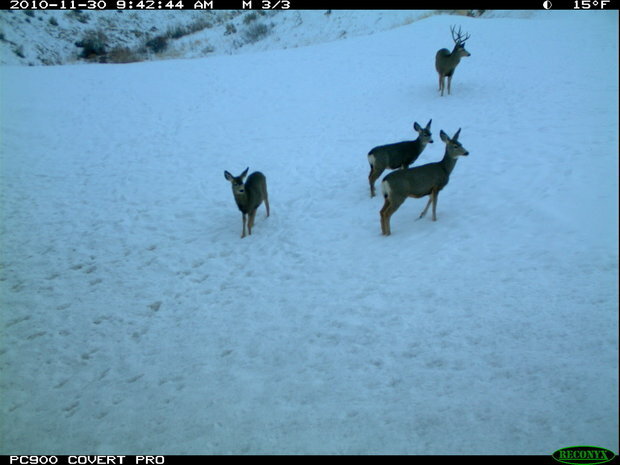 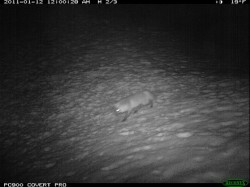 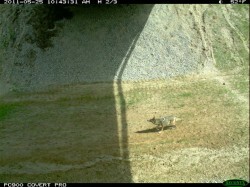 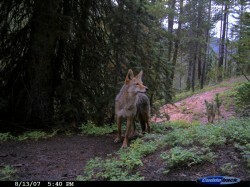 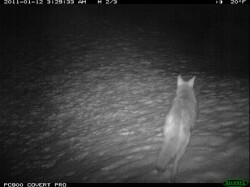 Idaho Fish and Game wildlife cameras have captured images of deer and elk passing under the highway, as well as a mountain lion, coyotes, foxes and quail. 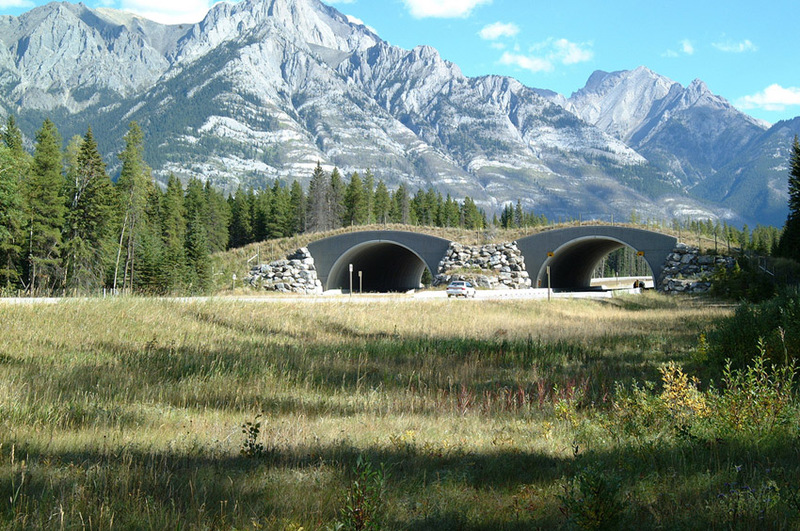 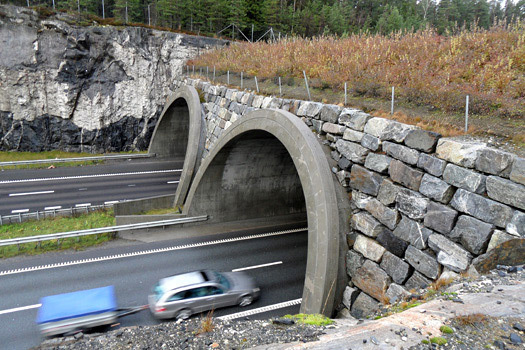 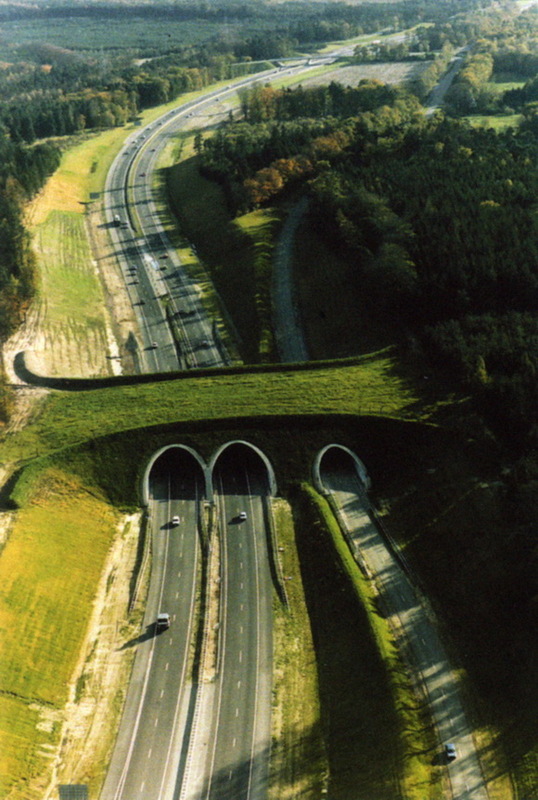 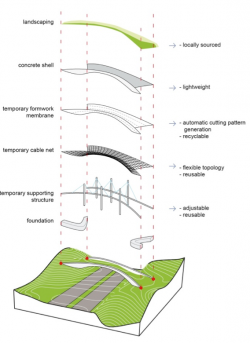 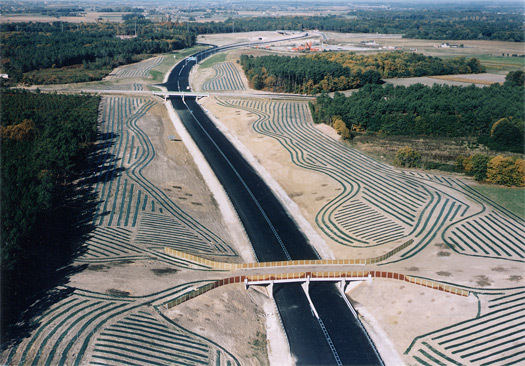 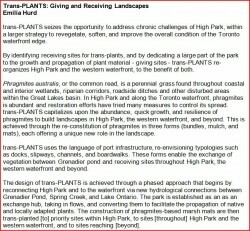 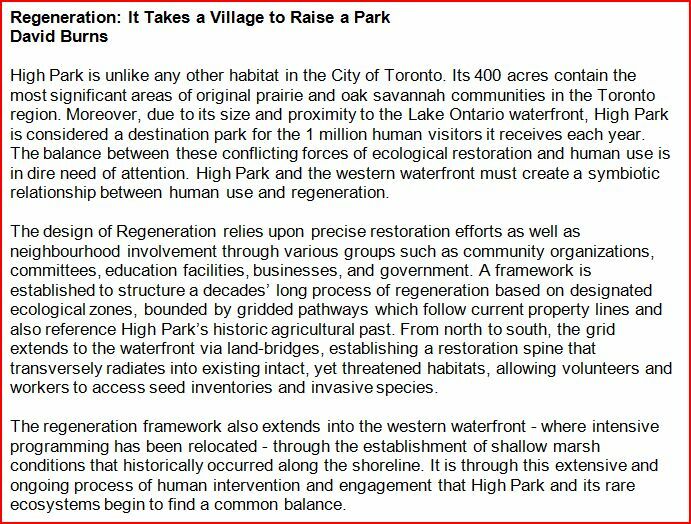 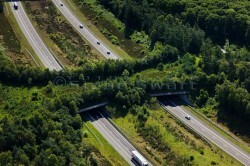 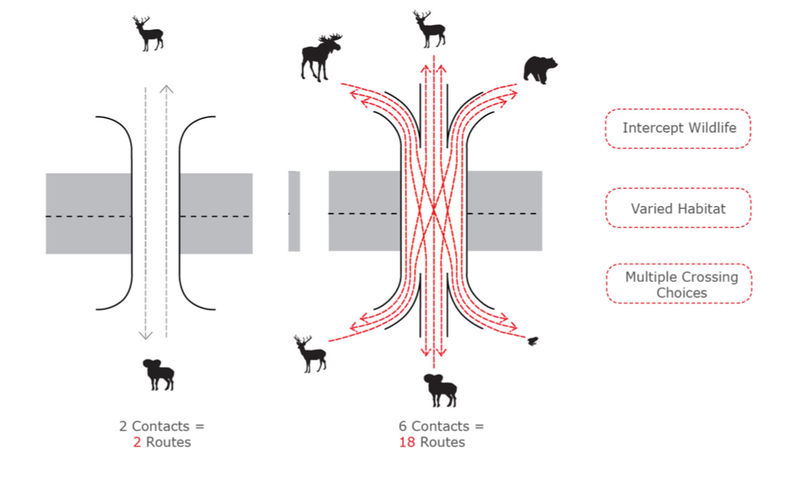 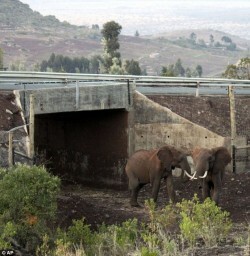 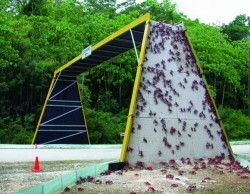 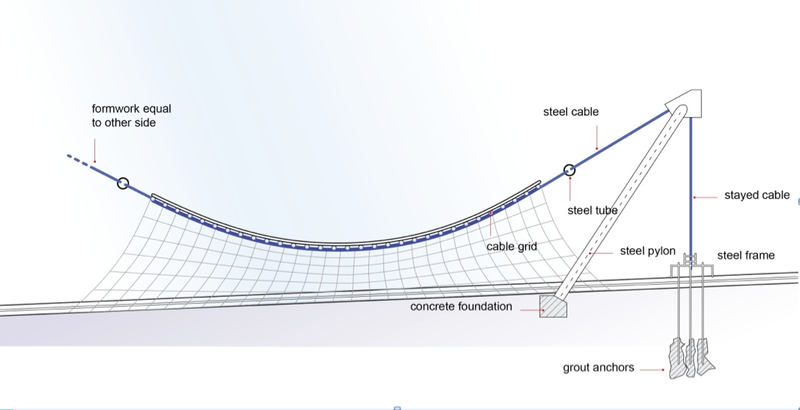 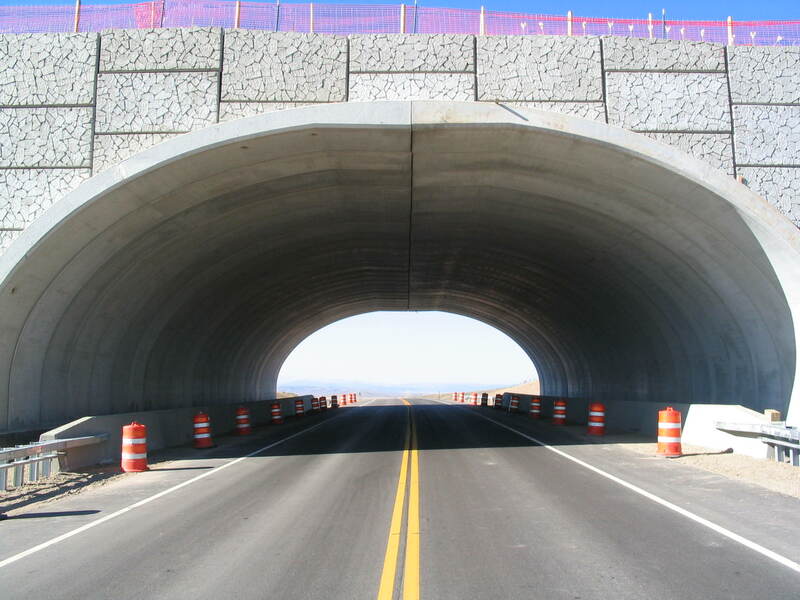 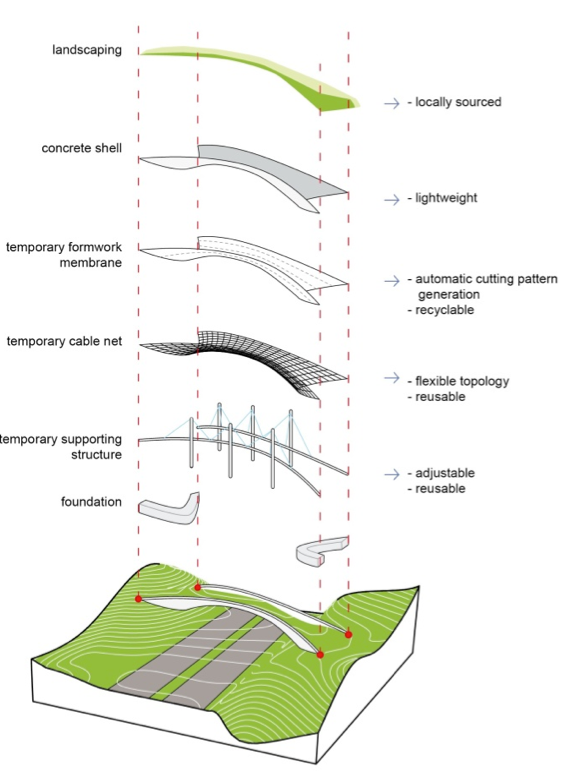 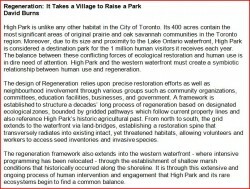 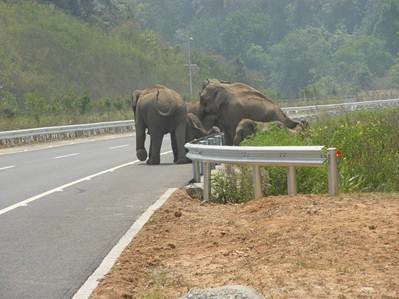 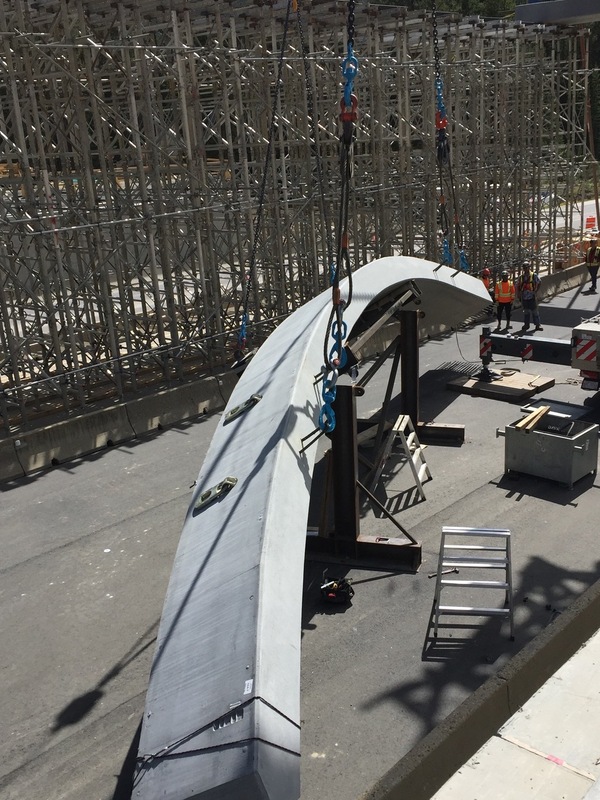 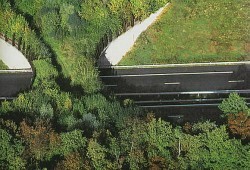 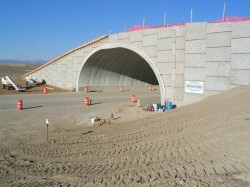 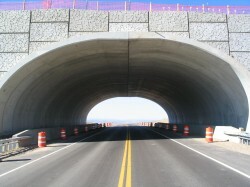 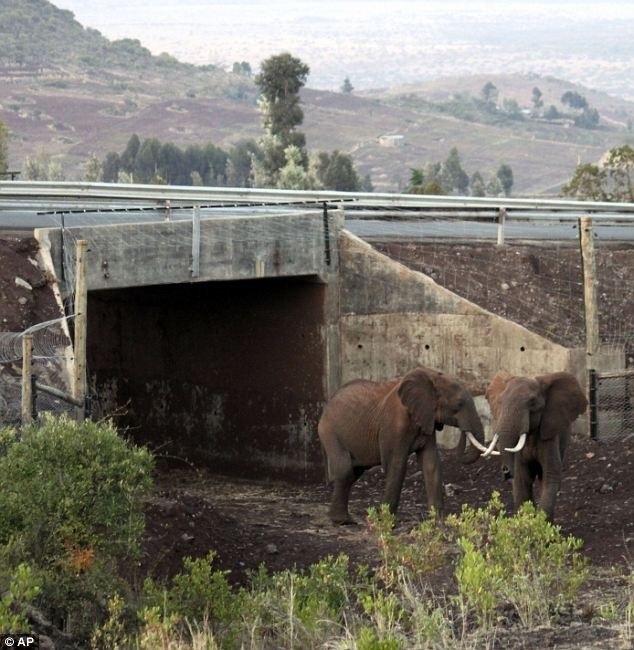 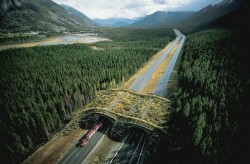 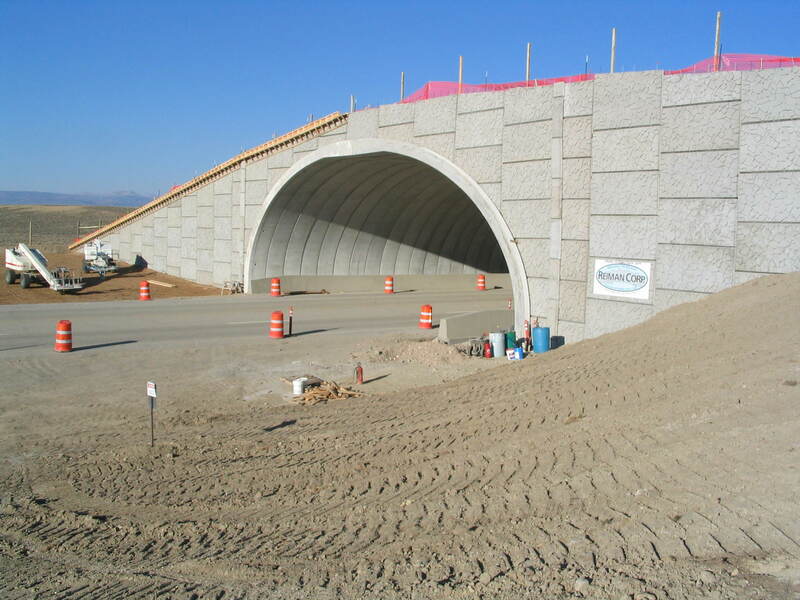 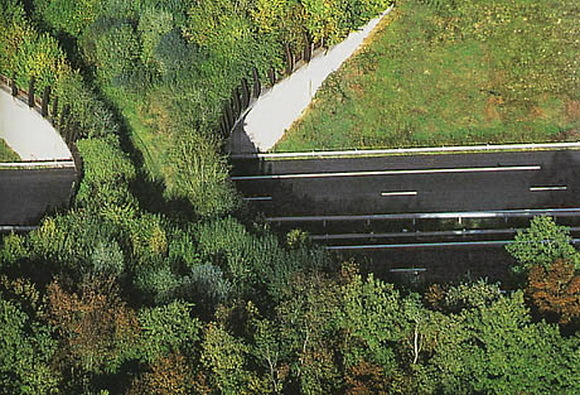 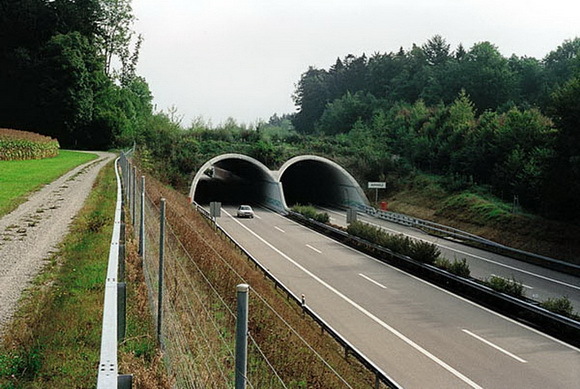 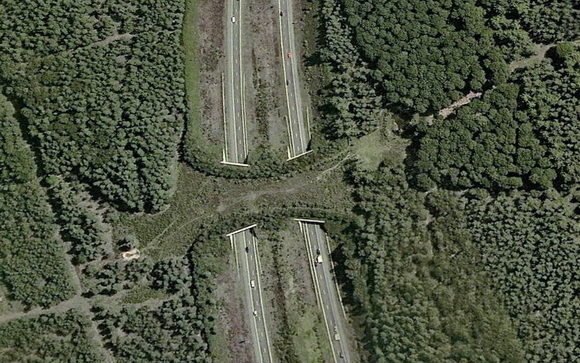 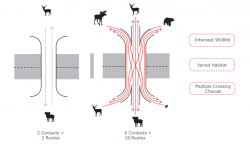 Wildlife crossing structures take many forms around the world; there are global solutions to providing safe passage. 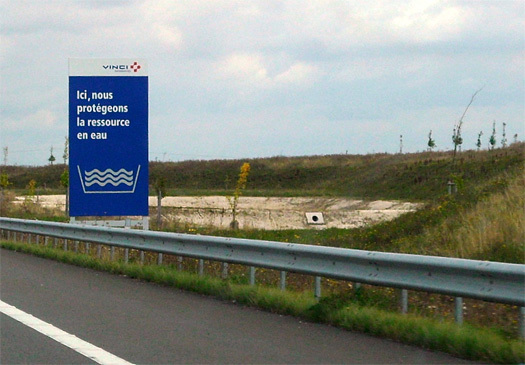 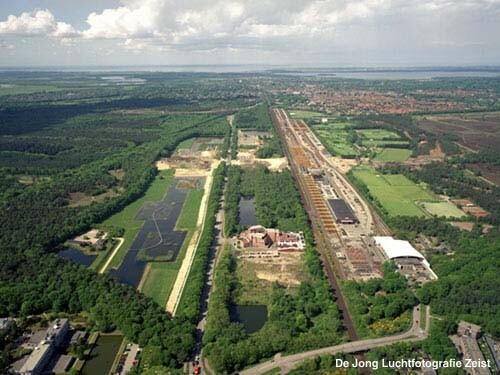 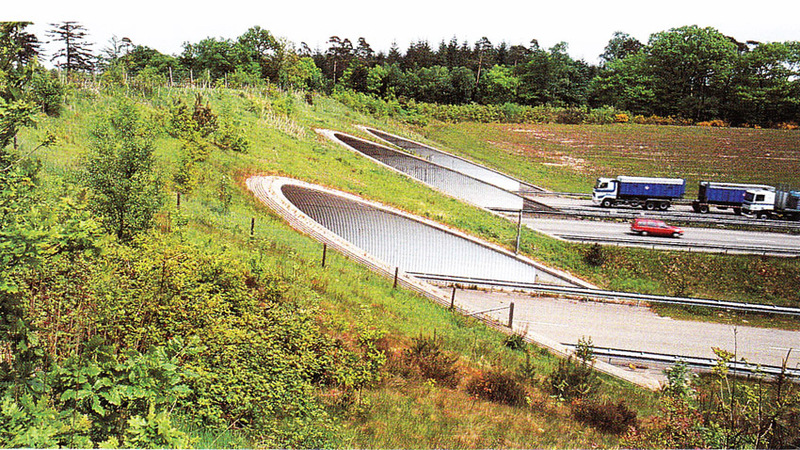 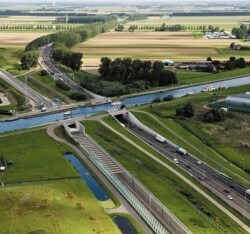 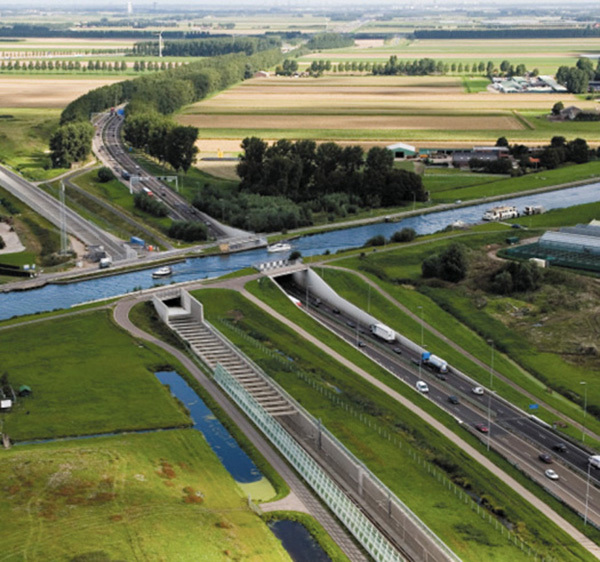 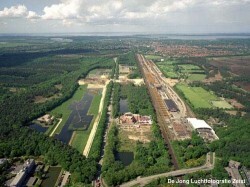 This example from the Netherlands incorporates a canal. 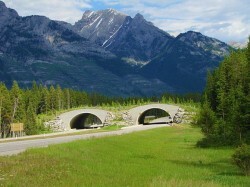 Banff National Park, Alberta, Canada, is a leader in the design and implementation of wildlife crossing structures in North America. 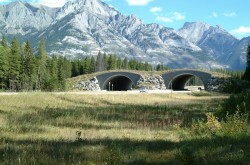 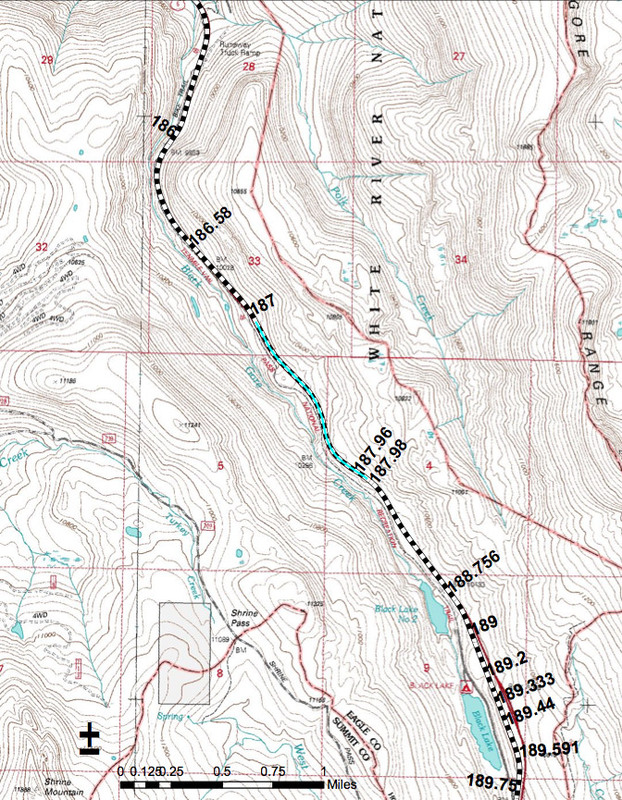 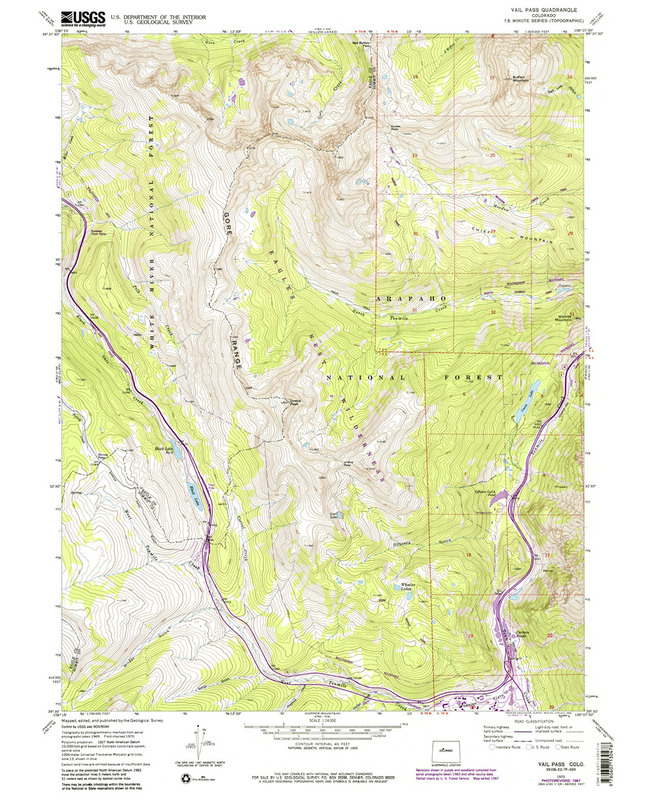 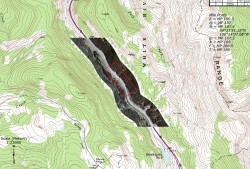 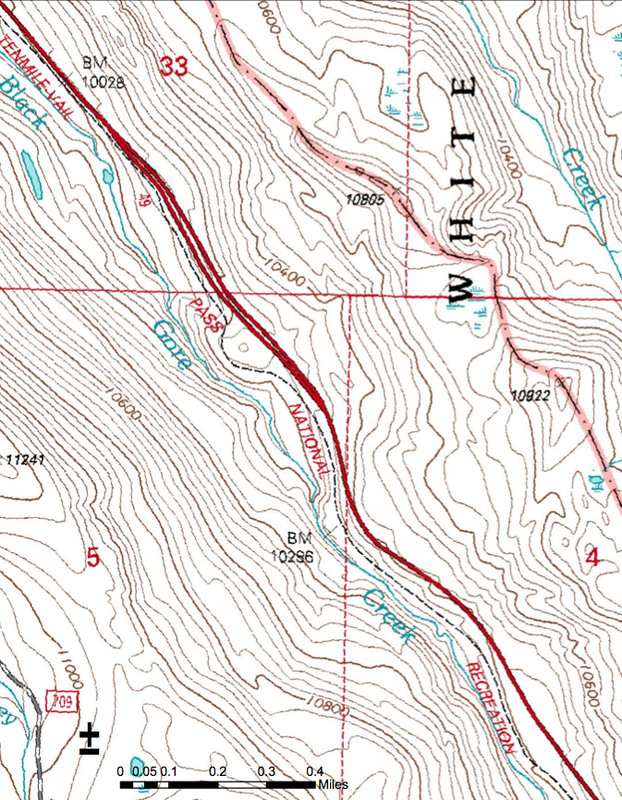 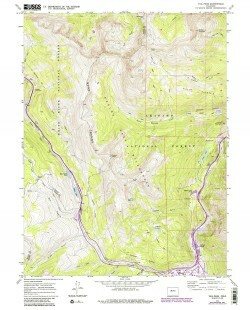 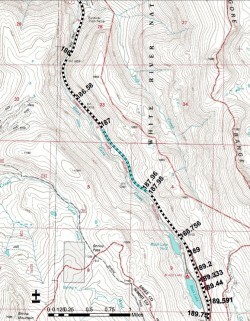 There are more than two dozen crossing structures over the TransCanada Highway through the Banff area. 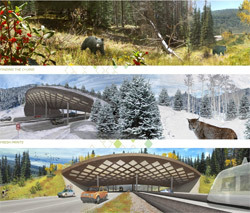 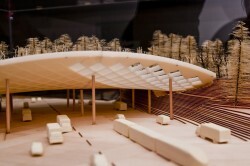 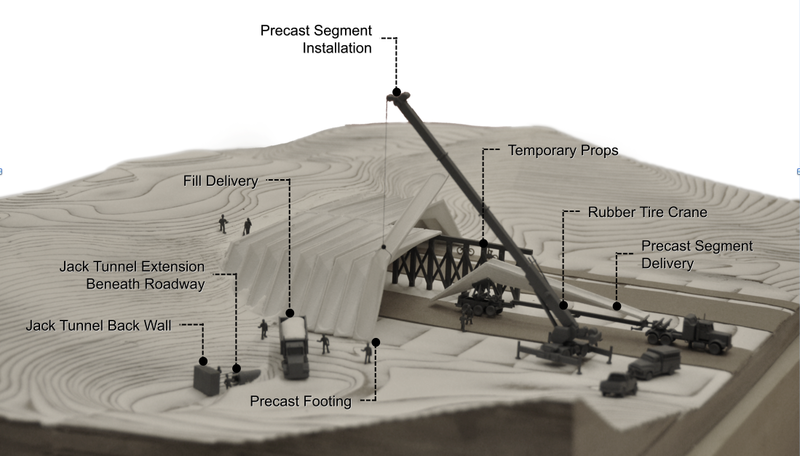 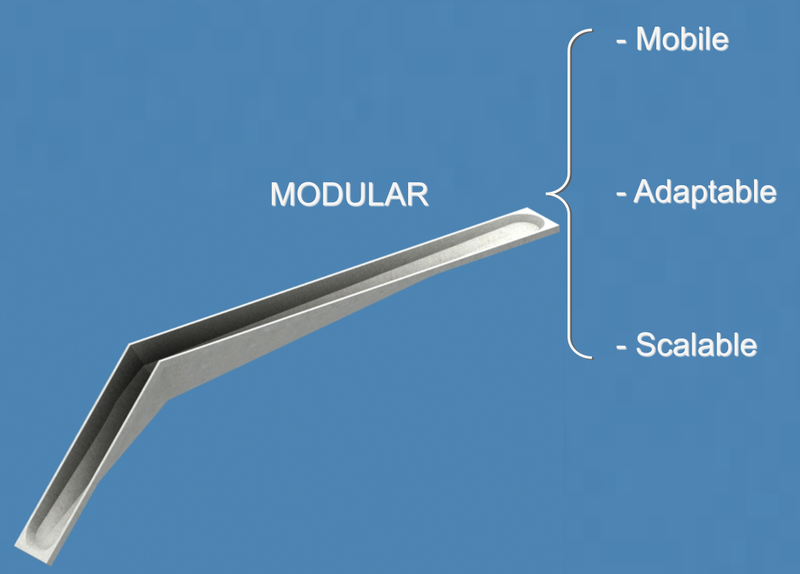 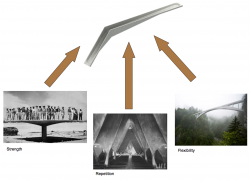 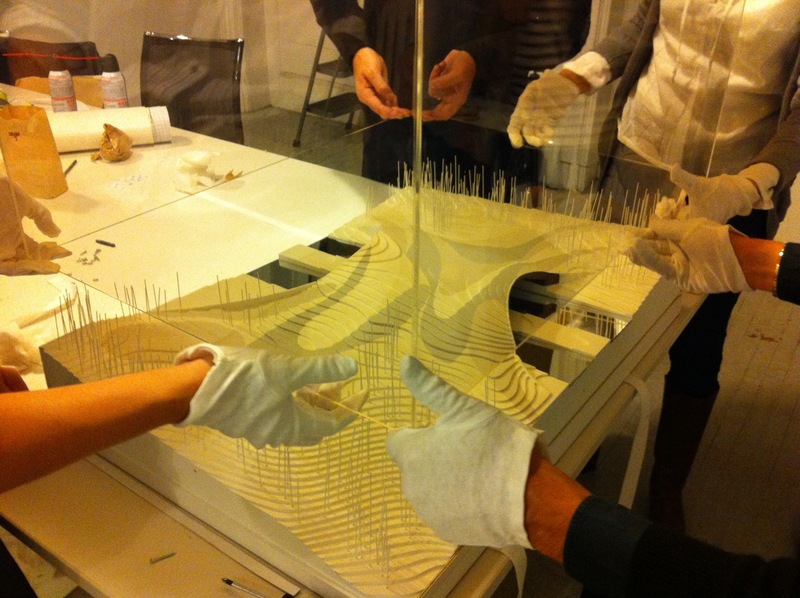 ARC is ushering in a new generation of transportation solutions using new methods, new materials, and new thinking. 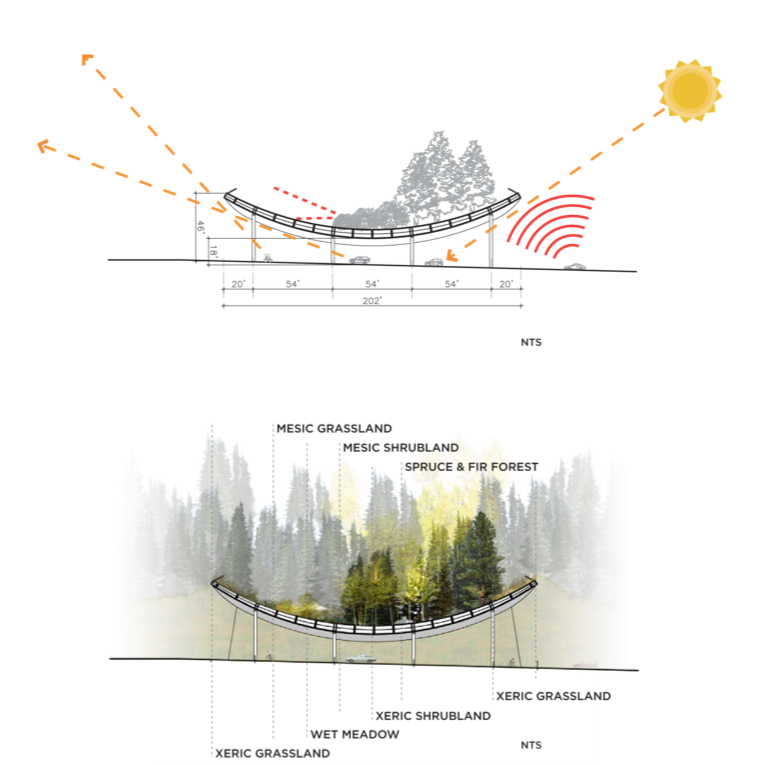 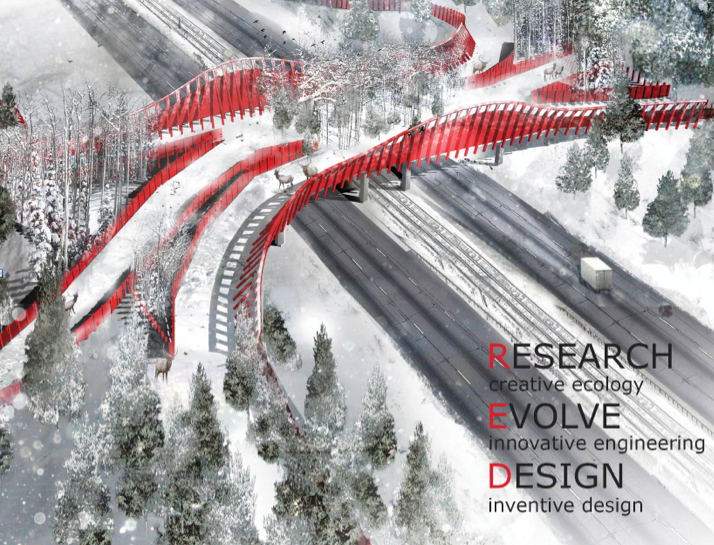 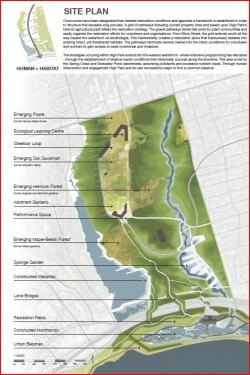 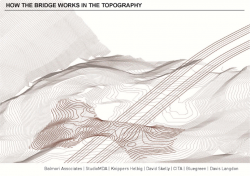 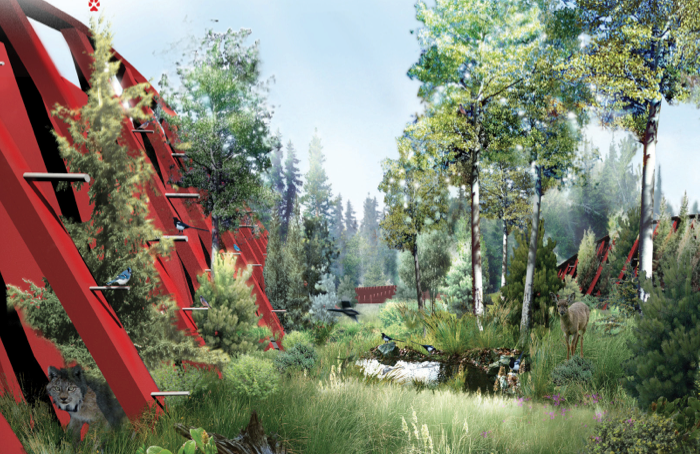 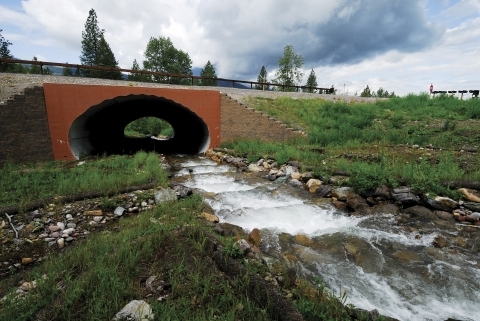 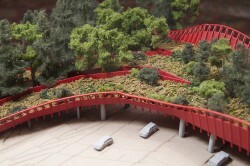 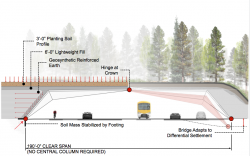 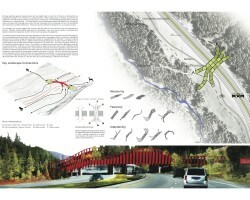 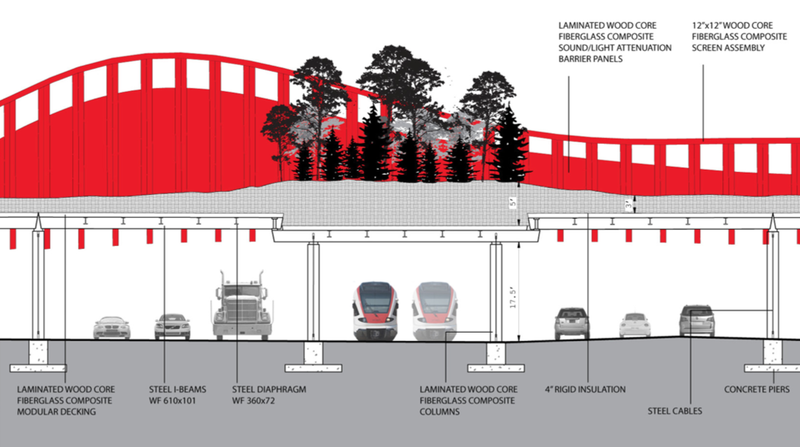 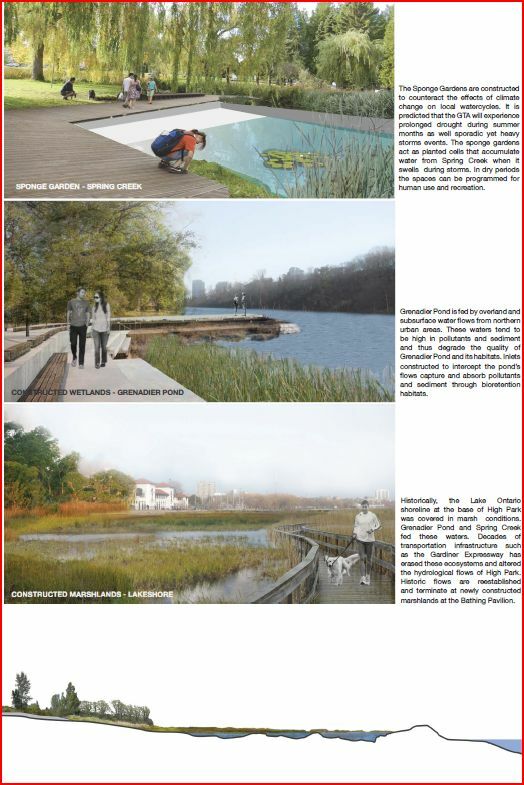 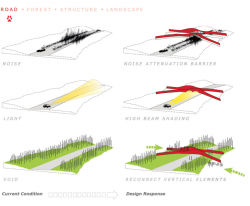 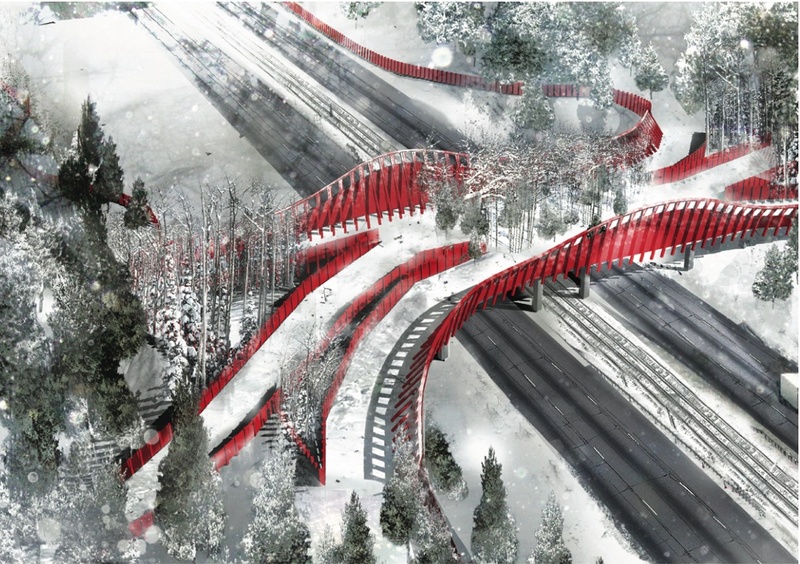 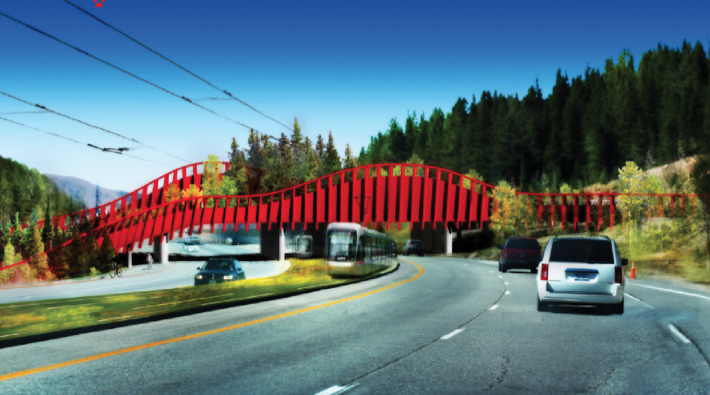 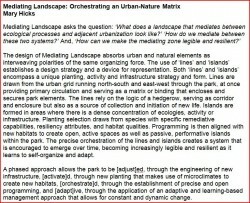 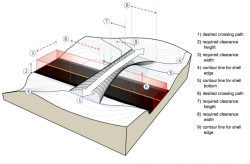 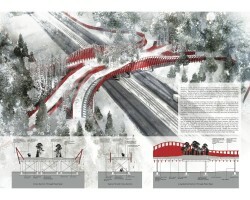 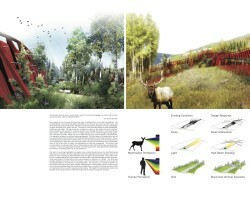 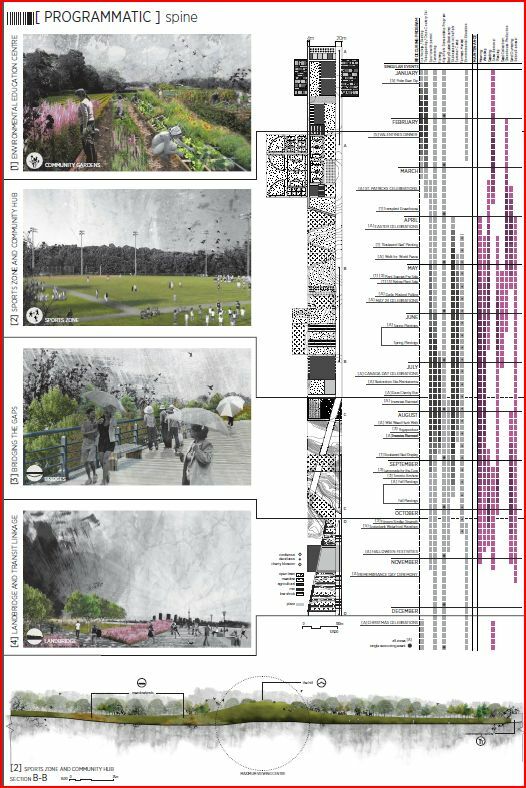 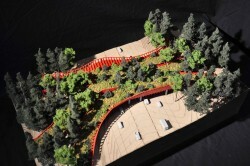 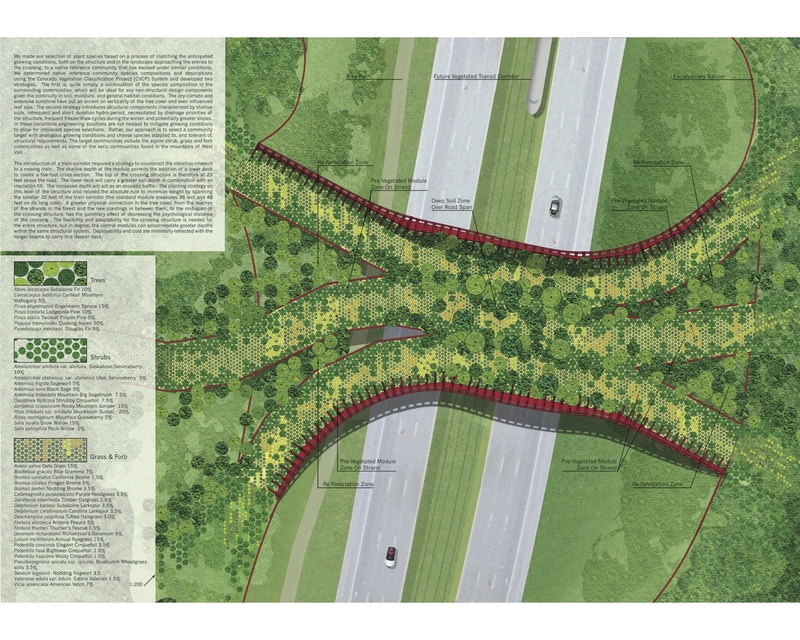 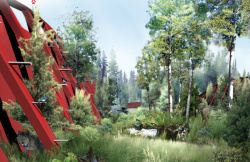 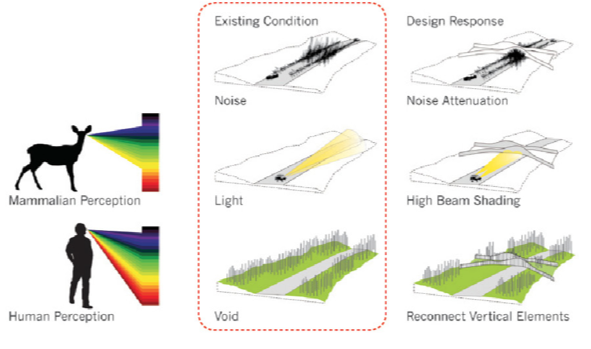 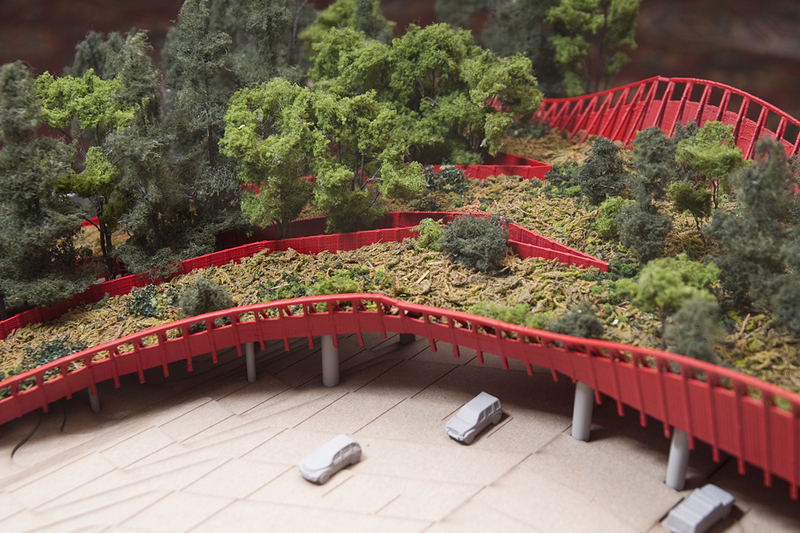 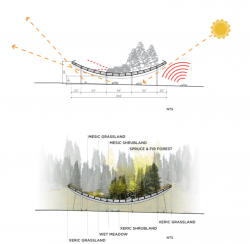 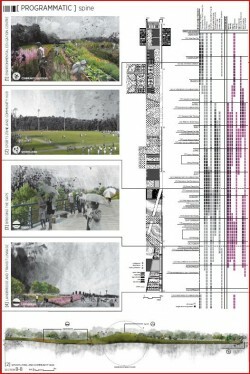 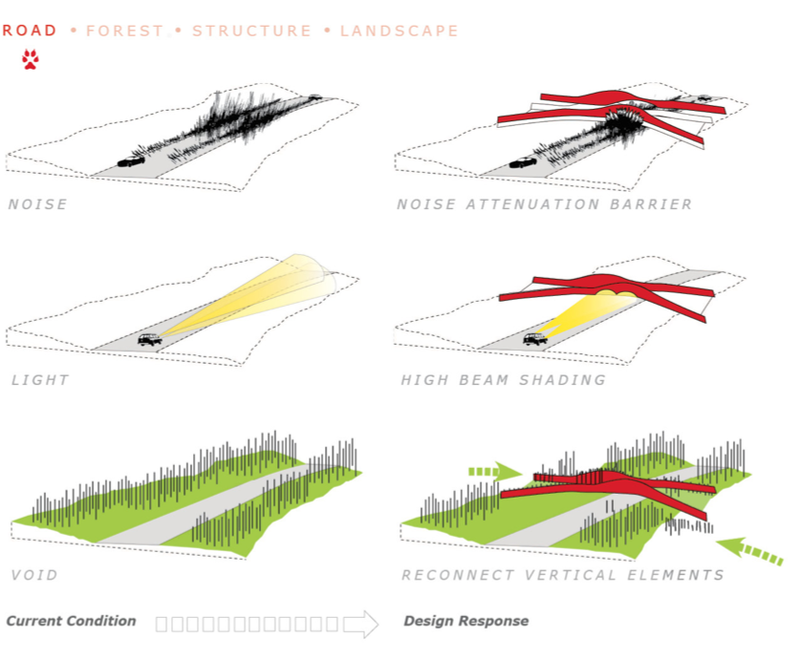 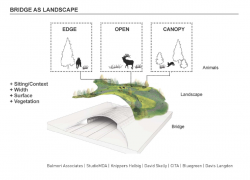 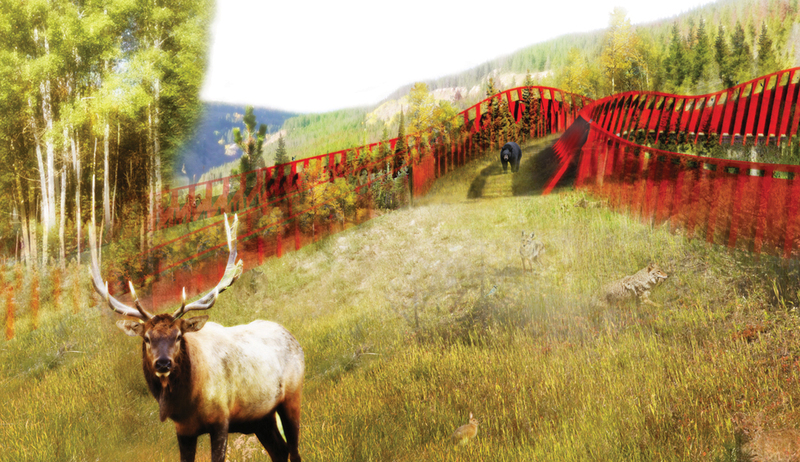 The bright red of Rosenberg’s proposed bridge pops for humans, drawing attention to this new kind of landscape element, but reads as gray to other mammals, blending into its surroundings. 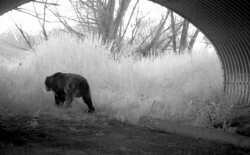 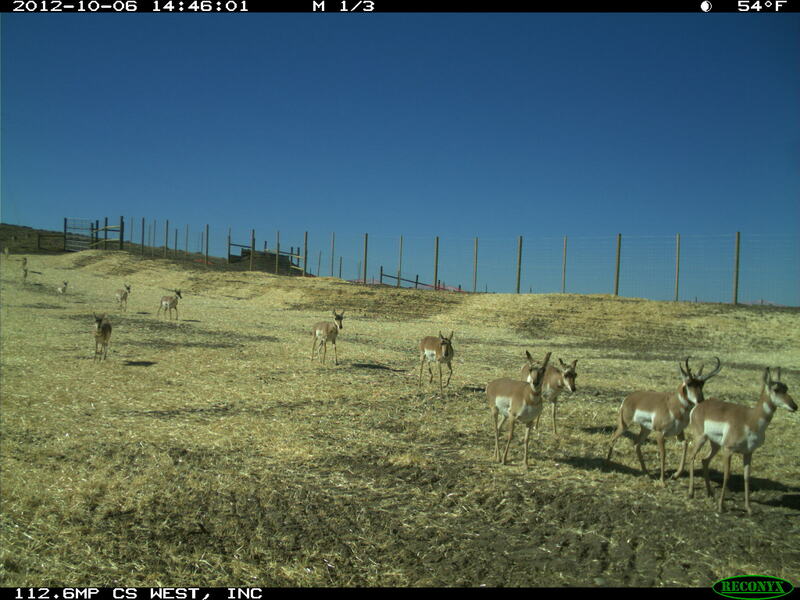 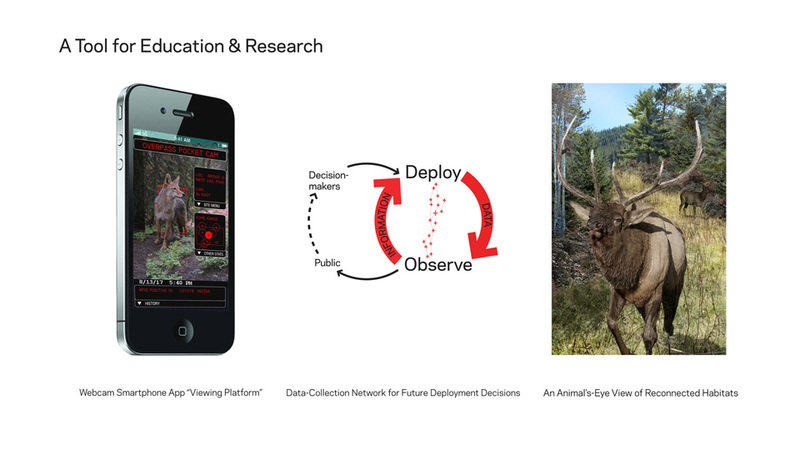 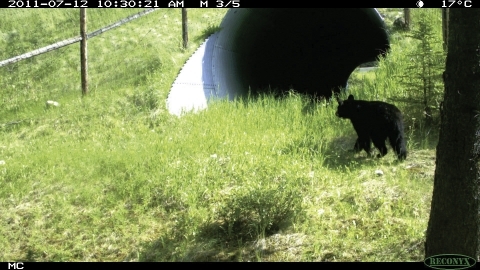 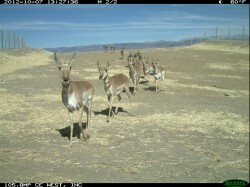 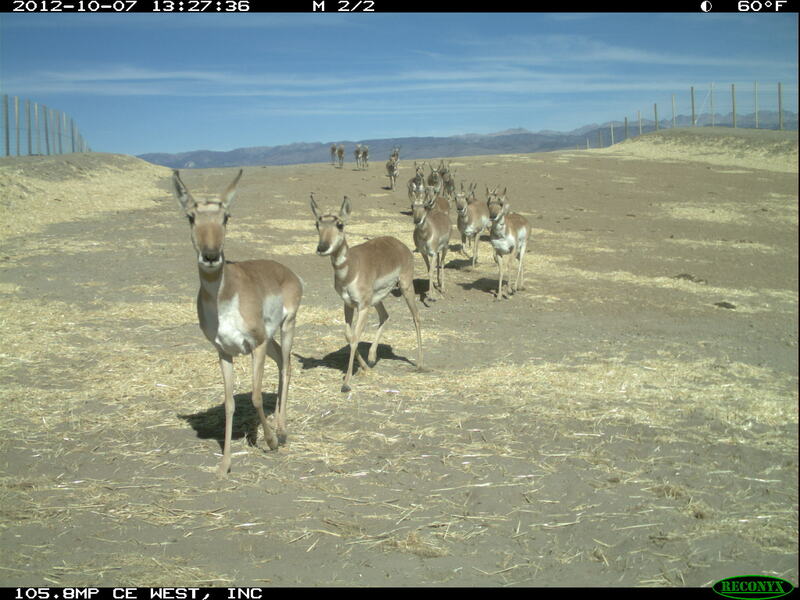 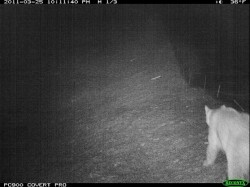 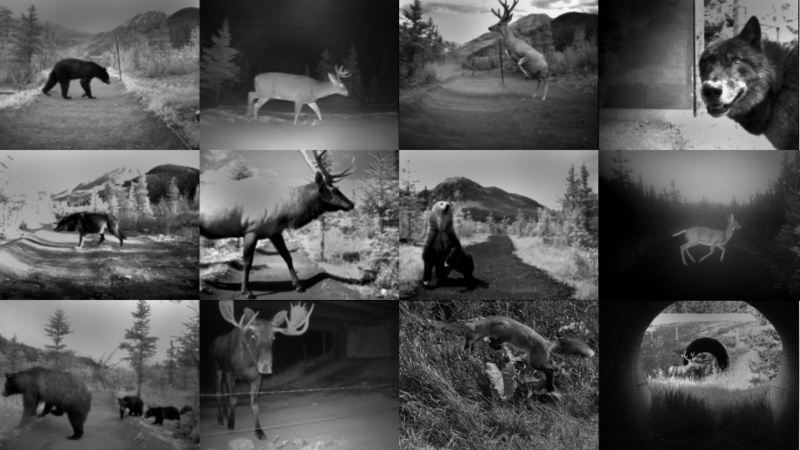 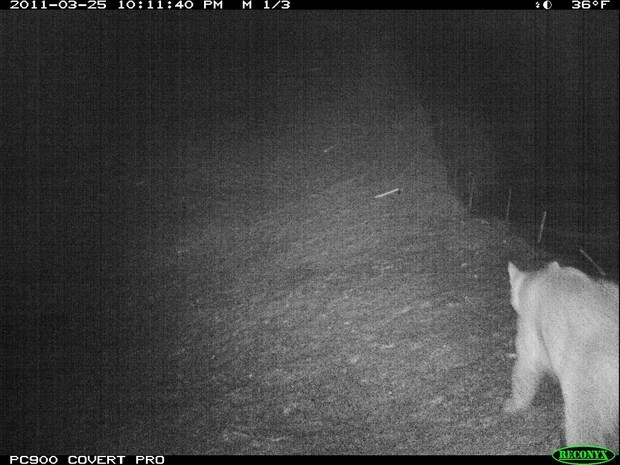 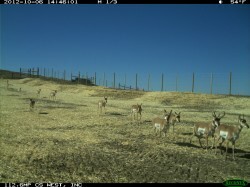 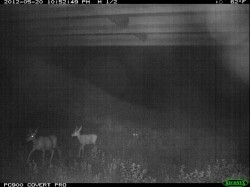 Images captured by research cameras stationed at wildlife crossing structures reveal the diversity of animals frequenting these structures.